Christmas day has passed and as we rush towards the New Year I would like to update you and give you some thoughts for prayer. 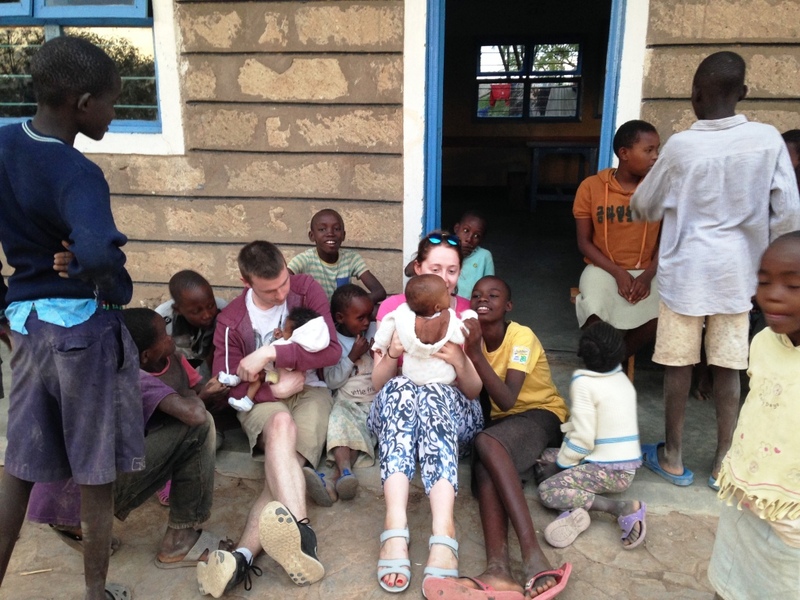 Pamela and Gillian have now been in Kenya since 24th November. During that short 5 week period they have had to deal with many challenges as one might expect in any organisation/family with 125 children and 50+ staff. They can become tired and at times frustrated. Beside the matters coming their way for decisions they are coping with temperatures over 30 degrees and eating a restricted diet. Please hold them in your prayer. The couple I traveled to Mombasa to meet in September with a view to their employment, David and Agnes, visited Ngaremara in early December for a week with two of their three children to meet Pamela and Gillian and to see the work of Kindfund first hand. They engaged deeply with the children and staff at Ngaremara and more than a few tears were shed when the time came for them to leave. I am pleased to report that they will be joining the team in early January 2018 and will be based at Ngaremara. 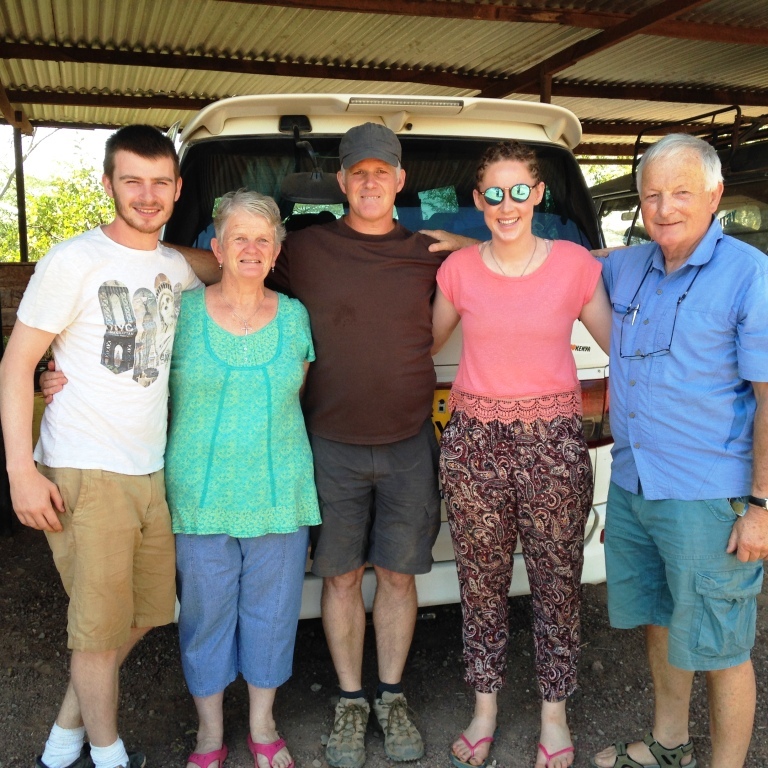 Please pray for them as they prepare to travel the 700kms from Mombasa to Ngaremara, as they sort out their affairs in Mombasa, and as they discover God’s plans for them in the work of Kindfund – they are a gifted couple who have spent 8 yrs in mission with YWAM and who we believe will bring a fresh impetus to the Kindfund family. January is the start of the new school year with its challenges, hopes and disappointments. Please pray for all the children especially those who have reached a change point at the end of Primary and at the end of Secondary. 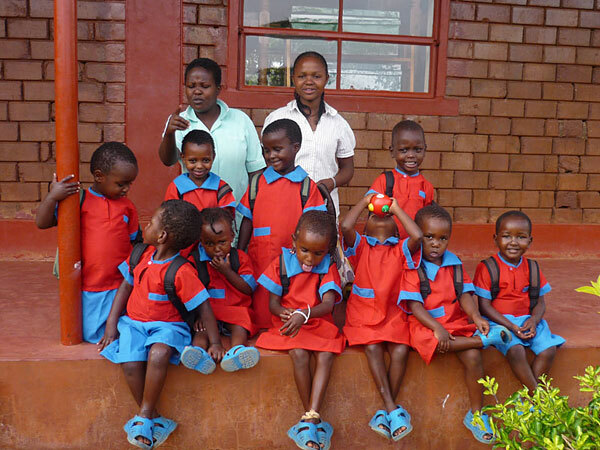 Also remember the work of our own Hope Primary School, the headmistress, Shalline and staff as they prepare for the new term and not forgetting our feeder Nursery Schools at Ngaremara, Wamba and Ndikir. 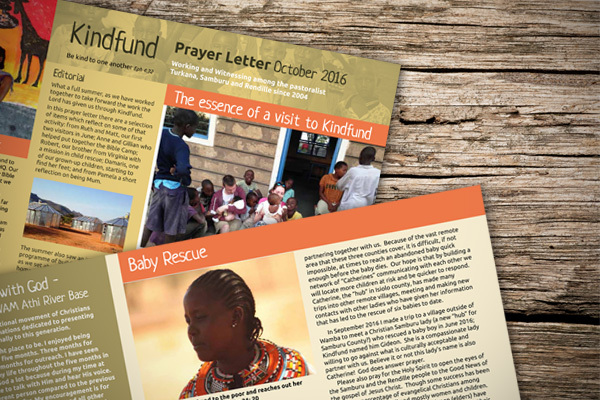 Our October Prayer Letter brings updates on Kindfund news from Honey Hill, Wamba, Ndikir and Ngaremara. If you have any questions after reading, please write to us and we will do our best to answer. Do help us by posting this article on social media – or email it to a friend – using the links below. Thank you! 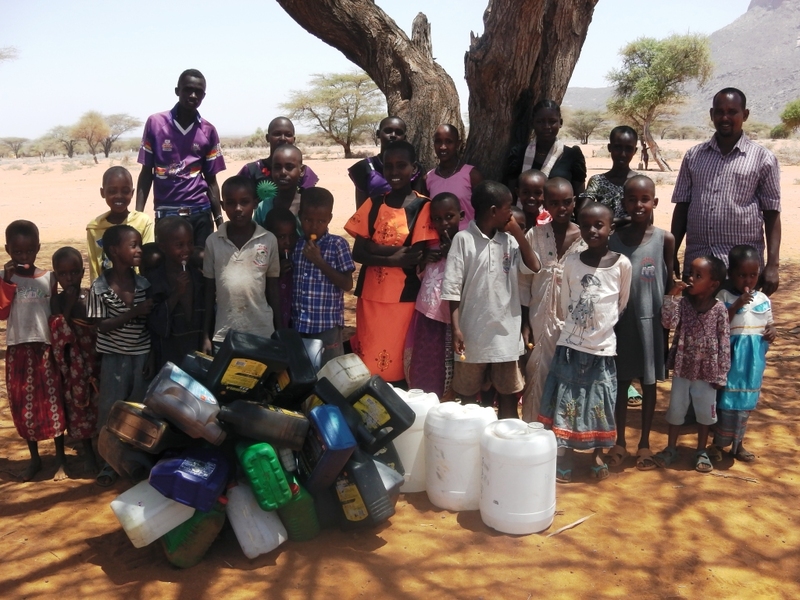 # Water Crises at Wamba - 60 children in danger - Help! 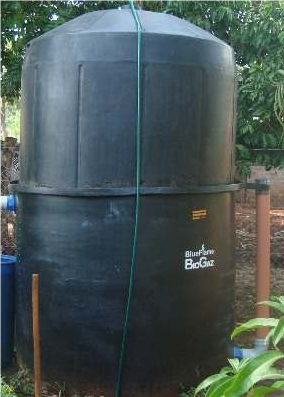 In September Kindfund decided to go ahead with a water harvesting project estimated at just over £6,000. A concrete platform has been laid in the middle of the site and six by 10,000 litre tanks purchased and delivered along with a pump and associated plumbing equipment to facilitate the collection of rain and town water and its subsequent pumping to three by 10,000 litre tanks on a raised platform at the top of the site from where it is distributed. In total there will be storage for 90,000 litres. The impact will be kept under review. Thank you! Your prayers are being answered. Pamela spoke to the Manager, Nzau this morning and they are getting a little water from the town system. They have been visited by the Government and town water officials and they are being supported as well as they are able for the present. Some water at low pressure is coming through and the staff and children have been working our moneymaker foot pump to assist it up into our raised tanks. Please don’t give up continue to pray for the supply and also pray for rain for this area of N Kenya which is on the verge of famine. 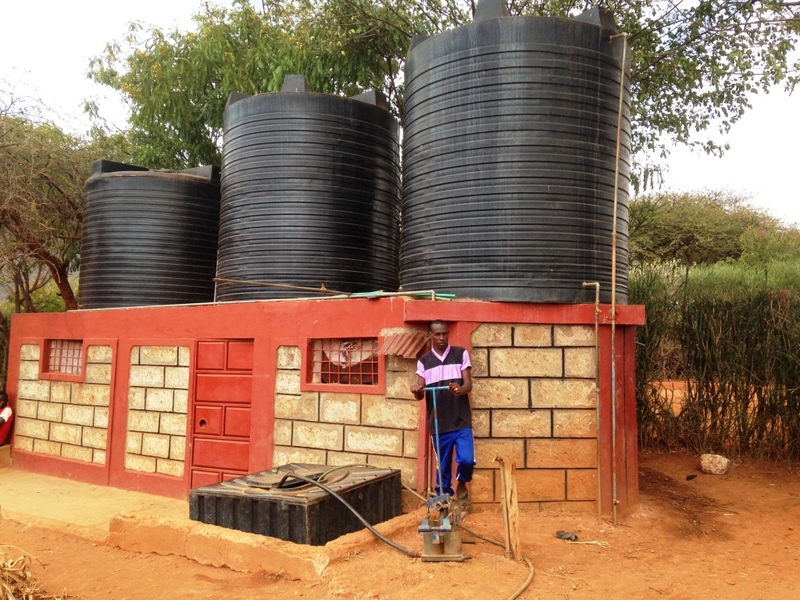 We have been struggling for the past year to keep our home at Wamba supplied with water. We are connected to the town supply and have a buffer of 30,000 litres in the form of three raised 10,000 litre tanks. We have regular meetings with the Town officials and with the Government representatives – District Commissioner and Chiefs of the area. For our part when the supply is turned on and the pressure is low we deploy a Moneymaker foot pump to ensure we maximise the little which comes through. What seemed like just another of the weekly crises escalated today after our manager met with the Water Engineer and Government representatives to be told that there is no supply. 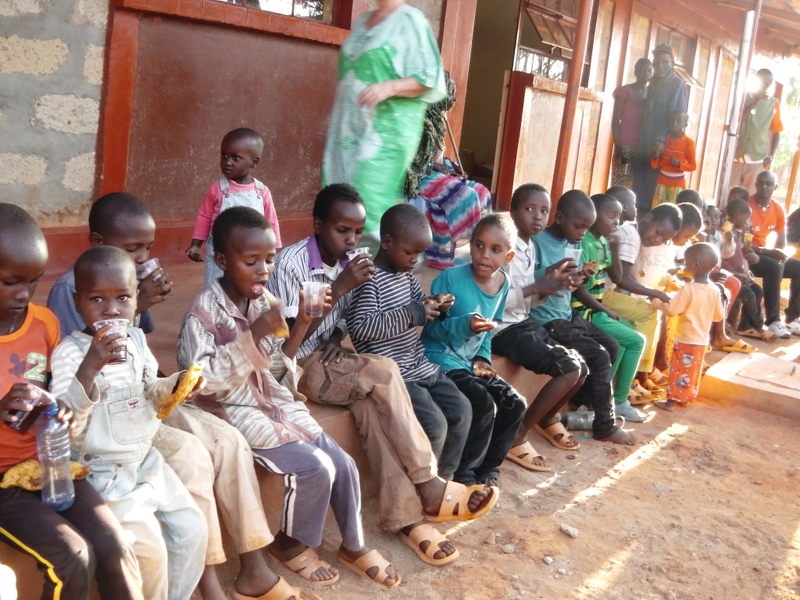 We have over 60 children on the site who need to drink, wash and food has to be cooked not to mention clothes washed. On the slopes of Honey Hill the strong dry winds that herald the onset of the dry season that will last until October roar across the hillside and off into the lowland desert valleys and plains. Inside the temporary sheet metal structures that make up the shelters of Honey Hill Home, doors and windows are closed tight to keep the wind from blowing out the flames of the gas cookers where the children’s foods simmer. The long, slow cooking of meat stocks and vegetables for the children’s special diets requires a lot of fuel. 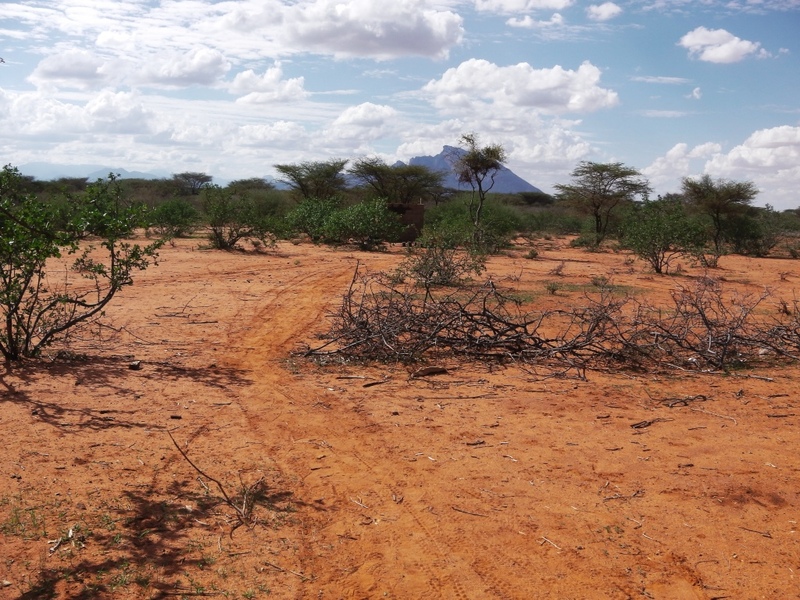 Firewood is scarce to non-existent around all the towns in the north and Marsabit mountain in particular is under great environmental stress. The unique and special rain forest is more and more endangered. Anyone who can afford it uses bottled LPG gas. The price of the gas is high and our usage is also high putting a strain on the budget simply keeping up with the children’s cooking needs. 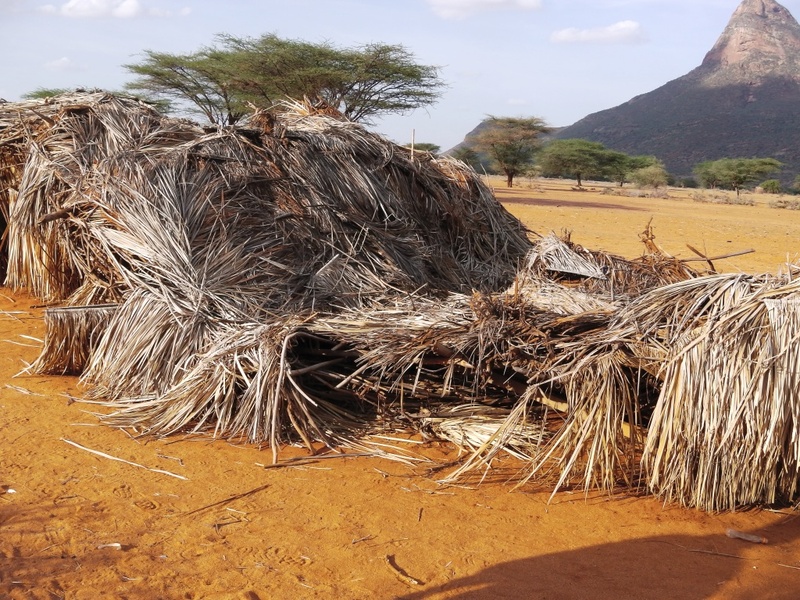 As the home is situated on a the farm where the camels provide reliable milk and the sheep and goats provide the children with meat and milk, a biogas digester would convert the abundant manure into an ideal renewable cooking fuel. This will help manage the mountains of animal waste, enrich vegetable gardens and eliminate the need for any outside fuel for cooking and water heating. At Kentainers, “BlueFlame BioSlurriGaz” a home sized unit costs $950 with a capacity of 6 cubic meters. This will provide at least enough gas to cook all the children’s food with more for other cooking. We currently spend more than $100 a month on LPG gas. There doesn’t appear to be any downside on biogas! Read more in our first Prayer Letter of 2017. We have had a developing relationship with Saab Kenya based at Nanyuki for the last few years. Brian Drummond who heads up the Kenyan team is from Scotland. Around 2 yrs ago Saab donated two large tea chests of baby and children’s clothes to Kindfund and we have since been meeting occasionally to consider how we might take the relationship forward for the benefit of the children. 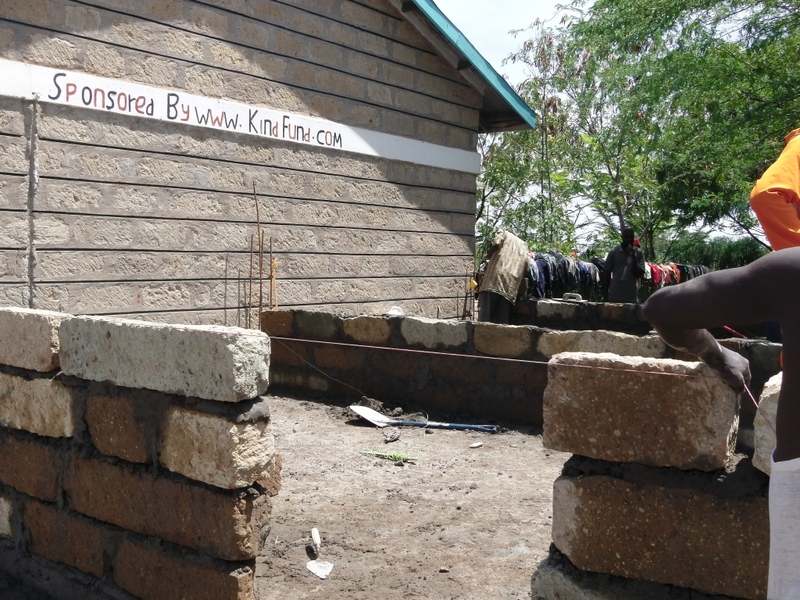 Recently along with Saab Kenya we had a joint meeting with the Helen Crooks Foundation with a view to exploring the feasibility of providing small play parks for the children in our three homes. Andrew and Helen, from Bangor Co Down, crammed a lot of activity into their two weeks at Kindfund. 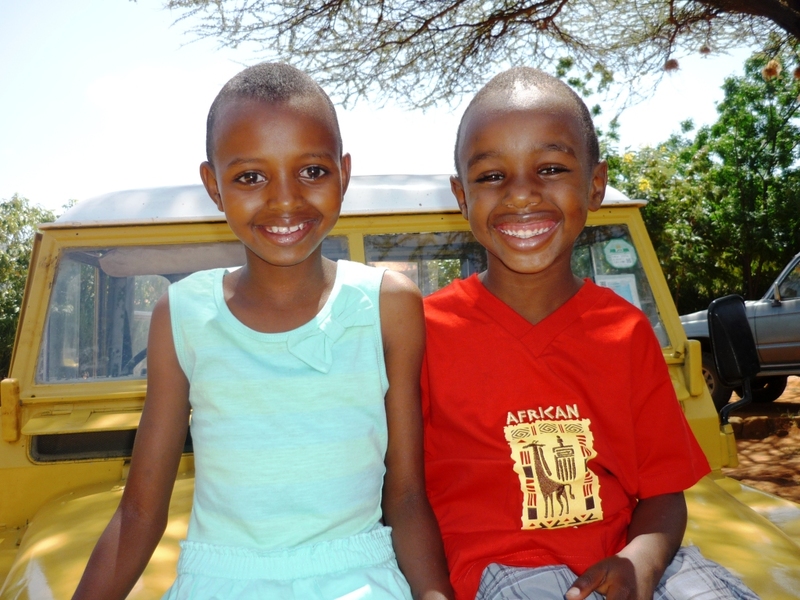 It was their first visit to Kenya and they took to it like the seasoned travellers they are. Andrew quickly found himself on a busman’s holiday when Caroline one of our teenagers with Diabetes took ill. 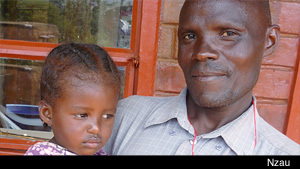 He accompanied her to the District Hospital in Isiolo where she was given treatment. He was surprised to be put on the street at 6pm along with Caroline because the Doctors were on strike and the hospital was closing. 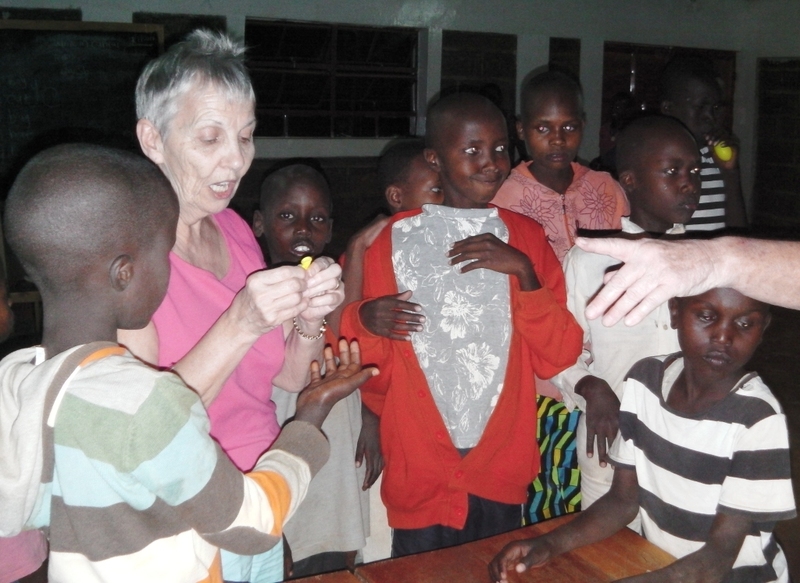 Meanwhile Helen was enjoying the kids playing games and showing them handcrafts. Both enjoyed the break from winter at home and basking in heat as high as 35 at times. It was not all fun and games and Andrew experienced some of the driving on tarmac and rough roads. 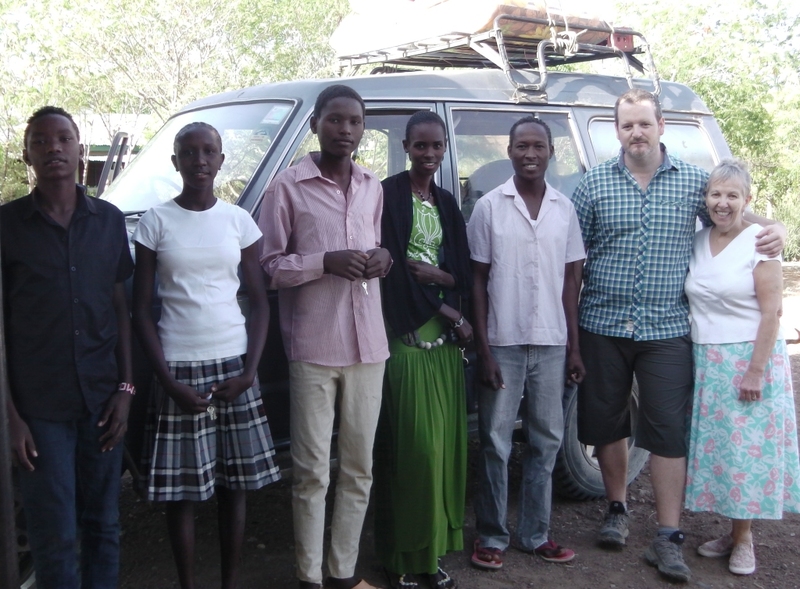 Andrew and Helen took three of our teens to their new Polytech (70kms away) on their first day stopping by at the Uniform shop in Isiolo to purchase all the requirements – something of a Kenyan experience for them. Thank you! Andrew and Helen for your visit. The kids will miss you. The children again are generally well. We have admitted three new children to the Ngaremara home in October. In all cases the mother had died and the children were neglected. This new facility for a few children with severe physical and learning disabilities, requiring 24-hour care is now up and running (see new Web Section on Honey Hill) with two children and some others under consideration. Please pray for the right staff and resources as the Laroche family seek to develop the vision for this unit in conjunction with Kindfund. There is a chronic need for such facilities in what must be the poorest and most remote area of Kenya. Work has continued at Ndikir in our absence to complete the building of the Central Core of the home which is the Classroom/dining room, food preparation area, cooking room (we now need to buy eco-friendly cookers like we have installed in our other 2 homes), shower cubicles, clothes washing and raised water storage for our two 10,000 ltr tanks. 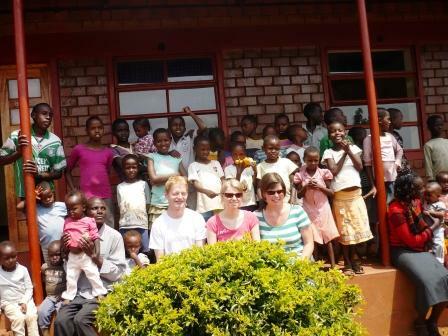 We now have accommodation for 24 children with expansion up to 64 readily achievable as demand builds. The 12 children have remained healthy with a few seasonal colds. Raphael Lucy and family and staff have settled into the new accommodation. 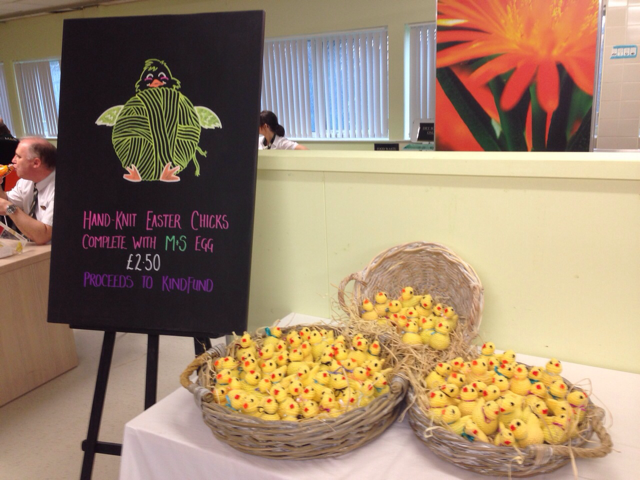 Children and staff doing well and in good health apart from normal seasonal ailments. The four youngest babies 2 to 4 yrs are progressing well with Caleb the youngest at 2 yrs 6 months experimenting with words. Damaris from Ngaremara (fresh from her 5 month YWAM discipleship course) has spent 2 weeks at Wamba sharing bible stories and encouraging the children to grow in their Christian walk. The children again are generally well. We have admitted three new children to the home in October. In all cases the mother had died and the children were being neglected. A brother and sister age 5 and 12 yrs and a boy age 7 yrs. There are a number of other children in need and we ask you to join us in prayer for wisdom for the right course of action in each case. We are still seeking progress with the renewal of our registration of the Ngaremara home as a CCI (Charitable Children’s Institution) but wheels grind slowly. Please pray for speedy progress. Two new babies have been rescued in the past 2 months and they are currently at Oldonyiro. Lack of rain is creating problems at all our homes. Especially at Ngaremara we will need to take decisions on pumping water which is currently manpower dependent. At home in UK and Ireland God has remained faithful through his people supporting the work. He continually surprises us breaking new ground. In Netherlands our representative has submitted an application to have donations to Kindfund recognised by the Government for tax relief. In USA Robert has just returned to Kenya after a 3 week visit to his home Virginia and we are looking forward to catching up with him when we travel to Kenya at the end of the month. Over the winter Ken Pamela and Gillian will be in Kenya and will be joined there in January for short visits by William, Andrew and Helen. It will be a first visit to Kenya by the latter two. Jonathan plans to come out later in February for a month. An exciting placement for one of our grown-up children, leading the annual Bible Camp and a ‘network of Catherines’. 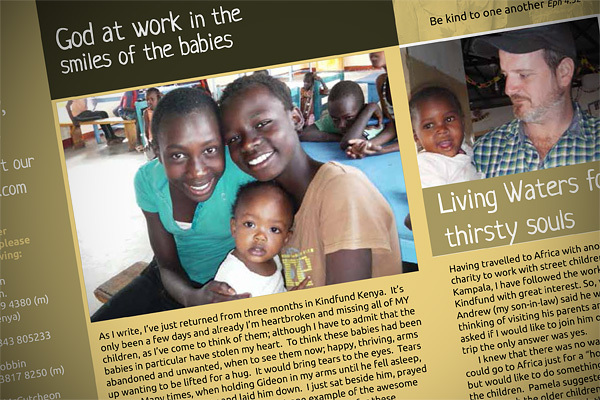 All these stories and more in our latest Prayer Letter! Find out all our most recent news in this latest edition. Wednesday 11th November brought many blessings to our Children’s Home at Ngaremara. At 3pm in the afternoon Robert and Catherine arrived from Oldonyiro and in the car two new babies rescued by them in the previous four weeks. Shortly after their arrival came the long awaited rain which has since been repeated on a number of days. 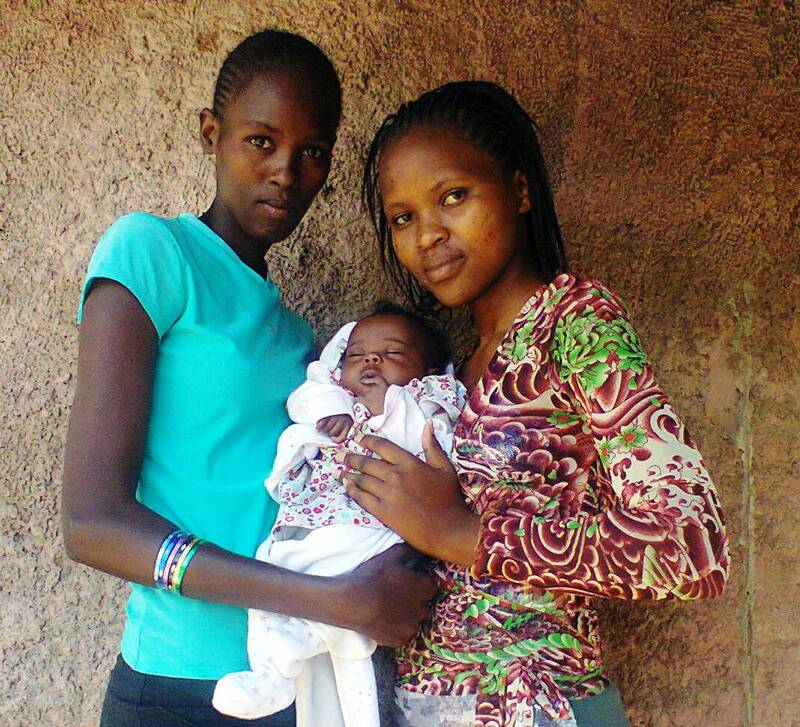 Babies Joy and Diana had been unwanted and their lives were in danger. 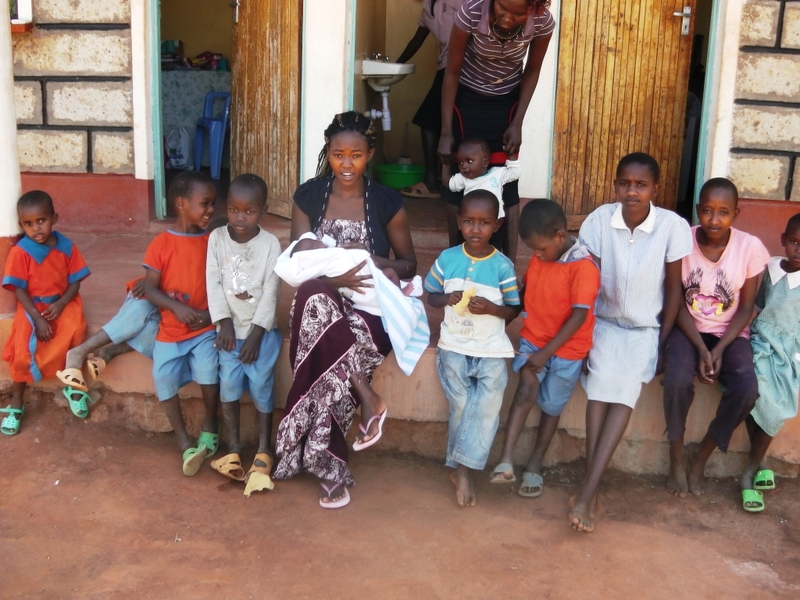 Catherine had brought them under the care of Kindfund and on Wednesday 11th they were safely delivered to Ngaremara into the care of Aris and Esther. 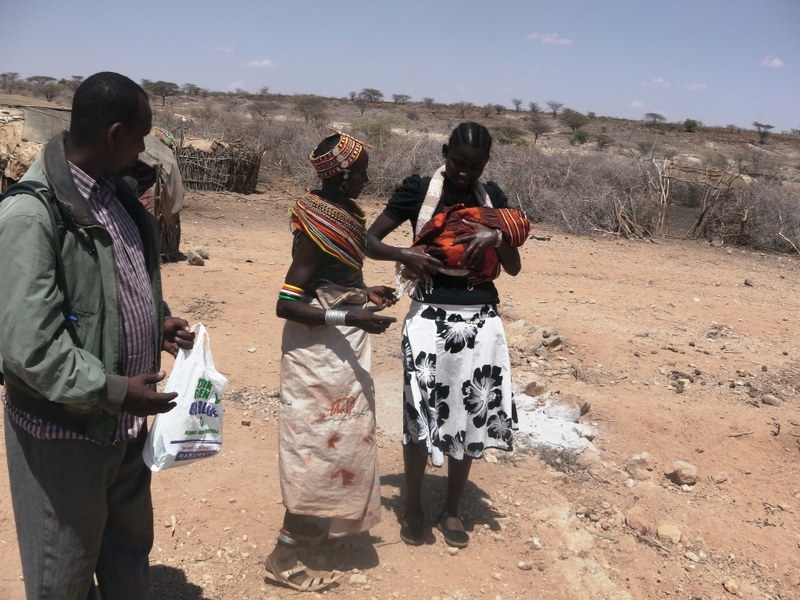 The babies were taken to the hospital baby clinic in Isiolo today, a 40km round trip.They were examined, weighed and vaccinated. Both have added weight since last Tuesday when they were last weighed at a clinic in Oldonyiro. Joy has increased from 3.1 to 3.15 kg while Diana has shown a big increase from 1.6 to 1.9 kg. The improvement in Diana is a particular blessing. 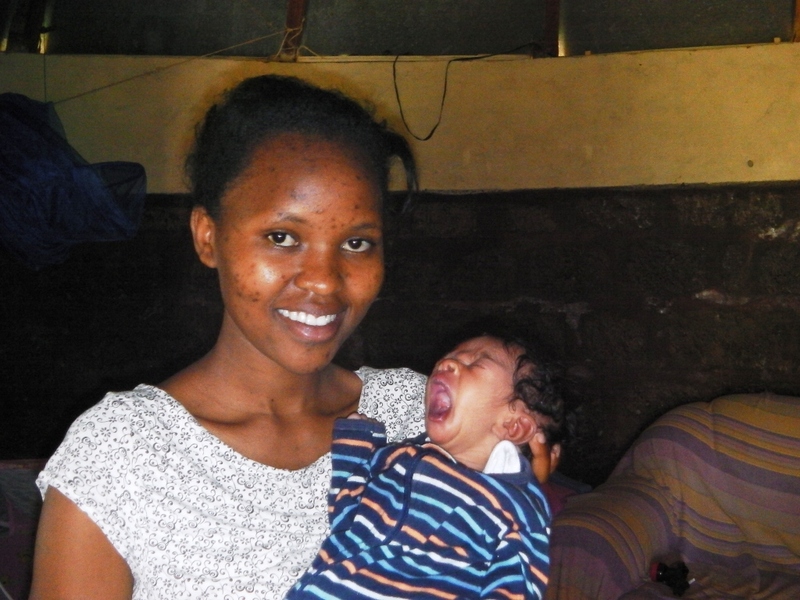 Continue to pray as the nannies at Ngaremara care for the babies. The local clinic at the mission in Ngaremara confirmed today that the babies are continuing to do well and gain weight. Joy is now 3.5kg having increased by 3.5 grams in 9 days and Diana has broken through 2kgs at 2.1 showing another 2 grams in the same period. We thank God for his mercy and for the four young ladies acting as nannies. The girls are continuing to do very well. Every day they improve and their recognition increases. Smiling when they see familiar faces and hear familiar voices. They are a real blessing. 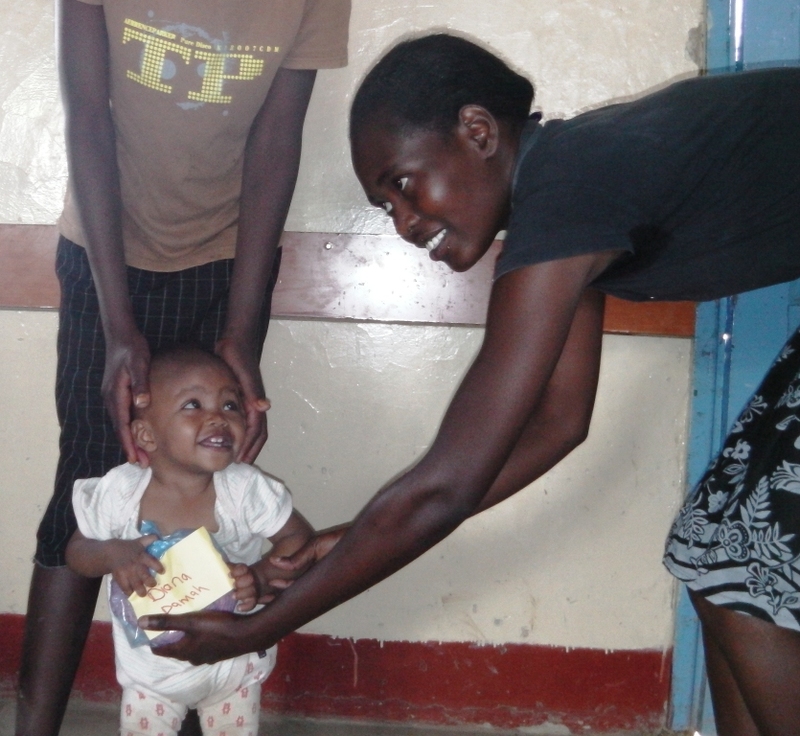 At the clinic today Joy weighed at 3.9kg and Diana at 2.7kg. The nurses are pleased with their progress. Please continue to pray for them and the nannies who are being so devoted. What a blessing. The two girls were joined by a third baby Jonathan born on 1 January 2016. All three babies continue to show healthy growth with the smaller ones rapidly catching up. Today Joy weighed in at 4.6kg, Diana at 4.5kg and Jonathan Alan at 3.1kg. Consumption of baby formula milk has increased with Joy managing one tin of Infacare 2 every 4 days and Diana and Jonathan between them drinking 1 tin of Infacare 1 every 2 days. Diana will join Joy on Infacare 2 later this month. Our three babies were joined by a fourth, Gideon, in June. Good progress continues Joy now 7.54 kgs, Diana 7.28 kgs, Jonathan 6.1 kgs and Gideon 7.82 kgs. Please continue to pray as we hear another has been rescued last week and may come in our direction. 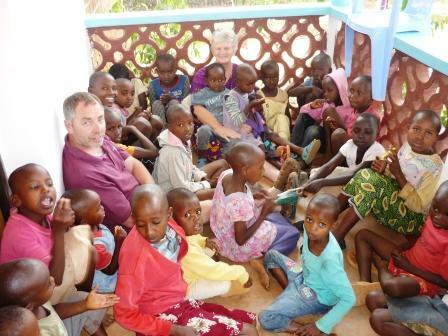 It was now our turn to visit the children in their home and to hopefully leave our mark for the children in Kenya. 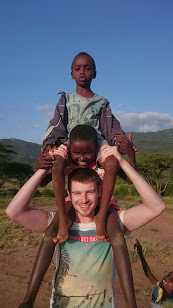 After getting back and settling into reality in Ireland, our time with Kindfund in Kenya feels like a dream! it was amazing to see the impact they left behind, they had inspired many around them with their stories, singing and smiles. 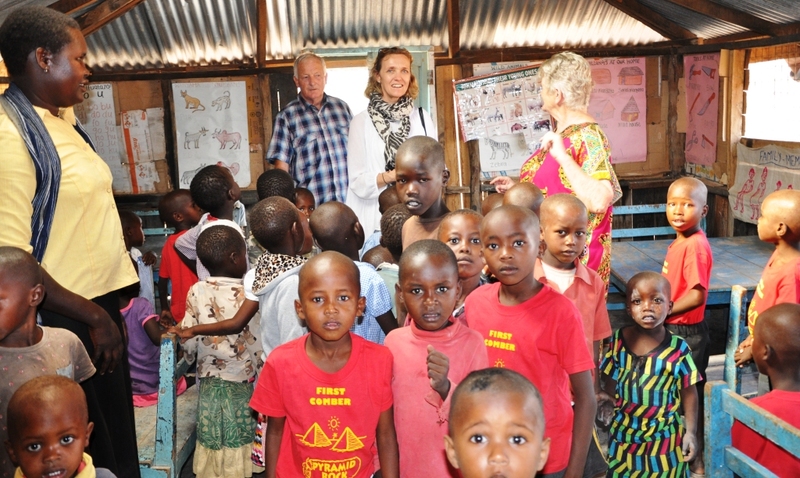 It was now our turn to visit the children in their home and to hopefully leave our mark for the children in Kenya. It was lovely to see the children who had been in N. Ireland and to see how they had grown and to hear their stories of life after the Outreach Programme as well as getting to meet all their siblings and friends whom we had heard so much about. 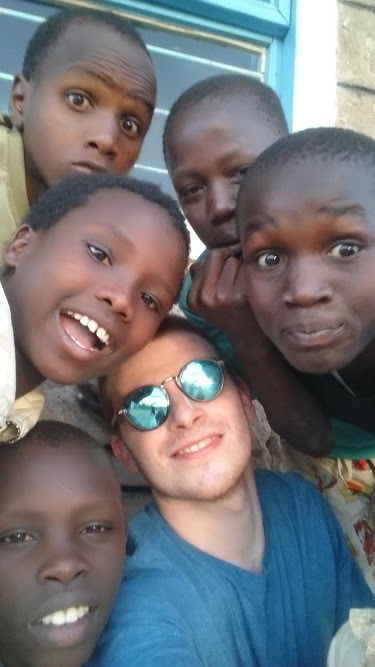 Matt, having just finished his degree in Primary School Teaching in Stranmillis University College in Belfast was excited to meet the new children and to do what he loves doing in a new environment and to learn from the children and the Kindfund School. Neither of us knew what to expect but it was exceptional and better that we ever could have imagined. From the outset we were greeted by a mixture of familiar and new faces along with some heart -warming singing and we were instantly made to feel at home. The children insisted on carrying our bags and showing us to our rooms and this was just the beginning of what they would do for us during our visit. They took the time to introduce themselves and to find out a little about us, inquiring about all the host families they had met and their sponsors. It is hard to imagine the impact any of us can have on one of these children’s lives but the light in their eyes when they spoke of the previous visitors and the host families said it all. It was clear to us both from the first minute we sat down and were surrounded by all of the children at Ngaramara that we would love our time with Kindfund. We spent our first few days getting to know all of the amazing children and hardworking staff. Monday morning and the beginning of our first school week in Kenya quickly arrived and we got the opportunity to meet Dan, the headmaster of the school at Kindfund, and the two teachers who worked in Ngaramara, Stephen and Robert. Our days during that week were spent working with the teachers and getting the opportunity to teach the standard 5, 6 and 7 classes based in Ngaramara. The children were wonderfully welcoming and extremely passionate about their studies, they even had to be persuaded to leave the classrooms during their midterm break (children at home could learn a lot from them)! We spent our evenings playing with, getting to know and entertaining the children. They learned some new songs and games, even some Irish dancing. While we learned some Swahili and a number of interesting Samburu dances, with varying degrees of success! Ruth was even invited by the staff and children to help prepare dinner for everyone at the Ngaramara home, which was certainly no small task. Our first week came to a close with a seminar, taken by Matt, with all of the teaching staff from Ngaramara and Wamba. 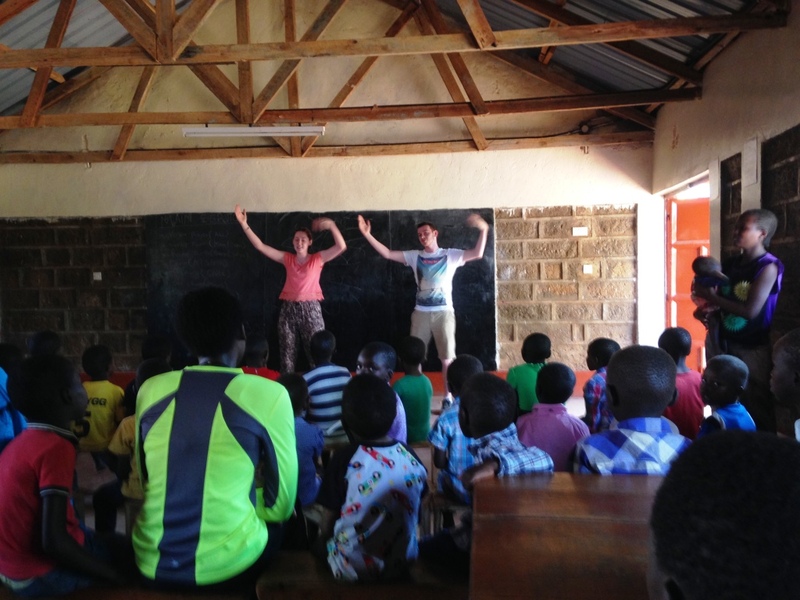 Here we were introduced to Felix and Grace, the two teachers working at the Wamba home. The seminar focused on all the progress made by the teaching staff and Dan as headmaster so far and we discussed how we could further progress the school, to improve the pupils’ experience and success. Our trip to Wamba was made via a road unlike anything either of us had experienced before. Wamba was an equally amazing but completely different experience. The younger children at Wamba, some of whom have been at Kindfund since the first few days of their lives, were unimaginably loving and caring. They provided constant entertainment and were a source of love and laughs throughout our time there. We also had the opportunity to spend time with the four girls in standard 8 of primary school during their half term break. The girls were extremely generous with their time off, showing us around Wamba, helping us gather groceries in town and even taking us on an adventure up a mountain where we experienced some of the most breath-taking views imaginable, before we were caught in a heavy rain and had to run back to the home! During the school day with the standard 1, 2, 3 and 4 classes, we worked with Felix and Grace to implement some of the changes we had discussed at the previous week’s seminar to a great deal of success, shown in the huge overall improvements in all the school children’s’ midterm exam results. 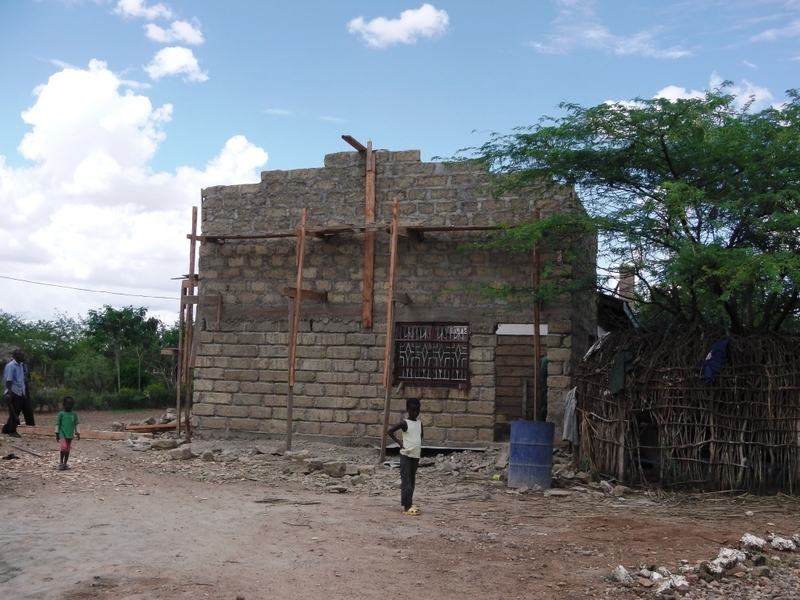 We even got to visit the home at Rendille to see the ongoing construction that looked to be creating an amazing site. After some emotional goodbyes at Wamba, we headed back to Ngaramara for our last few days with the children there, with just enough time to squeeze in a very successful trip to see elephants, giraffes and other animals in the Samburu park. After some more very emotional goodbyes at Ngaramara, our journey at Kindfund ended and our journey home began. Our visit to Kindfund was an experience that neither of us will ever forget. We want to say a huge thank you to everyone involved with the charity. Firstly to all those who fundraise and spread awareness of Kindfund. Trust us, your thoughts, prayers, donations and support are very much appreciated and really do fantastic things for those who need them most. 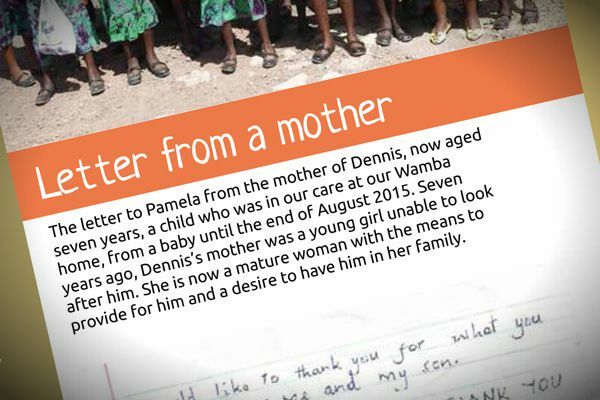 Pamela told us ‘what these children really need is to be loved’, so please continue to love them with all your heart. Secondly to all of the staff at Kindfund- you welcomed us with open arms and showed us the way throughout our time there. 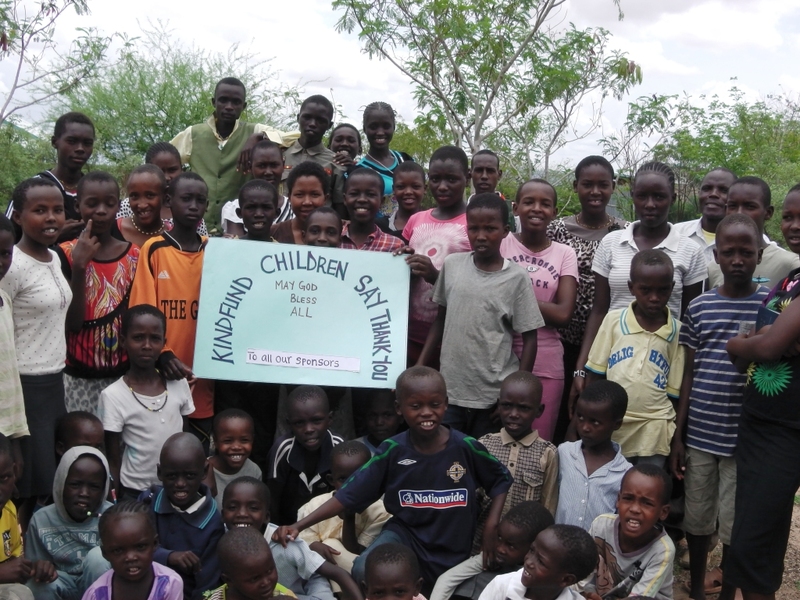 Thirdly to all the children in all of the homes at Kindfund. We may only have spent a small amount of time with each of you in our short time in Kenya but you will forever be in our hearts and minds and don’t forget to keep your promises to write to us. We hope we will see you again soon. Lastly to Ken, Pamela and Jonathan, we cannot thank you enough for allowing us to come and be part of these amazing homes that you have built. It was clear from the beginning that you put all your hearts and souls into everything that has been done in Ngaramara, Wamba and Rendille. The experiences we had during our visit will stay with us forever and we look forward to seeing you very soon! 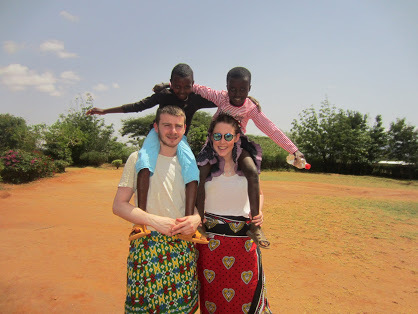 We have just said goodbye to Matt and Ruth after three very worthwhile weeks at Kindfund Kenya where they made a brilliant contribution to the work – sharing, teaching, playing, contributing and enjoying the children. A few wet eyes were to be seen as they set off to return to N Ireland. 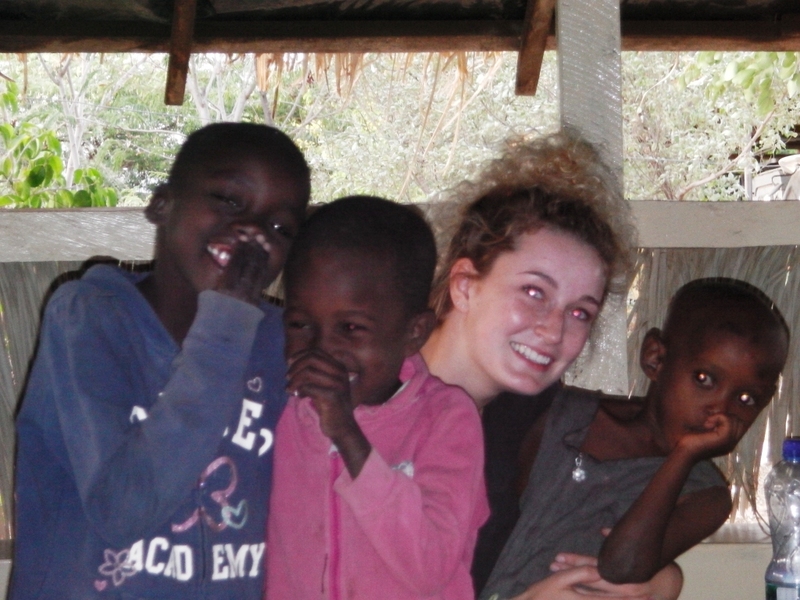 Ruth met some of the children she had hosted in her home as well as others she remembered from the 2014 outreach by 24 Kindfund children to N Ireland. An early introduction to the babies at Ngaremara and football and other activities with the older children there was followed by more fun and games at Wamba as well as some serious inputs. 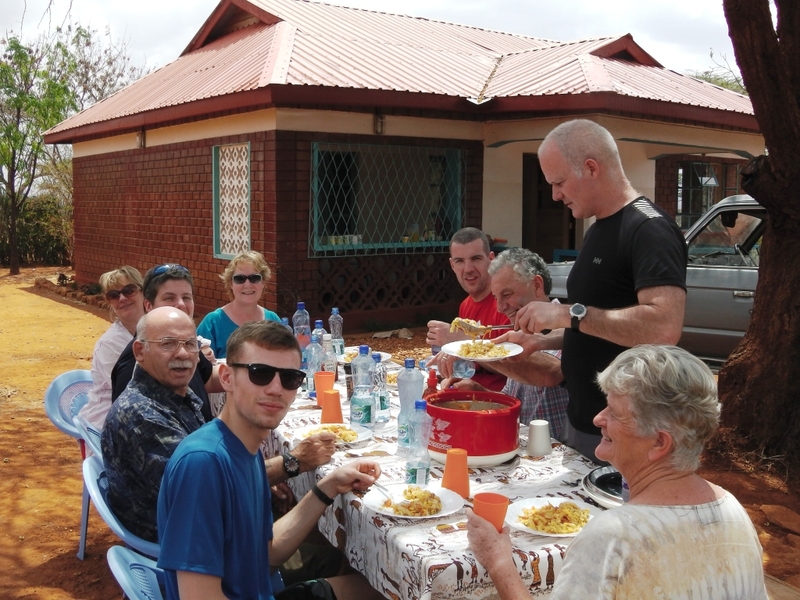 Their visit was rounded off by a quick visit North to Ndikir where work was progressing with the children’s home and a quick visit to the Safari Park behind Ngaremara where a variety of wild life was enjoyed. Our June Prayer Letter is packed with updates on Baby Rescue, Kindfund Private School, our upcoming Summer Bible Camp and so much more! 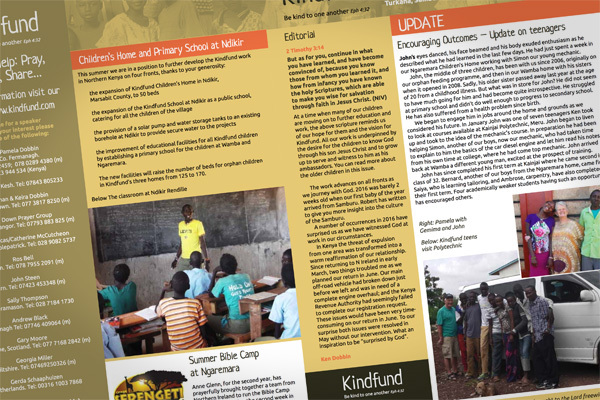 Catch up on what has been a busy six months at Kindfund…with lots more on the horizon too! Plus, this breaking news for our USA supporters: you can now benefit from a tax deductible receipt when using the ‘USA Donors’ option on our How to Help page. This was our Glory our first baby at Wamba. How could she possibly do well in this situation? Look at the photograph of Glory and Moses sitting on the bonnet of our pick-up. Can you imagine Glory just gone into P2 (class 2) at primary being surrounded by 109 other children, cramped on too few desks and with one teacher – sometimes absent? The reality of Kenyan public primary education hit us like a bolt in February this year. This was our Glory our first baby at Wamba. How could she possibly do well in this situation? All our input in her life to date was in danger of being negated. As we reflected on this, and the situation of our other 57 children in the primary system, we began to appreciate why a number of our middle ability children were beginning to show signs of poor behaviour. We had to do something radical. It is not that we had been doing nothing. We had tutors helping with studies at night, although with a 5.30 am start the brains were exhausted in the evenings. We had supported two of the local primary schools with a classroom assistant but this was a drop in the bucket. 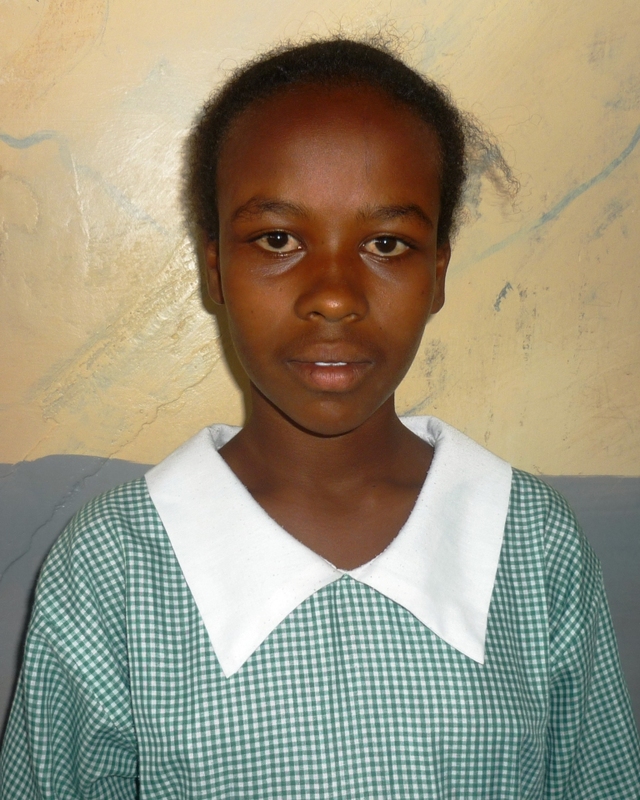 In October last we had sent 4 of our P7 girls to a private school at Wamba having sent 2 up from Ngaremara. The teachers strike had been on for 4 weeks and these girls would be sitting their end of primary exam in October 2016. We could not leave them to the mercy of the system. 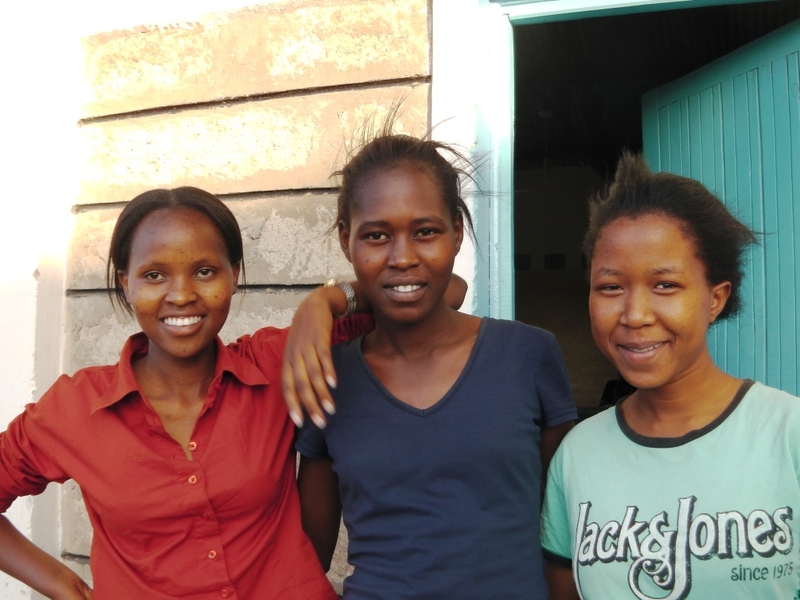 By February this year the change in those 4 girls could be seen clearly and within a month their term exam results had shown a 25% improvement. However, it was their disposition, self-esteem, deportment and ability to hold a conversation in English which impressed and contrasted with some of our other kids who at the extreme were starting to play truant. We had the accommodation in classrooms at *Wamba and Ngaremara. Only running costs to consider (teachers, books, furniture, computers etc). Our Board when they considered the problem on 9th April wholeheartedly agreed that a Private School was the answer so at the beginning of second term in May we have a two campus private school in operation. Classes 1 to 4 at Wamba and 5 to 7 at Ngaremara (we have not disrupted the 4 girls in Std 8 keeping them at an independent private school in Wamba). The children have gone boarding as the younger ones at Ngaremara moved to Wamba and the older at Wamba moved to Ngaremara for term time. We were fortunate to be able to recruit a young qualified teacher to manage the school and 4 Secondary School leavers who have the qualifications to go on to teacher training giving us a pupil teacher ratio of 14:1. Each teacher will be responsible for two very small classes which will share a large classroom. We need your prayers and we need your help to make a success of this. If you are prompted in any way to help please get in touch. 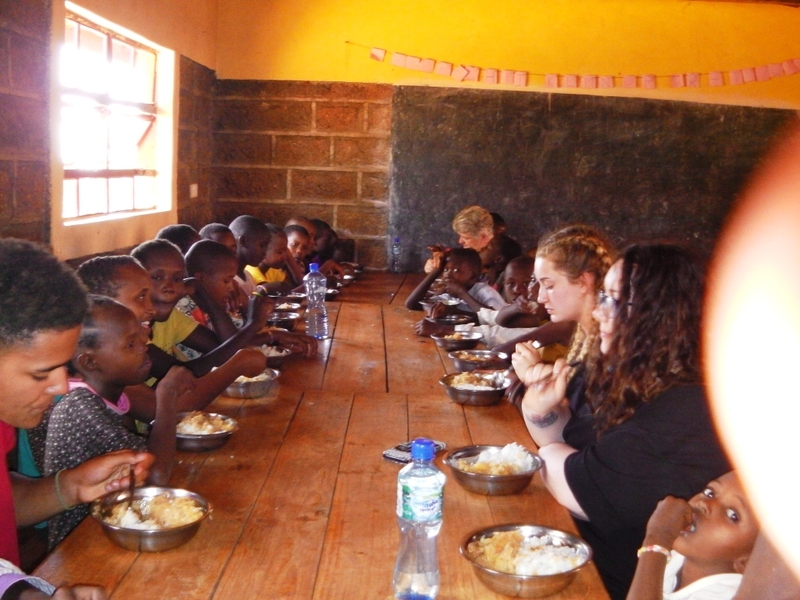 We have a newly qualified teacher from N Ireland going out in June for 3 weeks and several of the teachers who have previously visited us in Kenya and who met the children in 2014 have expressed an interest in helping. Whether a teacher or not hold this in your prayer and consider if you would like to help financially. Recently, while attending Sunday worship in a Samburu village, I once again was struck by the sad reality that there were no men, young or old, in attendance! Where are the men and why don’t they come to church with the women and children? One reason is because they are out tending to their animals; cattle, sheep, goats, and camels. During the dry seasons and in times of drought they will travel many kilometers away from their families in search of water and pasture. Another reason why they don’t attend church has to do with them wanting to preserve their traditions. Many Samburu men, both young and old, see Christianity as the “white man’s religion” and a threat to their traditions and their way of life. 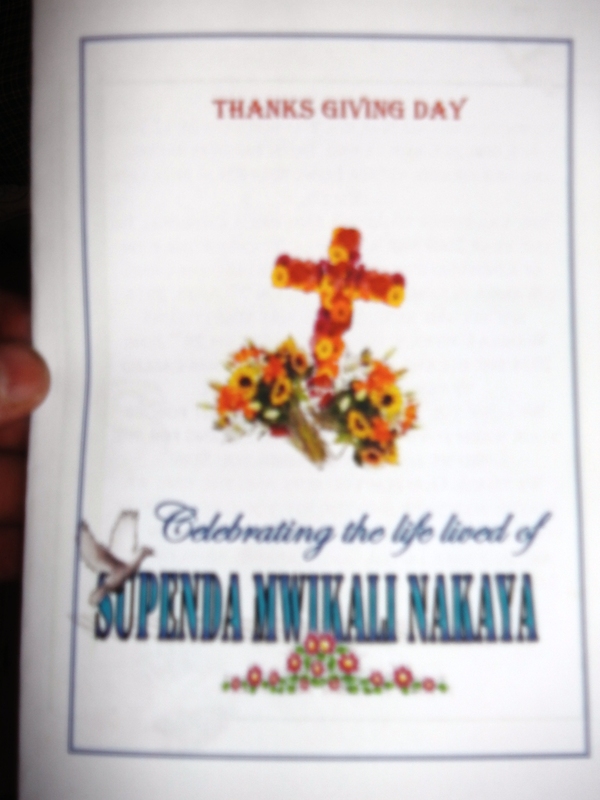 In other words, in their minds, to be a Christian is to stop being Samburu. 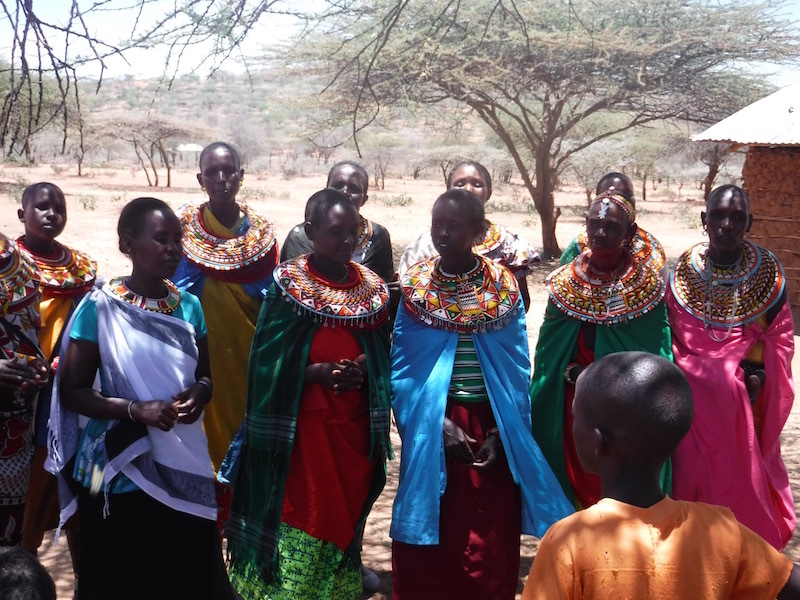 Daily living for Samburu women in desert-like conditions is tough. They live in small huts framed by twigs and plastered with a mixture of cow dung and mud. Samburu women shoulder the responsibility for most of the domestic chores including tending to the children, fetching water, washing clothes, cooking, cleaning, collecting firewood, and building their homes. All this they do and more while under the constant threat of recurrent drought and increasing insecurity due to cattle rustling. Samburu women are also the victims of various forms of harmful traditional practices including forced early childhood marriage, FGM (circumcision), and “Beading” in which a very young girl is given beads by a moran (warrior) as a symbol of their “engagement” for sexual purposes only. The tradition of beading frequently leads to cruel forceful abortions or to newborn babies being abandoned. As an outsider observing their world, I see how tough life is for the Samburu; especially for the women. I think about the physical and emotional pain they must suffer due to harmful traditional practices and I wonder if it is for these reasons that they are more drawn to Jesus Christ and the Gospel than are the men. So often when life is hard and appears to be hopeless God lovingly draws us to Himself giving us hope and peace. Jesus says, “Come to me, all who labor and are heavy laden, and I will give you rest.” Matthew 11:28. 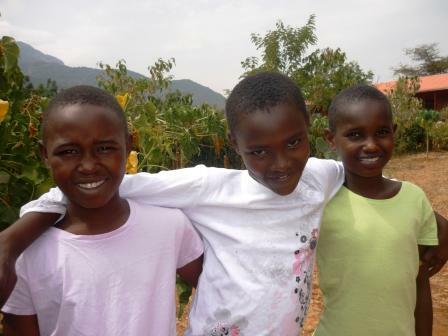 I praise God for my Samburu sisters. Please pray with me for the men, the warriors and the elders, that they too will become followers of Jesus Christ, the God of hope and peace. Then, perhaps, there would no longer be a need to rescue babies! 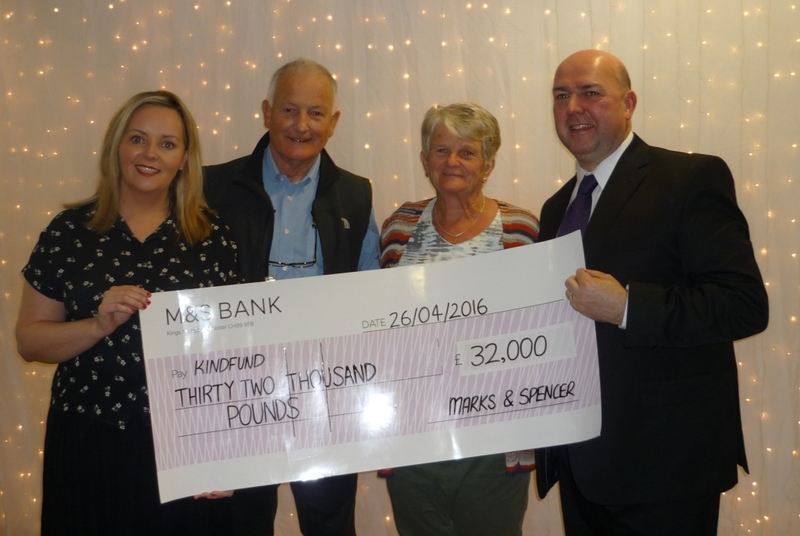 Ken and Pamela accepted on behalf of Kindfund a very generous cheque from Marks and Spencer Staff at Sprucefield on Tuesday 26th April 2016 presented by Patrice and Stephen, managers at M&S. The funds had been raised through a whole range of activities over the last 18 months. 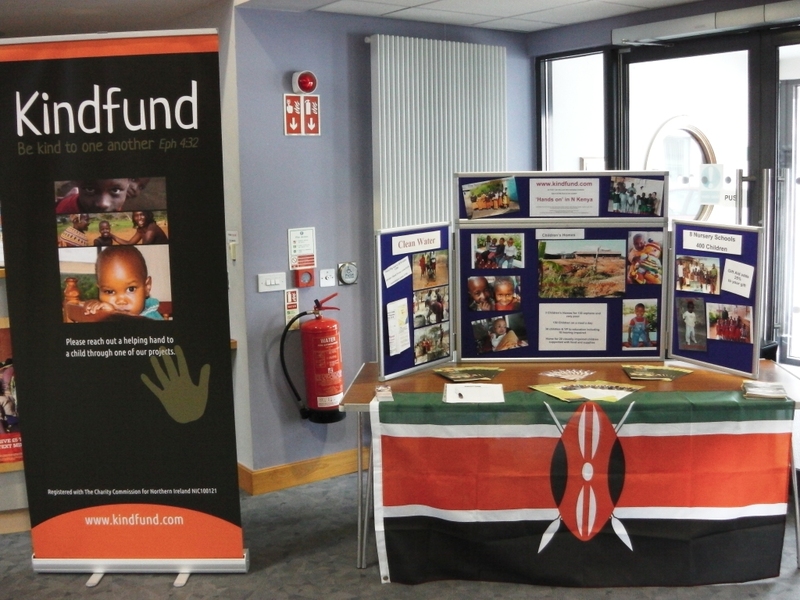 Inspiration for the fundraising and the desire to ‘do something’ was triggered by the visit of the Kindfund Children from Kenya in September/October 2014. Stephen Hilliard a manager at M&S Sprucefield along with his wife Paula hosted two of the children as part of the Kindfund Lisburn team who invested three memorable days with the 26 visiting children and staff. The funds will take the Kindfund work in Northern Kenya forward on four fronts – the further development of Kindfund Children’s Home at Ndikir in Marsabit County, to 50 beds; the expansion of the Kindfund School at Ndikir as a public school catering for all the children of the village; the provision of a solar pump and water storage tanks to an existing borehole at Ndikir to provide secure water to the projects, and the improvement of the educational facilities for the children of Kindfund. 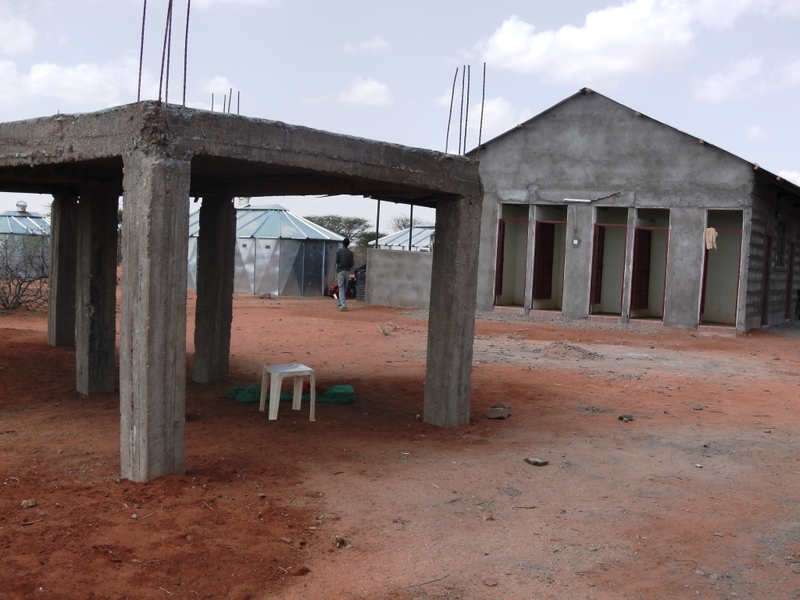 The new facilities will bring to 170 the number of beds for orphan children in Kindfund’s three homes which currently provide for 125 children. The first rescue of 2016 happened immediately in the new year when Catherine was informed of another baby at risk outside Oldonyiro. 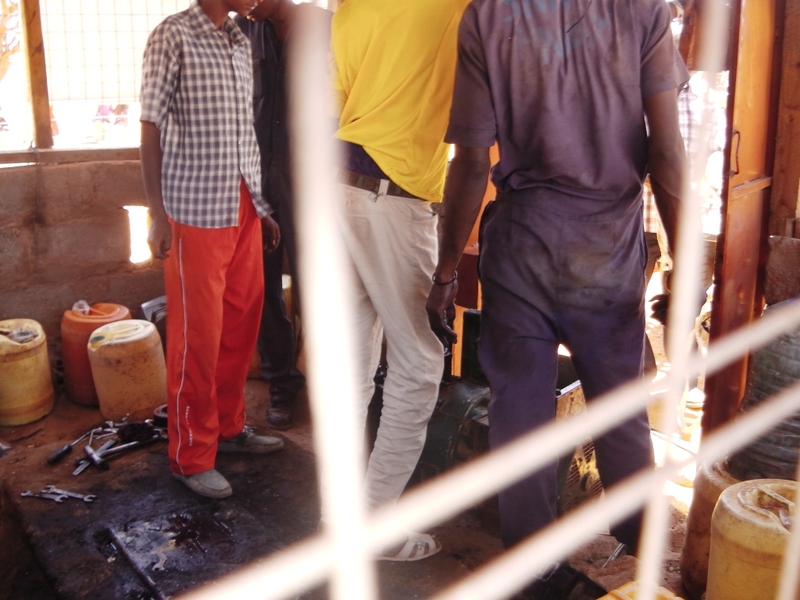 On 18th Robert drove to Nanyuki to meet Jonathan, who had taken the matatu from Isiolo, and both of them journeyed to Oldonyiro to collect the baby and meet the police and the Chief of the area. There was heavy rain during the night so the journey on Tuesday from Oldonyiro to Ngaremara via Kipsing and Isiolo, 120 kms was at times quite treacherous. 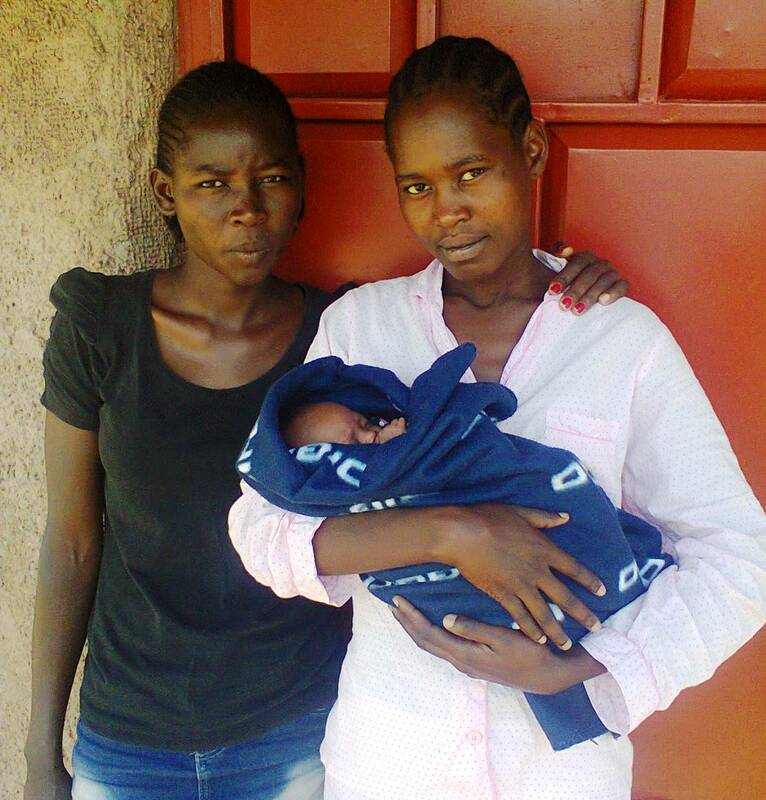 We thank God they arrived safely at 4pm along with Catherine and her daughter Doris. Baby J A had weighed in at the clinic at 2.1kgs, had coped with the journey well and was soon in the arms of Esther enjoying a bottle of formula milk. Here a few days later he is well settled and in the nursery with Joy and Diana now 3 months. All three are doing well and the three nannies now have a baby each to manage along with other duties. 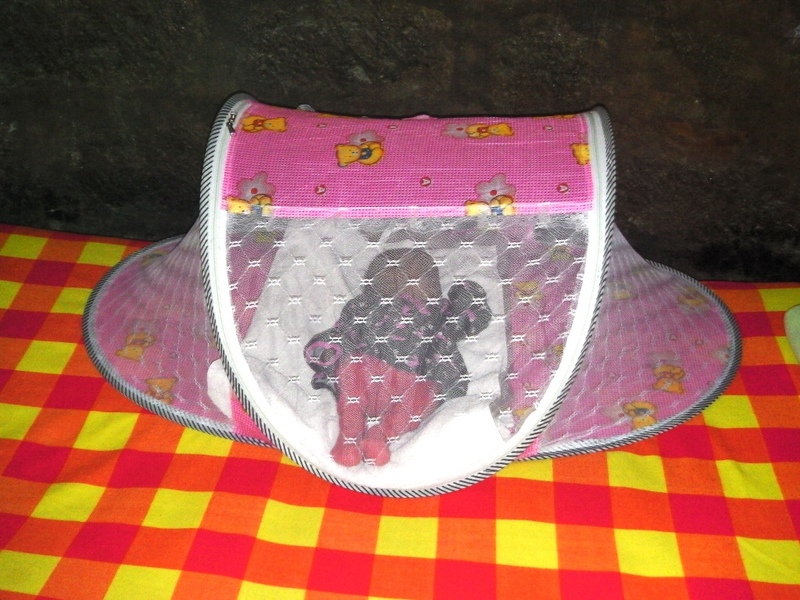 The babies have their own mosquito proof tent and are are being very well cared for. 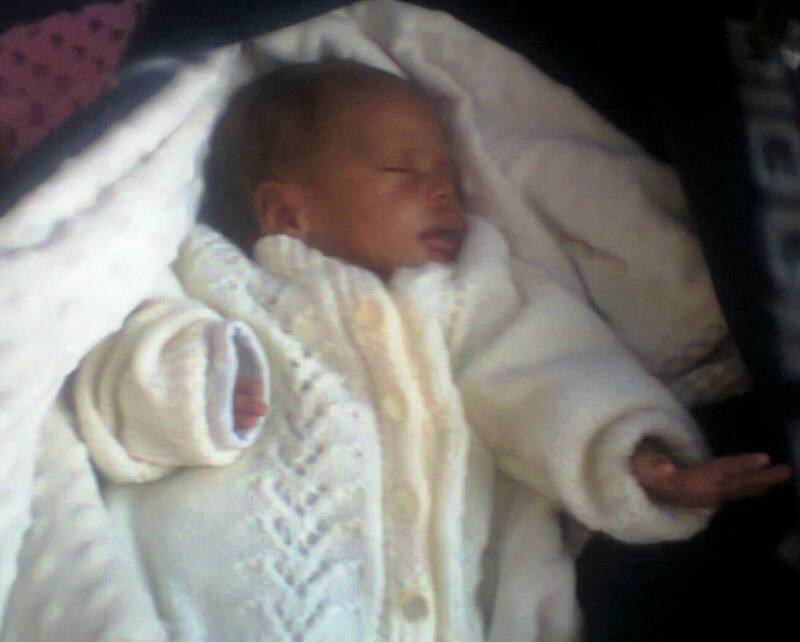 If you feel you would like to help with this work rescuing babies from death please visit our How to Help page. Ken and Dominic set off early with 7 teens from Kindfund homes Ngaremara and Wamba on Tue 19th January to visit a Polytechnic 57 kms away in Meru District. Along with Jonathan we had had a good meeting with these teens on Sunday evening explaining the options open to them and our desire that they individually discovered God’s plans for their lives. The college delivers 12 different practical courses and it was good to see the facilities, meet the lecturers and understand what exactly was being offered including certificates at the end of the 2 year courses. The teens also had an opportunity to meet yr 2 students especially Bernadetta who had worked for a year with Kindfund before commencing her course there last year. She fielded many questions and all enjoyed meeting. The College seemed a caring environment and had most of the basic equipment for the various courses. This may be an area we can help them with as our relationship develops. 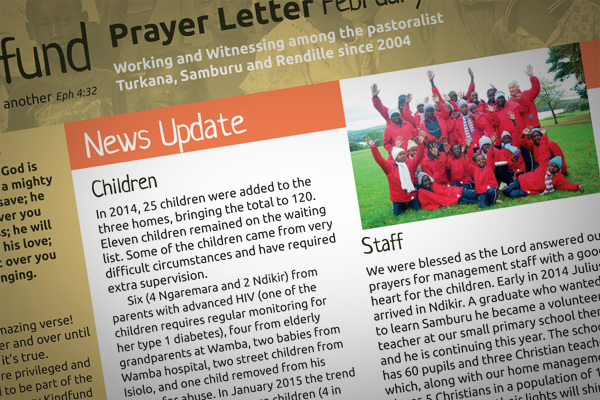 As a very busy 2015 draws to a close it’s time to publish our December Prayer Letter. We hope you enjoy this round-up of our most recent news! 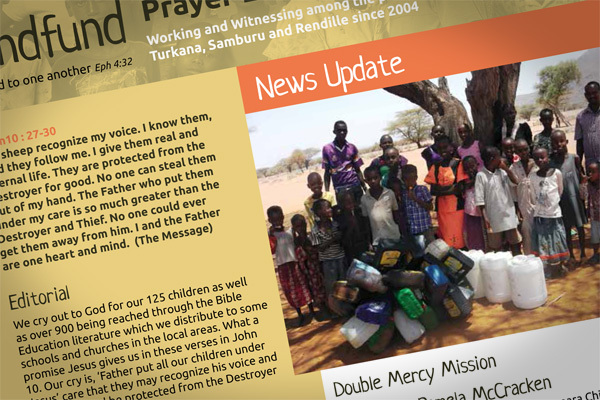 Catch up on all our news with the October edition of the Prayer Letter. On 5th July I began a six week visit to Kindfund. I had visited previously in 2014 and spent time with the children during the outreach tour the same year. After keeping in touch with the children I was extremely excited to see them again. The children, trainees and staff at Kindfund were again a blessing to me over my visit. They have a beautiful way of gently guiding you to ‘un-become’ everything that isn’t really you so that you can be the person God intended you to be. 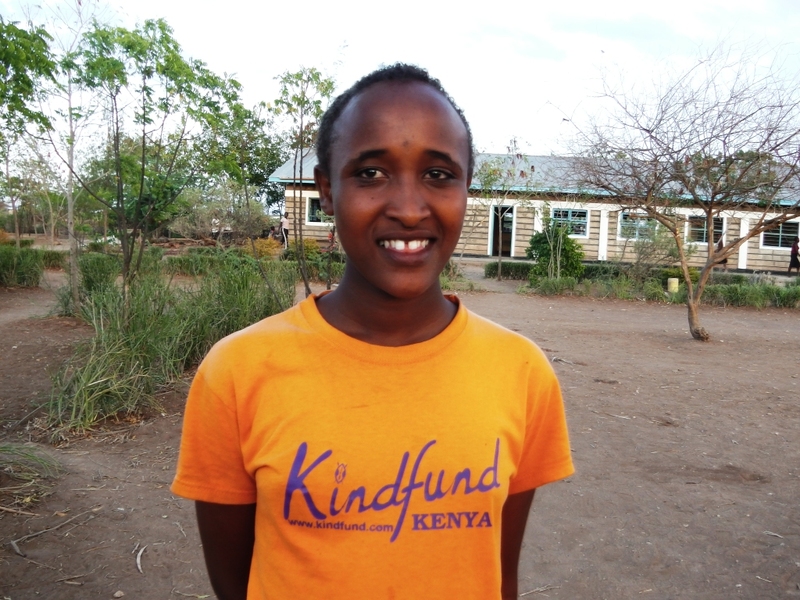 My time at Kindfund was divided between Ngaremara and Wamba. 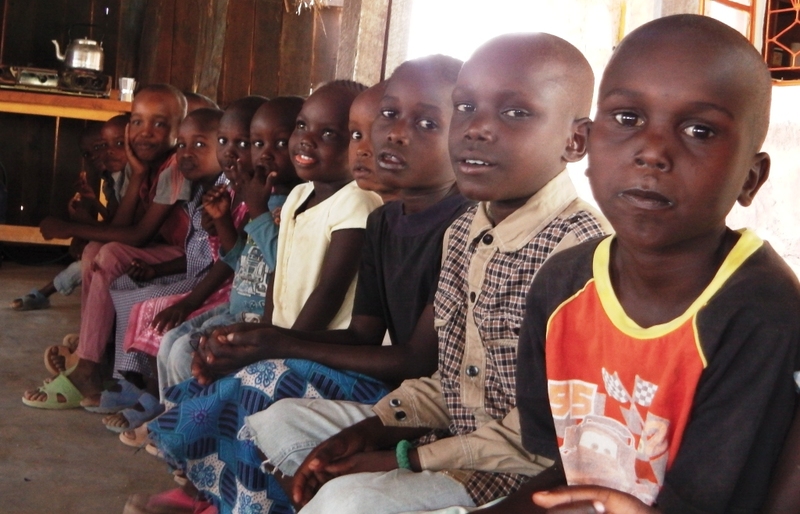 At Wamba I was privileged to be able to teach English at the Primary school. It was inspiring to experience the children’s drive to achieve. They appreciated being there. 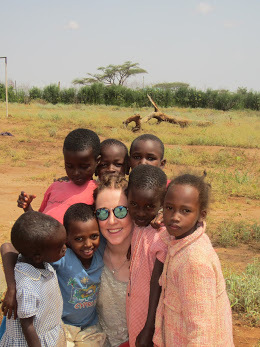 The Kindfund children were all very sweet and caring looking after me as their classmates gathered around excitedly trying to see the visiting Madam. At the home in Wamba I enjoyed painting a mural in the girl’s dormitory and organising sports activities. I had prepared a sports day involving team relays as the children were to be split into teams/crews for the “Everest” bible camp coming in August. It was a blessing to see how God used this as an opportunity to teach the children the ingredients required to be effective leaders under Him and to work together as one family of God. With the help of staff member, Martin and visitors Noah and Georgia the children all had great fun. Helen, who is in her final year of secondary school was an inspiration to me during my visit. Together we prepared a choir to sing the praise songs for bible camp. During our practices she led the younger children with patience, gentleness and love. When the bible camp arrived we all learnt of God’s power, love, and provision whilst the Lord provided opportunities for outreach in the community. The youth of Kindfund have had a lasting impact on my life as God has revealed his plans for my future. I had the opportunity to go into the local village at Ngaremara several times with the trainee girls. It was an eye-opener to see how the locals live their day to day lives. I was blessed as I met their friends, a family member and many Turkana women. I felt I was finally ‘home’ as we walked together, laughing, joking and visiting girls I met on my last visit, who were now grown up and living outside the home. When I saw were these young women had came from compared to where they are now I was extremely proud of them, thankful to the Lord and thankful for the blessing Kindfund is to entire communities. I’ll never forget the sisterly bond shared between us all. 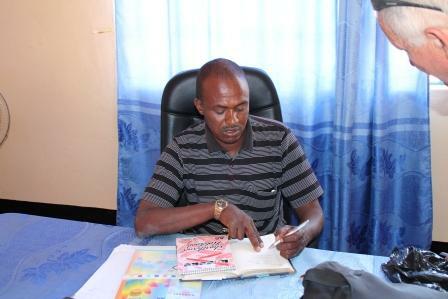 The staff of Kindfund, kindly took me into Isiolo town on several occasions. Esther (staff) and I met with a group of street-boys aged around 10 to 16 each time and bought them fruit. They had nothing but the clothes on their back and the bottles of glue in their arms. The way they cope in difficult circumstances is deeply moving. These few words cannot describe all the emotional experiences and Godly appointments I have had this summer. I will miss the Kindfund family and I look forward to returning to Kenya. about how the seemingly important things at home never really matter. Our time in Kenya has opened our hearts to the world around us, through the love and compassion that the people of Kenya can give, when they have so little themselves. It has been inspiring to spend time with the Kindfund family for the past three weeks this year. The radiation of happiness has been influential on our day to day lives in England. The children of Kindfund have a way of showing you perspective, about how the seemingly important things at home never really matter. 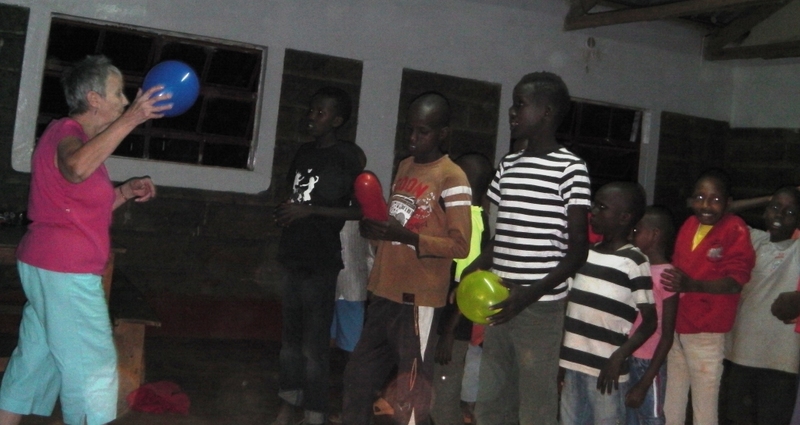 Throughout our time in Kenya, we decided to trigger the children’s imaginations by playing games with them such as: rounders, football and even a sports day with the help of our friend Katie Glenn, where the children were able to do races from an egg and spoon race to the sack race. One of our projects whilst we were staying in the Wamba home, was to create a mural in the girls dormitory. We thought it would be nice to have the children participate in the mural, so we decided to do a Kindfund family tree again, using their hand prints to form the leaves of the African Acacia tree. 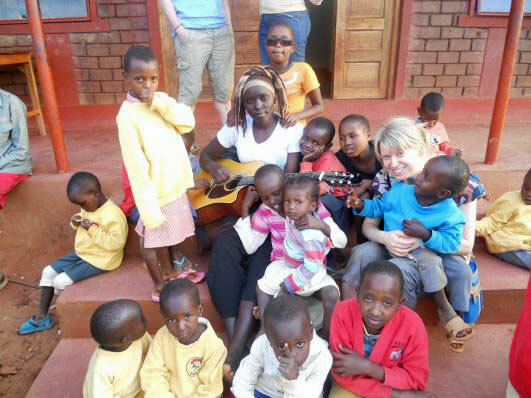 It has been an emotional journey, where we have seen the work of the Lord bless so many vulnerable children. We will be eternally grateful to Ken and Pamela for inviting us into their lives and for the work that they are doing in Kenya. Barriers were broken down, relationships established and the Gospel presented as children and young people were encouraged to follow Jesus. 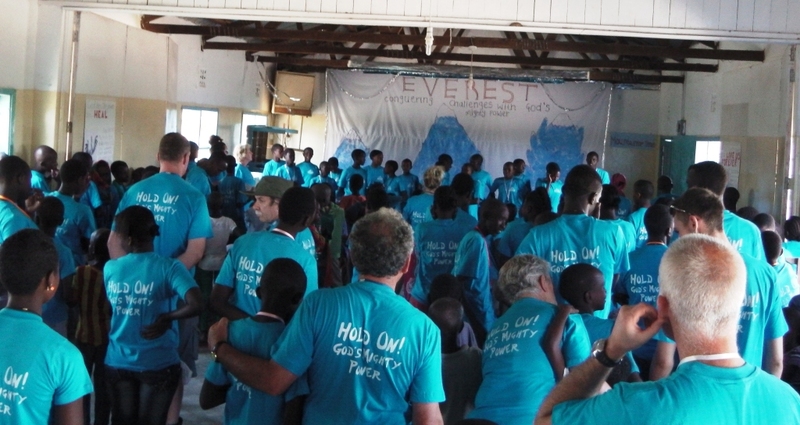 Five days of Everest Bible Camp came to an end on Thursday evening. One hundred and twenty children and teenagers had enjoyed the experience and were greatly challenged as they moved from Base Camp to the Summit over the five days. The team arrived at their journeys end on Friday tired but fulfilled and satisfied that the Summit had been reached and six months work and preparation had paid off. The team arrived home in Northern Ireland safe late on Saturday and all the children were safely delivered home on Friday to Wamba and Saturday to Ndikir. The host home at Ngaremara drew its breath and returned to normal duties. 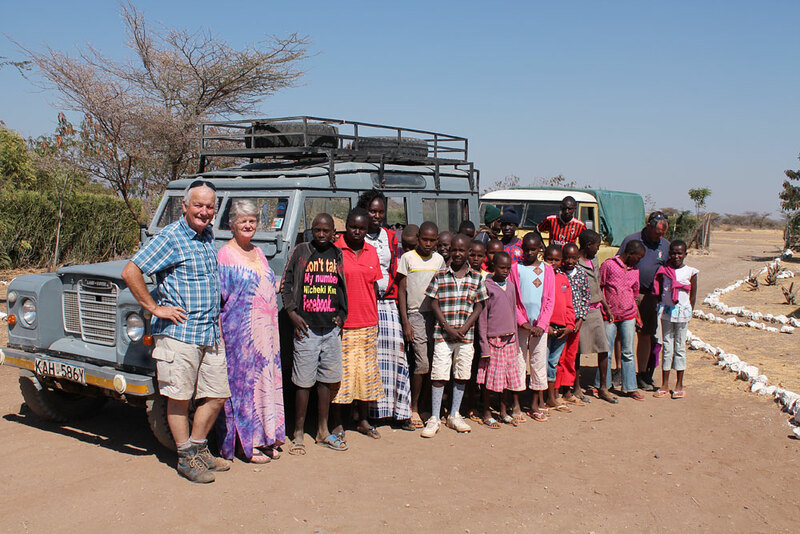 Friday was a long day as we drove to Ndikir to pick up 39 Rendille children and teens and two teachers frpm our primary school to bring to Ngaremara for our Bible camp starting tomorrow Sunday and running through to Thursday. We are sure much prayer and preparation will bear fruit during the bible camp and after. Team building and preparations dating back to January began to pay off as everyone arrived on Fri at Ngaremara and travelled to Wamba today for a few days before returning to Ngaremara for the bible camp. A truly mixed group from across Northern Ireland they have blended together to bring an exciting and challenging programme to the Kindfund children. We are sure much prayer and preparation will bring its own fruit in season. 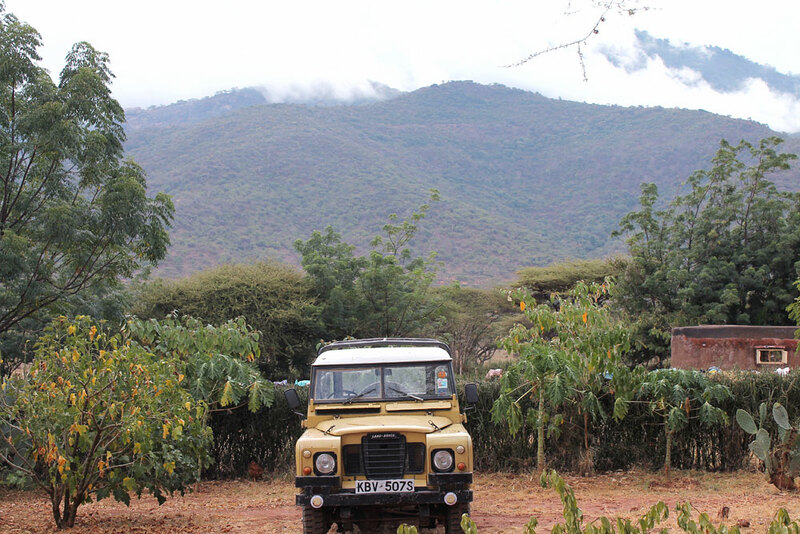 The journey to Wamba 85 kms was a memorable one in the 1979 landrover and with 55kms off tarmac road in dust and heat. They arrived well and were soon refreshed by the greetings from the children. Noah, Georgia and Katie have been working hard during their July visit. At the same time they have been enjoying the children. On Sunday 12th July two car loads of 23 adults and children set off from Ngaremara at 8.30am to join the children, staff and friends of Kindfund at a memorial service at our Wamba home. 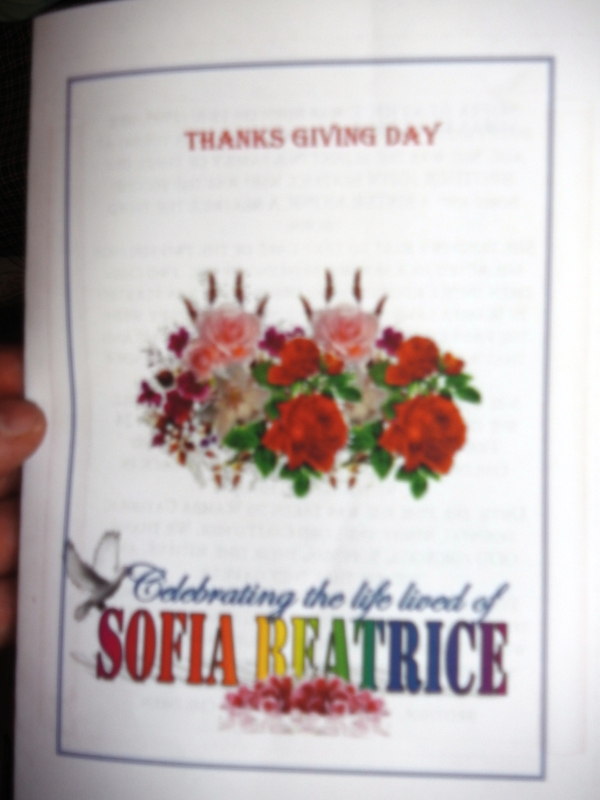 The service was a celebration of the lives of Sophia (19 yrs) and Supe (9 yrs) two of our children taken home to the Lord in the last year. The children and staff participated and recalled happy memories of the two girls. We were reminded by John brother of Sophia that we all traveled on the same road as he emphasised the importance of our relationship with Jesus. As a further bonus she has also been one of ten students from Kenya selected for a visit to Japan to study their children’s parliament. Each child will be accompanied by a teacher. Eight of the nine members of the Summer team visiting Kindfund Kenya in 6 weeks time attended a two day retreat in Co Fermanagh. The purpose of the weekend was to prepare for the Ministry to the Kindfund children in six weeks time and to orientate the team to life in Northern Kenya. It was the occasion of the 12th Annual General Meeting and change was in the air. Wednesday evening third of June at Cohannon Inn was a special evening for Kindfund and for Phil and Liz Crook as they retired from the Board of Kindfund after over 11 yrs faithful service. It was the occasion of the 12th Annual General Meeting and change was in the air. In presenting Phil with a personally inscribed Study Bible in recognition of eleven and a half years service as Chairman Ken recalled the small beginnings when six of them, three couples from Ardess Parish church met in Ken and Pamela’s sitting room at the first Committee meeting just two weeks before Ken and Pamela set out for Northern Kenya to begin the work of Kindfund. Ken paid tribute to Phil, his solid reliability, his frank and fearless advice, his faithful support in prayer and in practical hands on administration covering for Ken during the long periods when he and Pamela were in Kenya. He had presided over 12 years of God’s blessing and growth. 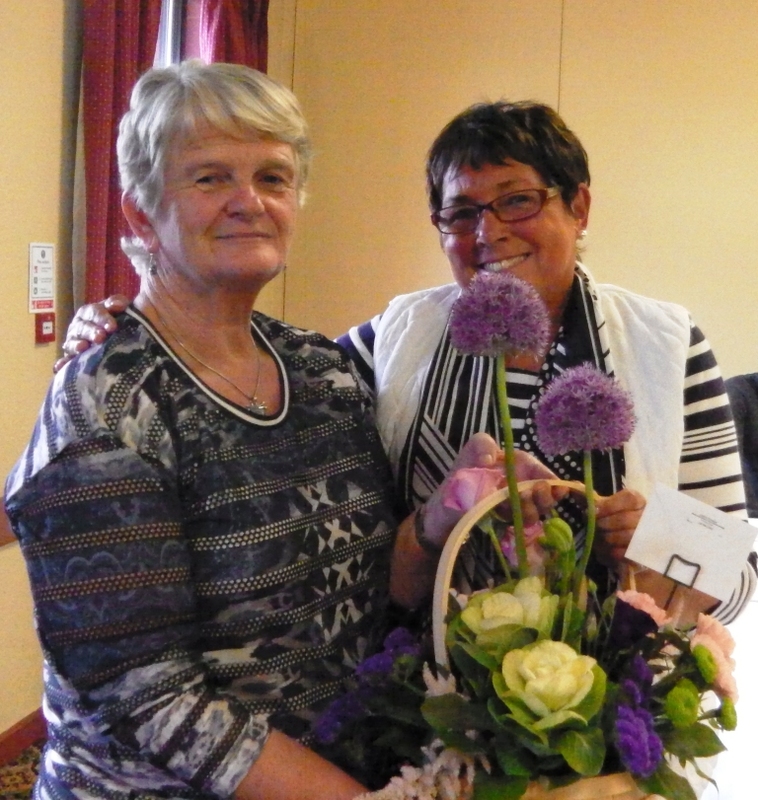 Pamela in presenting a bouquet of flowers to Liz who was also retiring from the Committee where she had served for the same period with her husband, recalled some humorous incidents which occurred during two visits Liz paid to the projects in 2006 and in 2009. One such incident involved Liz and Ken demonstrating Irish dancing in a hall in Archers Post to a group of Samburu women who had just been taking part in a traditional dance. New members were elected and details may be read in the About section. 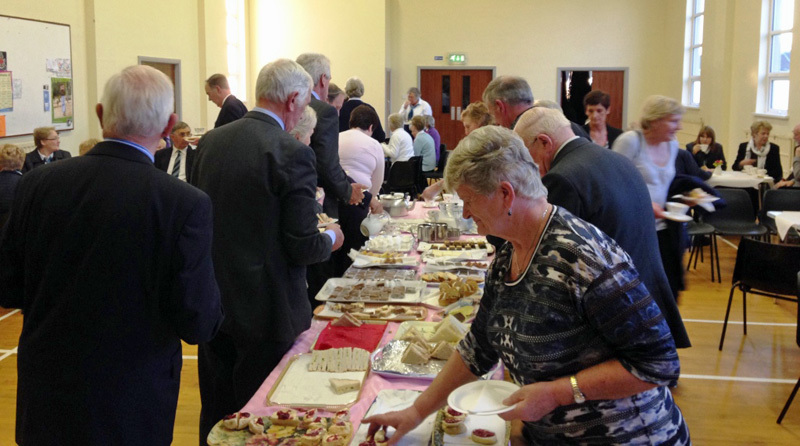 A morning of fellowship was greatly enjoyed by all those who attended the coffee morning and car wash at West Church Bangor. 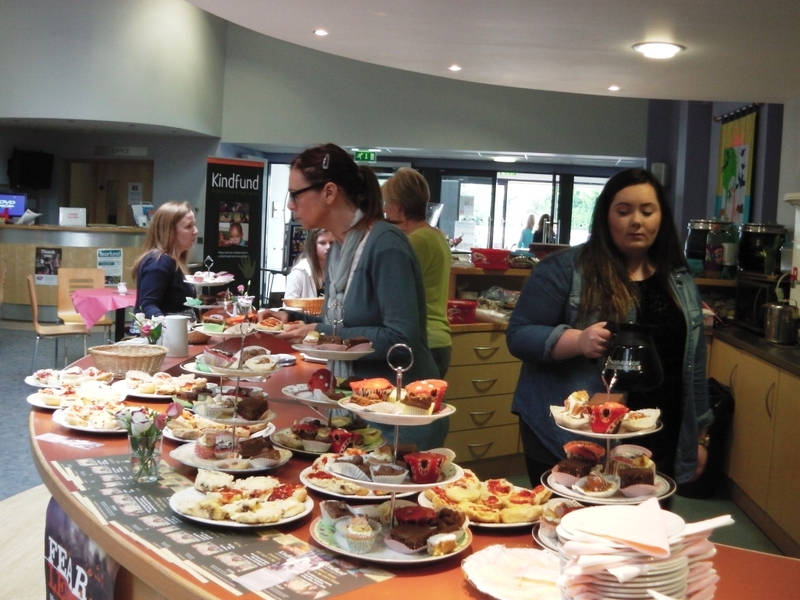 Thank you to all who provided tray bakes and other goodies for the sweet toothed and for those who kindly gave of their time and energy to serve. We enjoyed and were blessed and the Kindfund children from the pastoralist community in Northern Kenya will benefit from your generosity. We hope you liked our new format prayer letter, launched last February. 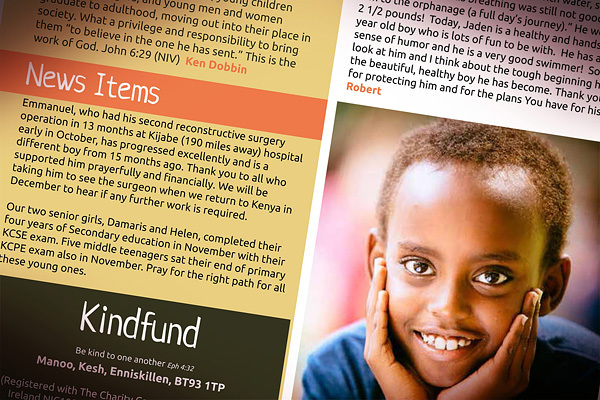 Find out more about Kindfund’s work inside this month’s edition. Derry and Donegall Presbytery Choir led us in a beautiful evening of praise with a mixture of traditional and modern gospel songs and medleys. David and Sally shared a little of what the Lord was doing in their lives and why they were going to Kenya. 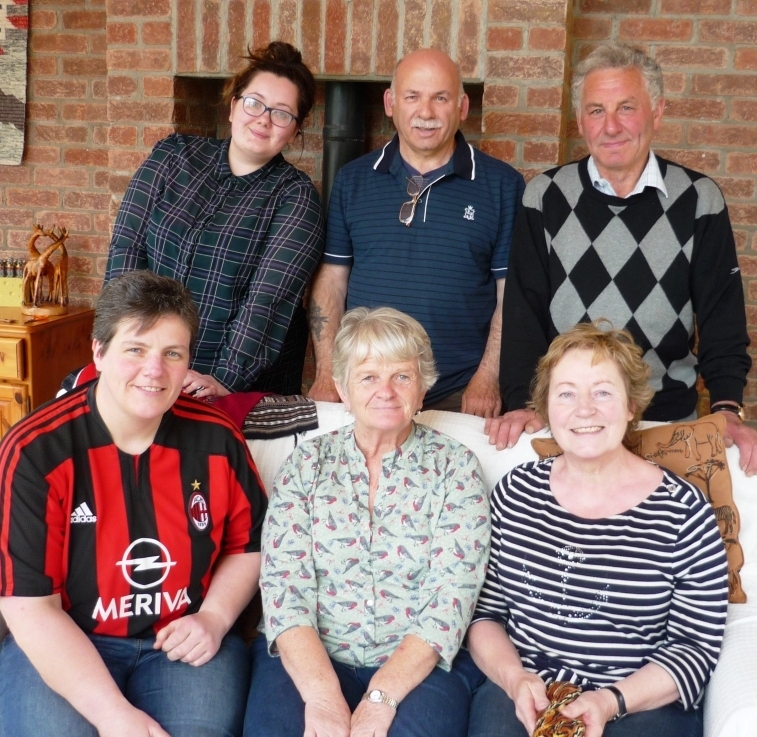 Sally had been greatly touched by the Kindfund Children’s Outreach and both had agreed that there would be no better way for them to say thank you for God’s grace and mercy to them as they celebrate their 40th wedding anniversary. Twelve of our sixty little angels at Ngaremara sitting on our kitchen wall waiting on something nice. The home at Ngaremara has expanded and we now have quite a number of younger children. This is a group of them over visiting Pamela in the expectation of something tasty. St Patrick’s Church of Ireland Sunday School, Templepatrick have been supporting Kindfund for the last number of years and enjoyed a wonderful night with the Kindfund children when they were here last October during their Outreach. 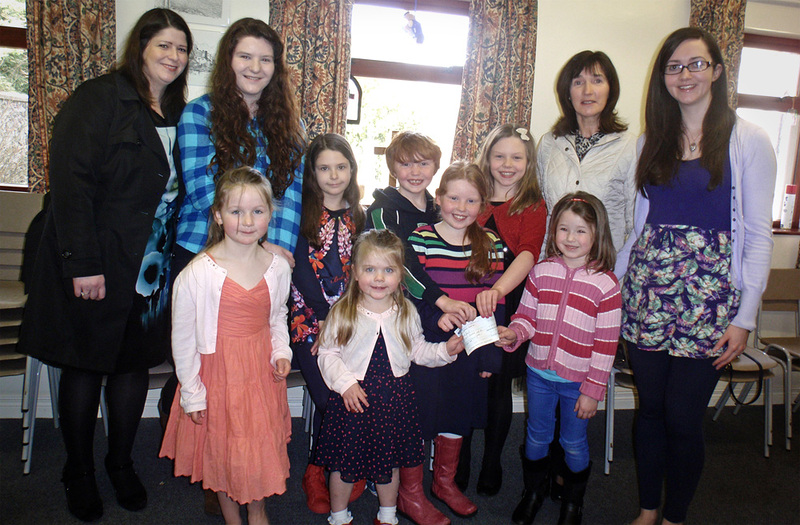 Each year the Sunday School children raise money for Kindfund in their Advent Appeal, so they recently presented a cheque to local Kindfund representatives Daphne Lucas and Catherine McCutcheon. Last week we collected the generator from the engineers in Meru. We paid Ksh 77,000 (£560) and ran into vehicle repairs of 25,000 carrying out our good deed. Later in the week on Sat we travelled to Ndikir and installed the generator. We had a little difficulty getting it started as air had penetrated the fuel system but soon water was flowing. Now the village has a super abundance. God has blessed them with rain giving water in their catchment areas, the solar borehole pump has been replaced and the generator is back in action. However we have a job to do in training them to manage the generator. It was good to join Raphael and the young congregation under the tree to celebrate Easter morning. We had come up in two vehicles so were able to bring some of our Ngaremara young people to share with our Rendille children. 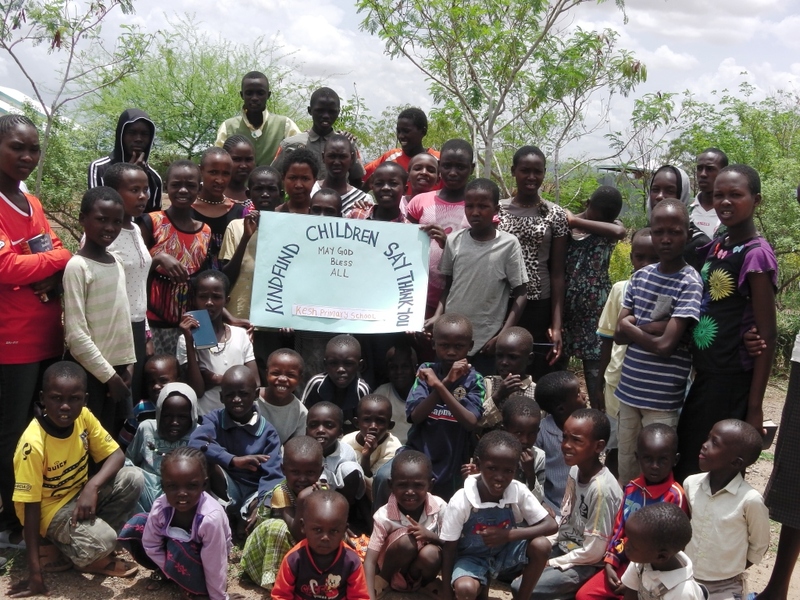 Kindfund children took time out on Sunday to say thank you to all their sponsors and especially to those who have been working hard to raise funds recently. Your support, generosity and prayers have been greatly appreciated. 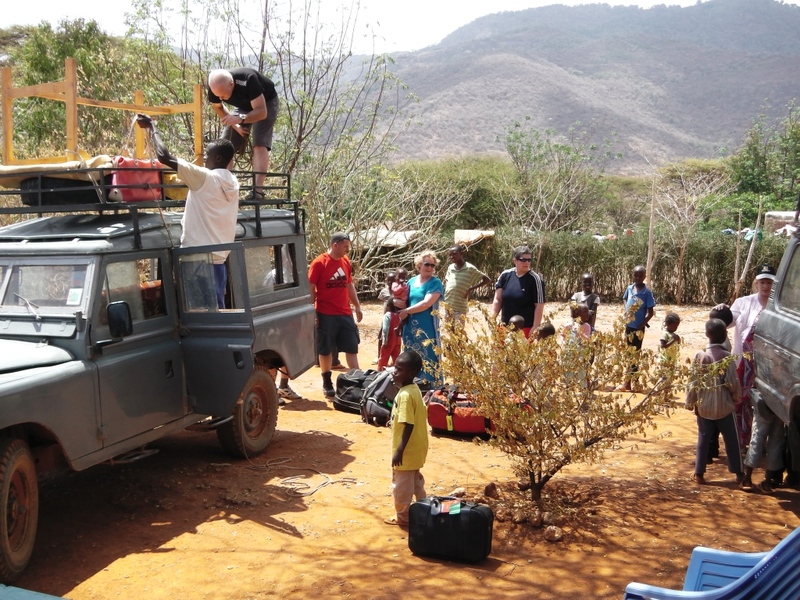 Once we had unloaded our deliveries we drove to the borehole and Willy and Simon had soon dismantled the generator and we organised a team to lift it into the back of the pick-up. 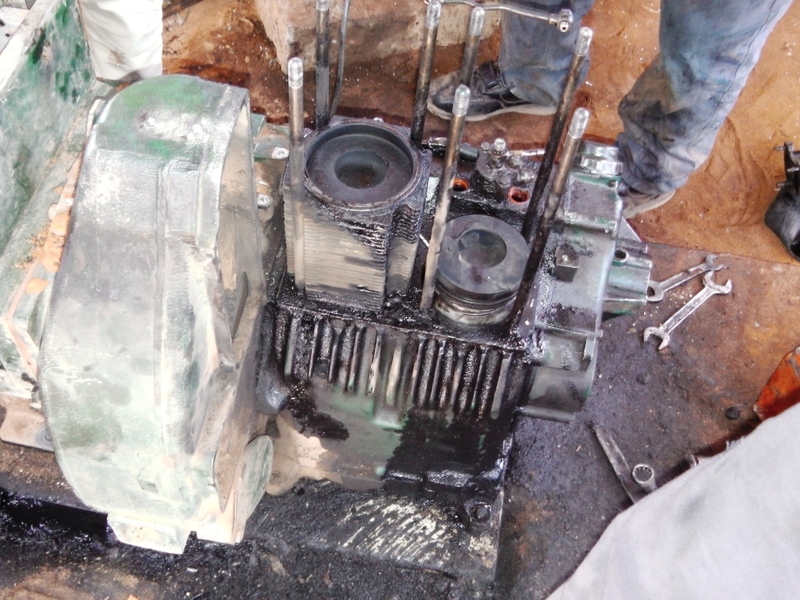 Unfortunately the damage was worse than we expected and the generator had to travel the 220 kms to Meru where we had arranged for the engineers to assess. Willy with Gigs and Bernard on board set off back to Ngaremara in the pick-up with the generator while Raphael, Simon and I drove first to Laisamis and then on to Marsabit(125kms) – a much improved temporary road with a 35km stretch of tarmac finished. 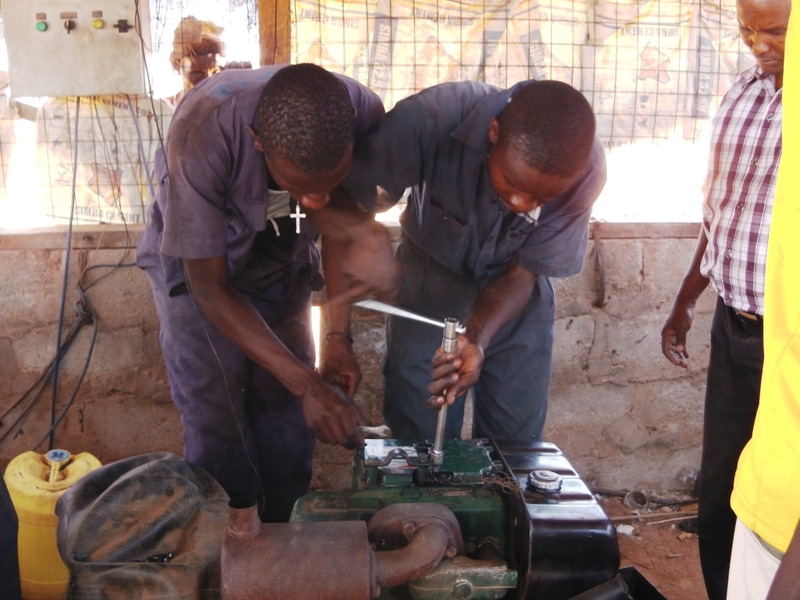 Today Wednesday Willie and Bernard took the generator to Ali Engineering at Mukatano in Meru and the engineers promised to have their assessment ready by tomorrow. There is a degree of urgency about fixing due to the chronic water shortage especially in the pastoralist areas of Northern Kenya. Listening briefly to a report on TV last night 1.9m people in four districts are currently described as at risk because of famine. We can certainly see that as we move around N Kenya. Raphael and I had a successful day tackling the various Government Departments and NGOs on issues of land, birth certificates for the children, education at Ndikir, water and other programmes. 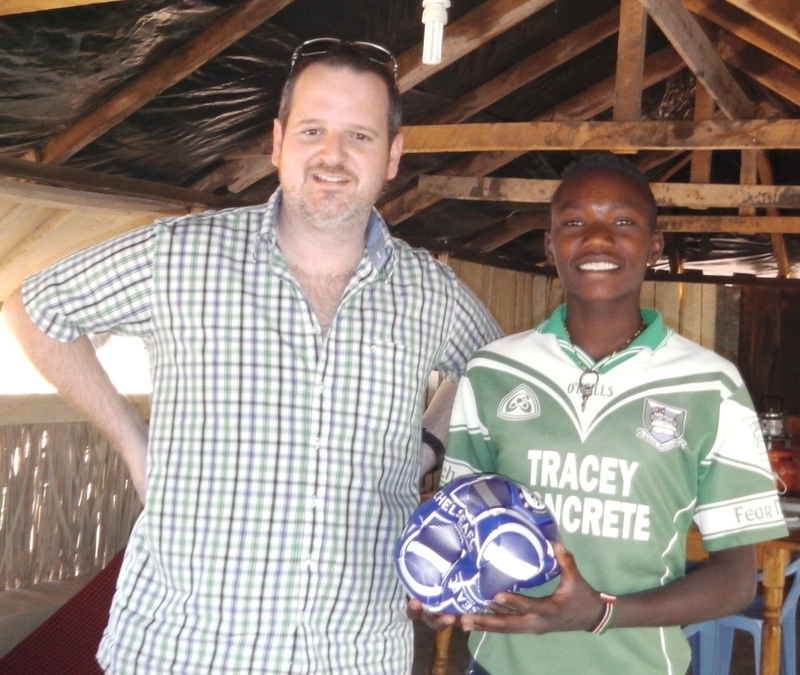 This included two Irish charities – Concern International and GOAL International. We are returning tomorrow for some more lobbying of the County administration before travelling to Laisamis where we have a meeting with the Ward Administrator about our plots of land for school and children’s home at Ndikir. 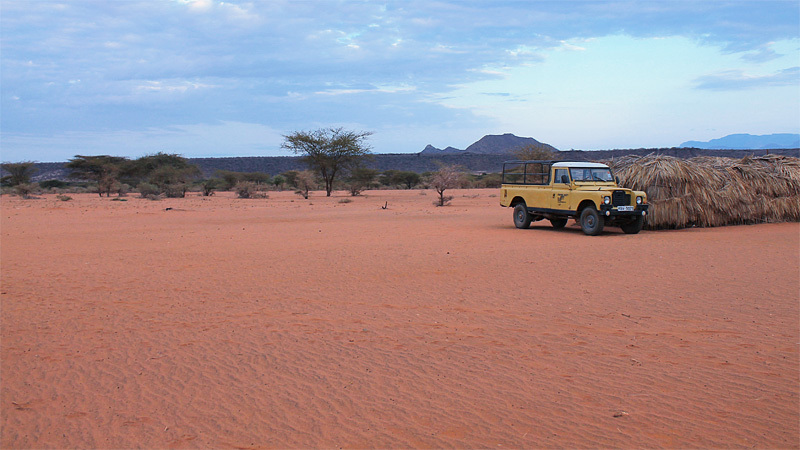 Marsabit is high up and has quite a unique climate. In the morning a lot of cloud hides the sun and keeps the temperature down to quite W European levels. A welcome if temporary change. 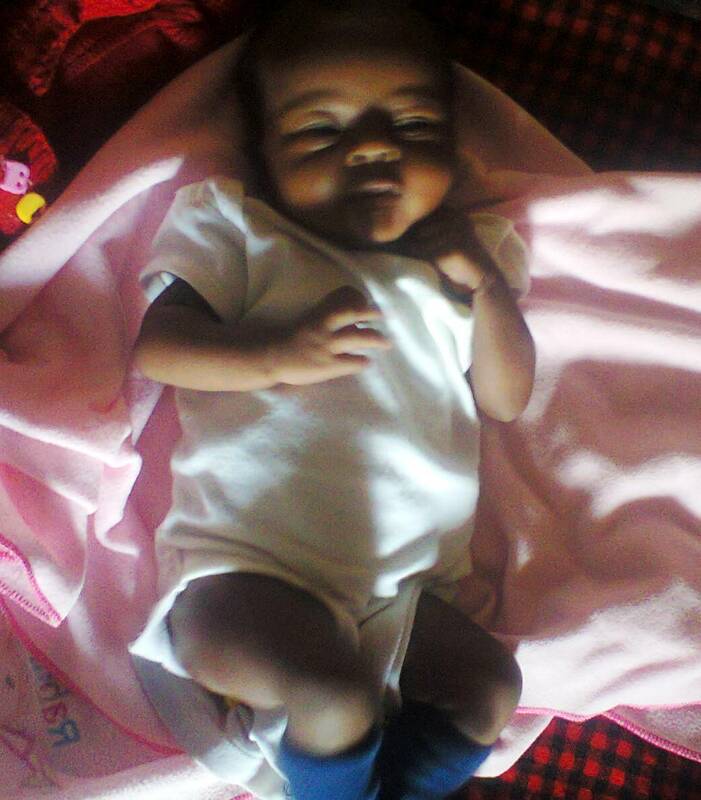 The two week old baby boy was born outside the cultural norms of the Rendille tribe and his life was at risk. The mother is 14 yrs old. 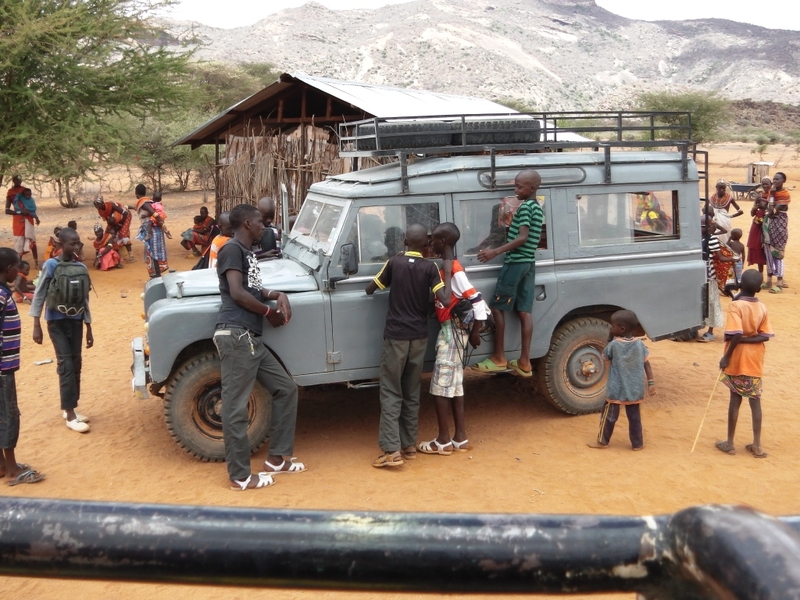 On Sunday 8th March a group from Ngaremara Children’s Home drove to Losidan in Marsabit County to rescue a baby. In the rescue group with Ken driving were Bernard, student mechanic; Christine, trainee; and Saraine, Freda and Saiyea. They left Ngaremara at 8am and drove for an hour and a half to Merille on tarmac where they turned off road for an hour to Ndikir where Kindfund have their children’s home and school. At Ndikir they presented water carriers to the Kindfund family to help with the drought situation they are now experiencing. Here the grandmother of the child and Julius a volunteer teacher joined the group in the car while Raphael went ahead on his motorcycle. On the way to Losidan they stopped briefly with the Senior Chief of the area to advise him of the purpose of the journey. Arriving at an outlying bomer (family enclosure) at Losidan, the group waited under the only tree for shelter with some of the local children while Christine went with the grandmother to collect the baby. The group now with the baby comfortably on Christine’s knee travelled quickly back to Ngaremara after a short stop at the “5 star” hotel in Merille for refreshments. At Ngaremara at 6pm along with the Kindfund children in the home I had the pleasure of welcoming the baby. After prayer for the safe journey and for the baby he was named Caleb. 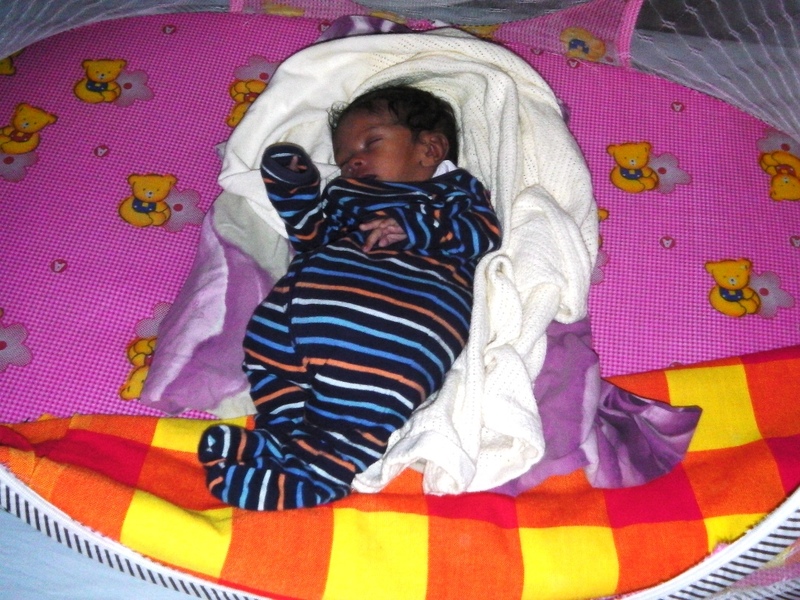 Caleb received his first bath and was dressed in new clothes by Esther who looked after him for the next two nights. The final stage of Caleb’s journey to his new home began on Tuesday when Ken and Pamela, Bernard, Christine and I accompanied him in the heat of the afternoon to Wamba. After 40 min on tarmac the next hour was spent on a very rocky and bumpy off tarmac journey to the Kindfund home at Wamba. Caleb on Christine’s knee rested his head on my knee and I cradled it in my hands to protect him from the worst of the jolts. I prayed the whole way for him to sleep and I was extremely grateful for God’s grace witnessing his peace which passes understanding firsthand. Caleb has been very content eating and sleeping well. 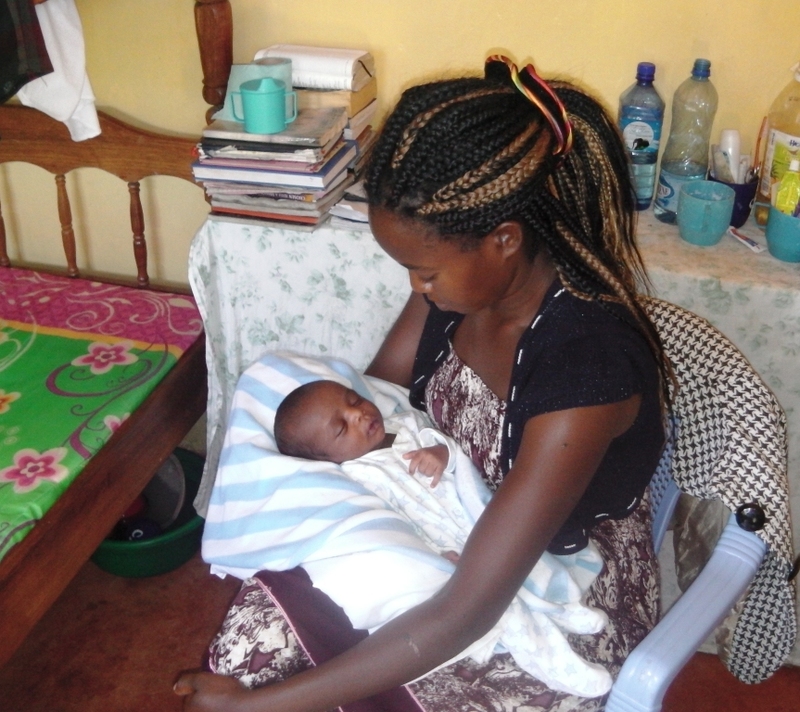 He was introduced to the children and staff at Wamba home by Pamela and Mary has been given the task of being mother. There was much excitement among the children at this new arrival. 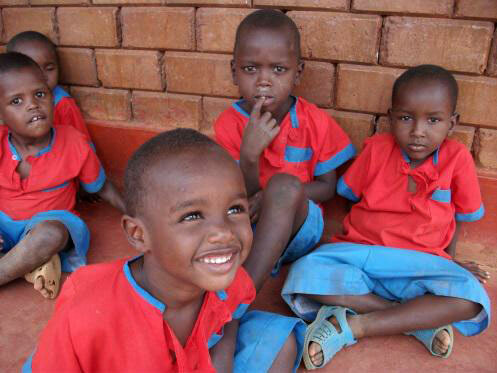 Caleb has joined three other Rendille small children rescued in similar circumstances. 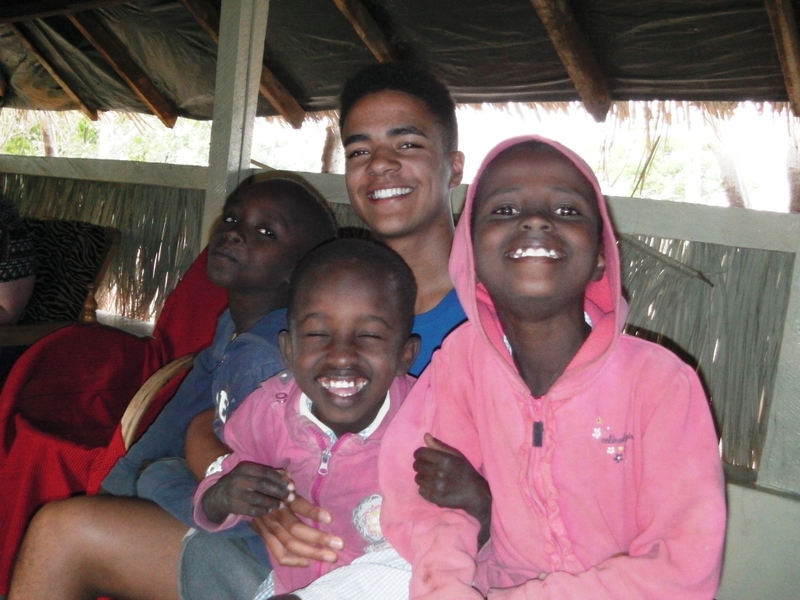 Please pray for Caleb as he settles at Wamba and for the work with the 50 children in the Kindfund home there. Today Tue 3rd March 2015 witnessed the culmination of two years of relationship building. Brian Drummond accompanied by two colleagues from Saab Engineering – Lornah and John visited our home at Ngaremara bringing with them a very generous gift of clothes for the children. The photograph shows the substantial box of clothes being presented to Ngaremara Home. Now that they have broken the ice with this first visit we look forward to a developing relationship. We thank Brian and his colleagues for their generosity and friendship. Arriving back after two months we were immediately impressed by the new two story extension to our original 2004 building. Well built and looking well it will house the Ngaremara office and the all Kindfund general store. Together with rebuilt paths and a surrounding fence the whole site looks smart. This will allow us to remodel the existing kitchen office and store into a modern kitchen and food preparation area. It was also nice today to catch some of the smiling faces on the camera. Some things don’t change. There is a happy homely atmosphere about the place and we thank God for the obvious love the children are receiving, the Christian fellowship being shared in this home community and for the obvious response this is drawing out from the children. For 2015 we decided it was time to refresh the look of our Prayer Letter. Here is our first edition in it’s attractive new format! We’ve tried to pack it full of as much news as possible, looking back at where we have come from in 2014 and where we are aiming for in 2015. Plus, there’s feedback about our Outreach and some letters from Kindfund children too. When you have read, if you have any questions please write to us an we will do our best to answer. Please post this article on social media – or email it to a friend – using the links below. Thank you! Returning to Ndikir in our last full week, we serviced the Lister engine and made a permanent repair of the damaged wires from the generator. Bleeding out the air from the fuel caused us a little heartache, but eventually we had it running sweetly! Next, we loaded the 1000 litre tank into the pickup and, fixing a hose from it to the pipe at the borehole, we had it filled in 10 minutes. 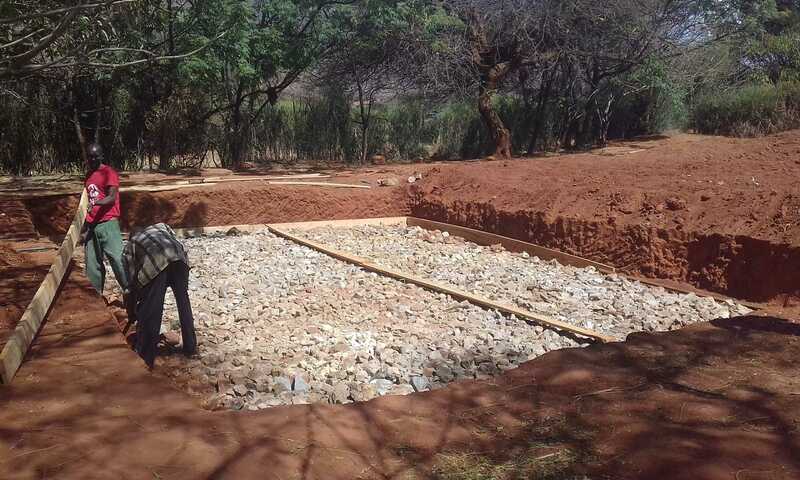 A five km drive to our new classroom…and the water was transferred to the 10,000L on-site tank. Repeating the journey a couple more times gave enough water to allow us to complete construction of the double latrine, a job that had been stalled two months earlier as we were unable to make concrete due to the shortage of water. Five days later we returned on a short day visit with Pamela for her to see the children – especially two young girls Ntodia and Linah who have been with us for four years. Pamela was surprised to see how much has changed already at the new site, where a pitch has been cleared for the children to enjoy playing football. Meanwhile, Raphael has marked out a 10 acre site which we plan to fence with local hedging in preparation for the start of building next year. The extension at Ngaremara has made good progress during the last two weeks and should be completed before Christmas. 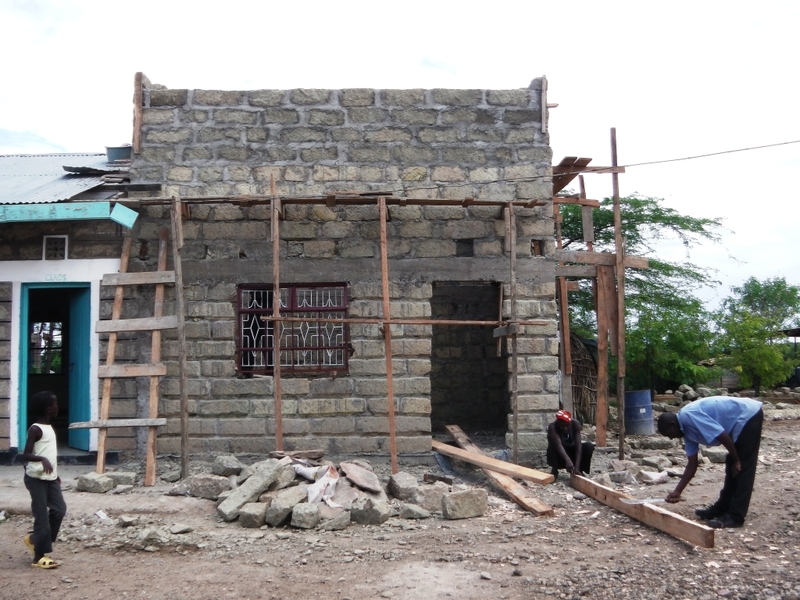 It is our first two-storey building and it will allow us to have a significant dry goods store on the first floor. 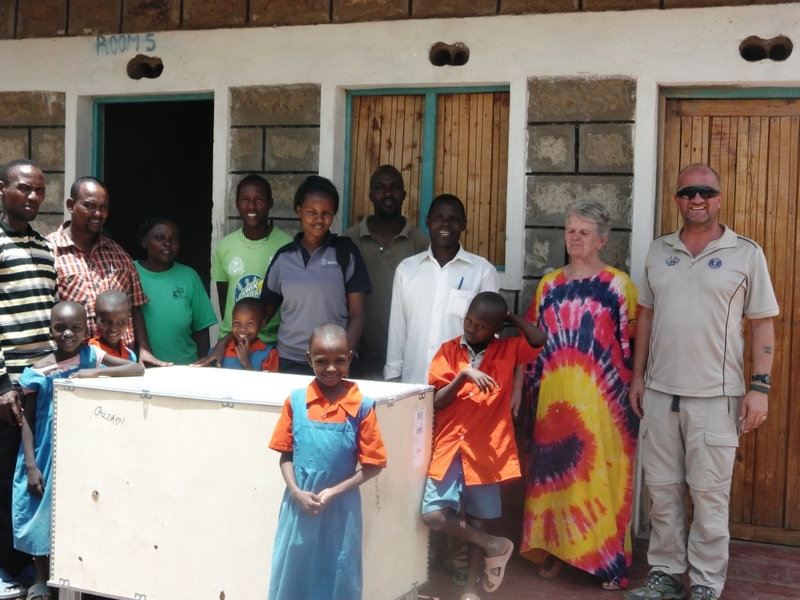 The transfer of the office to the extension will permit the refurbishment and development of the kitchen at Ngaremara, where we hope to install the same eco-friendly cookers we recently purchased and installed at the Wamba Home, with the help of the Girls’ Brigade at West Church, Bangor. Part of the development will also improve the pathways connecting the buildings to reduce the amount of mud carried indoors during rains. Travelled up to Ndikir this week to find the borehole with the Lister Petter diesel pump had been out of operation for two months. It seems that the engine vibrations had worn through the wires on the control box. Routing the wires well away from the engine then reconnecting them soon solved the problem. Started up the pump and soon we had water from 300 ft for 1000 people and many camels, cows and goats! The engine badly needs servicing so have bought new filters and oil and will return later with insulating tape and rubber tubing too, to make permanent the control box rewiring. Unfortunately very heavy rain last weekend finished off our temporary stick and straw classrooms and bedroom. Just one old classroom remains usable, though back in August we did build a permanent classroom for the use of classes 2 to 5. In any case with school off until January disruption should be minimal. In Ngaremara at the moment we are taking the opportunity to do some fencing and building work. The kitchen is ten years old and in dire need of refurbishment, so some remodelling work will allow us to fix the kitchen, improve our use of existing buildings and create additional storage space. On Sunday 13th September Emmanuel and housemother Josephine set out at 6.45am by taxi from Ngaremara, for the six hour drive to Kijabe Hospital on the edge of the Rift Valley, 50kms North of Nairobi, from where they texted their safe arrival. After an examination and X-ray on Sunday afternoon, reconstructive surgery was scheduled for the next morning. Josephine spent the night in a chair by Emmanuel’s bedside. They each slept as best they could. At 9.00am on Monday Emmanuel was taken down to the theatre. After a long wait we received word from Josephine that he had arrived back in the ward at 4.30pm – a very long day for all concerned, but particularly Emmanuel and Josephine. Later we received word from the doctor that the first stage of the surgery had been successful (the surgeon had used tissue from Emmanuel’s mouth in the graft), but cautioned that further surgery is still needed to complete this phase, plus there are other issues to be dealt with. 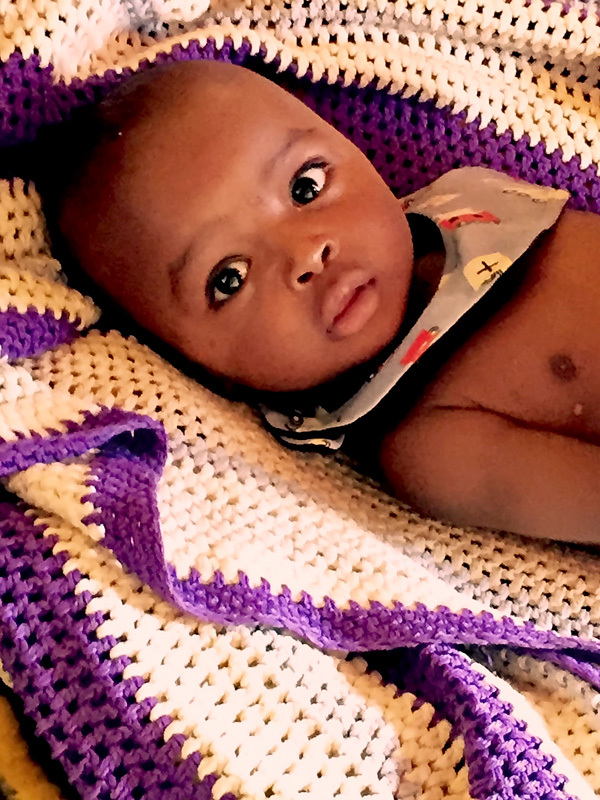 We hope that young Emmanuel will be well enough for discharge before the end of the week. Ken and Pamela will be visiting them on Thursday and finding out what the plans are for completion. 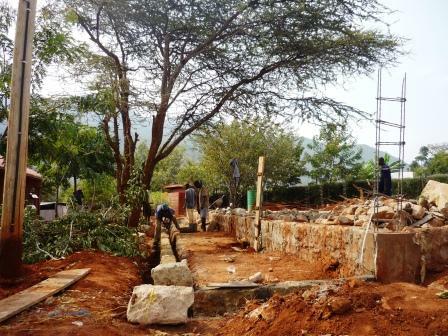 In one month we replaced a dilapidated classroom with a completely new blockwork multi-purpose room. 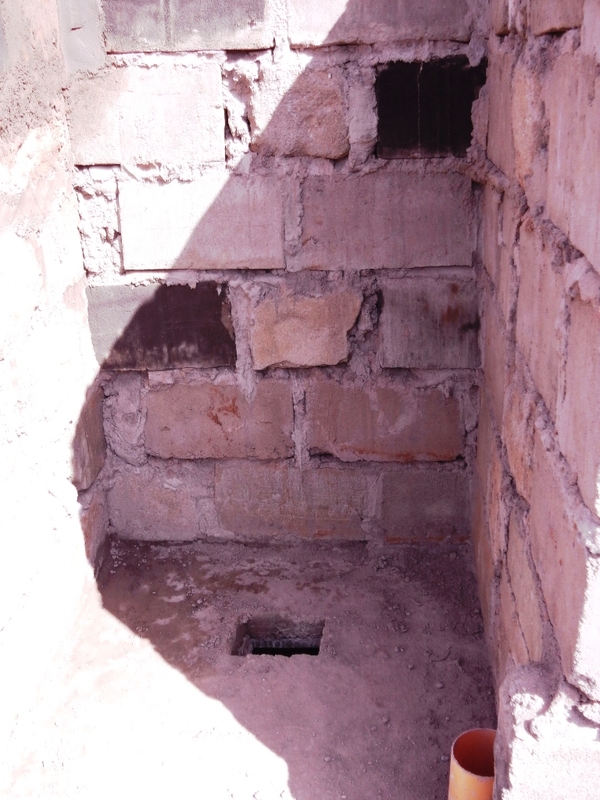 Our traditional house classroom at Ndikir was in serious need of major repairs. So, at the beginning of August, we decided instead to press ahead with a 30ft x 25ft masonry-built classroom, which will in future also serve as a dining room and study room in our Children’s Home. 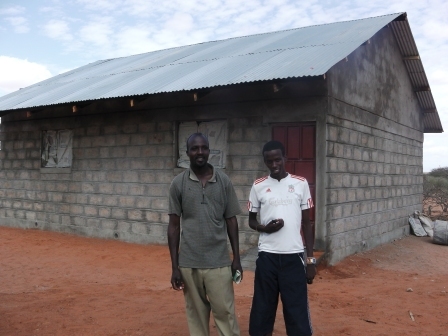 It’s now September and we have Richard—the builder—handing over the new classroom to Headteacher Samuel! This week all of the desks were transported by lorry the 1.5kms to their new location beneath the rock after which the school is named. We wish the pupils and teachers well as they embark on this new phase of education at Ndikir! A tour of the capital for some of our Kindfund children. On the last weekend before starting the new term at school, six of our secondary school girls accompanied us for an overnight in Nairobi. We stayed at the Nairobi Club in the community area of Nairobi and within walking distance of the city centre. The girls enjoyed the relative luxury of the club and the quick walking tour of places of interest in the centre of the capital. The visit was made possible by a donation made specifically for some of the children not participating in the Kindfund Outreach to Northern Ireland. They quickly experienced the same reactions as the early Christians met. 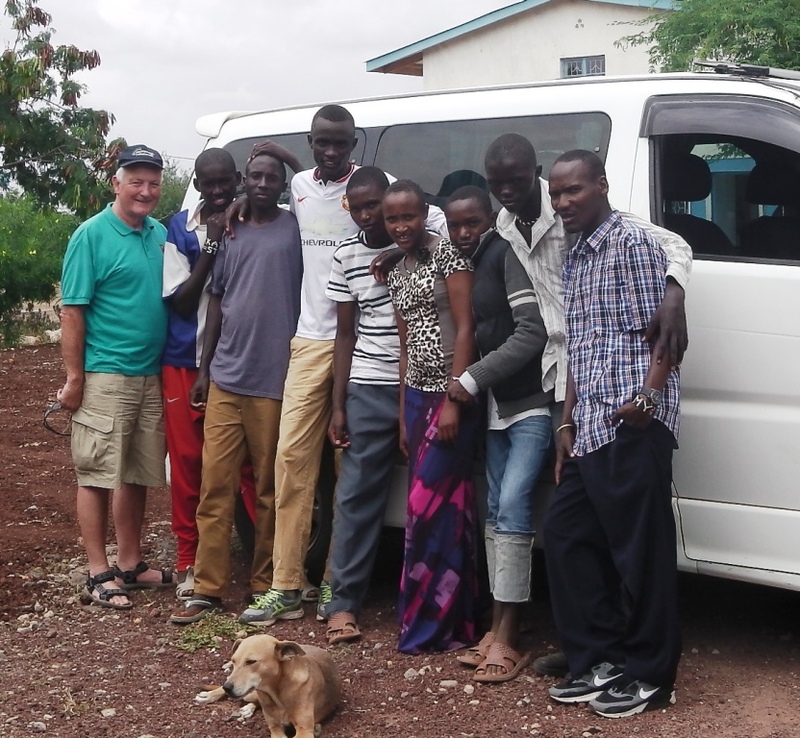 Fifteen young people from our homes at Ngaremara and Wamba spent 5 days this August sharing the Gospel at Ndikir, the Rendille village on the edge of the desert in Northern Kenya where we have a long-term commitment to build a permanent Children’s Home. Their mission coincided with the commencement of our building programme as we laid the foundation for a classroom which will eventually double as a dining/study room in the new home. The team were full of enthusiasm and encouraged one another in the Lord as they shared and prayed together before each venture into a local traditional village. They quickly experienced many of the same attitudes and actions from the villagers as the early Christians met, when bringing the Acts of the Apostles to life for them. Reactions of the villagers varied from indifference and avoidance, to chasing some of the girls with a stick (while shouting that their god was the local mountain and they didn’t need to hear). Some others, however, asked for prayer for specific situations and encouraging them to come back again. The mission was a major life experience for the young people who are already laying plans for their next mission to the village. Plans that are being soaked in prayer. Please join them in prayer for the Rendille of Ndikir that they will hear the Good News and come to know the Saviour. Saturday 2nd August will be remembered by the Cosmas family, as four of the five children joined our ever-growing Kindfund family here at Ngaremara, where we now have 55 children. It has taken a few weeks, but finally this small family joined us today. Throughout we have been working closely with the local chief and the Children’s Office to ensure these children are given a secure home and future. The youngest will join the family at a later date. The story of our young boy in need of reconstructive surgery immediately prompted several people to organise a sponsored walk to raise funds for the necessary surgery. The result was fantastic and, together with other donations, we now have £1500 to assist with the costs. Thank you so much for your generosity! Regrettably, in the absence of approval from the child’s mother, we have had to instruct an advocate to obtain a court order permitting the surgery in the interests of the child. If this is successful, the first stage of surgery is scheduled for 6th August 2014. We will, of course, keep you posted as the situation develops. Having visited before—in 2007—I was quietly curious to see what had changed in the intervening years. After a long and tiring journey, were it seems that little has changed in Kenya, it was immediately obvious that much progress had been made by Kindfund – and not just the development of the sites; the change in the children was abundantly obvious…their love was infectious. Our time with Kindfund was divided between Ngaremara and Wamba. Just to be able to spend time with the children in their own environment is a privilege and blessing. Yes, they all have material needs, but so many of them are spiritually well-off, they are a living testament to the work of the Holy Spirit in their lives. A paragraph or two here can never express all the wonderful experiences that Catherine and I had, we can only make mention of the children’s love for each other and their trust in the Lord to supply their needs. Of course, they have desires and wants like anyone else, but many of them also have an inner desire to serve and please the Lord. We wish to commend the staff for their commitment and love for the children (1 Thess 1:2,3) and thank them all for sharing their lives with us…we are all the more blessed. Would we go back? Of course! As with our Ngaremara Home, it has been important to get official recognition for our children’s home in Wamba. 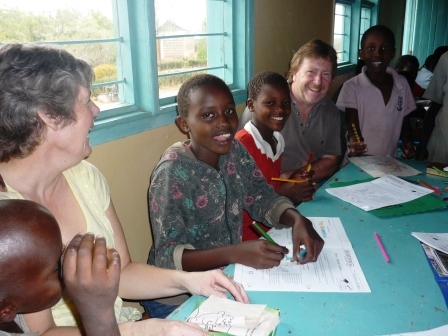 Registering our Children’s Home at Wamba with the Kenyan government has been a long process. In January we reported that we were at last making progress. We are now pleased to report that the Council meeting on 27th March 2014 accepted the application and Wamba became a registered Charitable Children’s Institution (CCI) under the Child Act of 2001. Thank-you to all who have been praying about this. Our two main homes with 100 children and capacity for another 20 now enjoy this official CCI status. Child Officers in both areas will be arranging for the Courts to make Committal Orders for all the children resident in the homes. 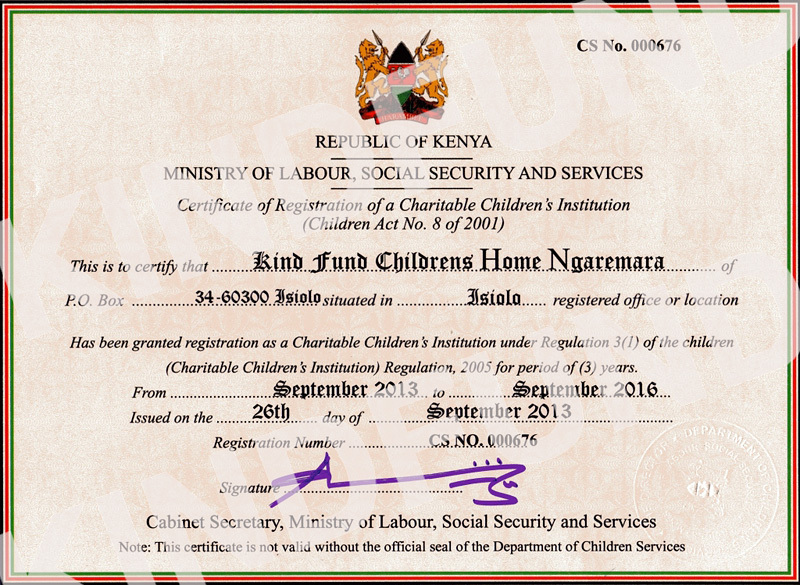 In Nairobi, at the beginning of May, Ken was able to collect the actual registration certificate for Kindfund’s Ngaremara Home (shown), registered in September 2013. These registrations are renewable after three years. Sponsored walk raises an amazing £900! Update: Thank-you to those who joined Katie for the 5 mile sponsored walk last Saturday. 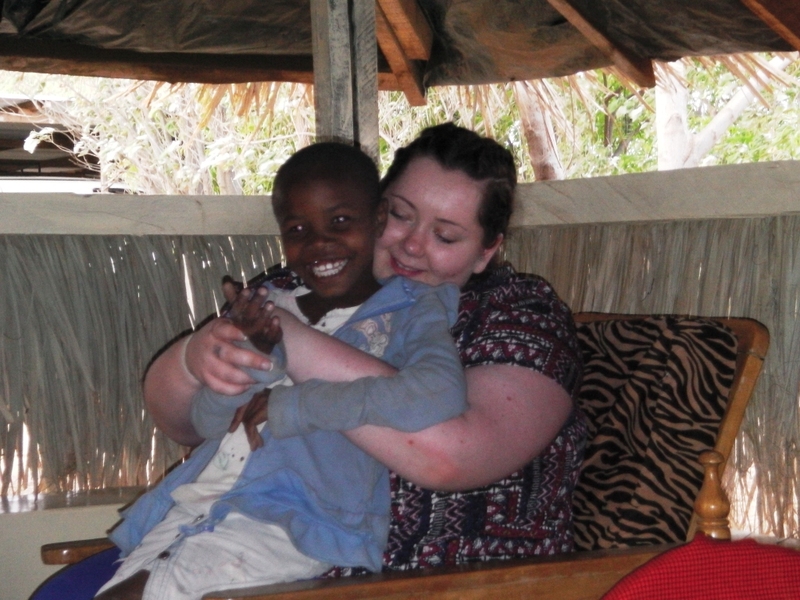 A recent article about young Emmanuel and his need for reconstructive surgery immediately prompted Katie from Northern Ireland to organise a fundraising sponsored walk. The walk took place in Bangor, Co. Down, leaving Pickie Bandstand at 10am and going to Crawfordsburn Country Park and back (approximately five miles). Thanks to the brave few who joined in! Please note that you can still contribute on Katie’s Give.net page for a few days yet. Last week outside the local supermarket I watched a group of about ten street boys as they hovered about, looking for people to beg from. Aged from 7yrs to 16yrs, they were calling out “some bread! …10 shillings! …a banana!” to every vehicle as it arrived to park, all the while hiding bottles of glue in their pockets, or under their arms. I had sat down on a seat outside the supermarket to keep an eye on the vehicle while Kindfund staff were shopping. The boys spotted me and, growing bolder, started to draw close with their begging, still trying to conceal their glue-sniffing. One particular boy caught my attention—the youngest—no glue bottle and clear, bright eyes…a recent street boy, not yet corrupted. He sat beside me and began to chat, and it became clear that he was an orphan, though he then pointed to his older brother—a glue addict—who was also among the group. When the other Kindfund staff emerged from the supermarket I explained to them what I was contemplating. They agreed with me, so I started to explain to the men at the nearby shop that I would first take the boy to a police station…and just then a police car rounded the corner! Sometime later, having officially recorded everything at the police station and got a ledger incident number, we all drove the 20kms to our children’s home, with ‘Moses’ beside me, taking a great interest in the driving. A quick wash, a change of clothes and into supper where the children surrounded Moses, inquisitively firing off many questions and not waiting on answers. A few hours later…he was one of our boys. Today we paid a further visit to the police and to the Child Officer (the local representative of the government Children’s Department). Together with the Child Officer we will continue to investigate young Moses’ circumstances to get a clearer picture of how he ended up on the street. Meanwhile, he seems to be slowly integrating into the home. The story is just beginning. 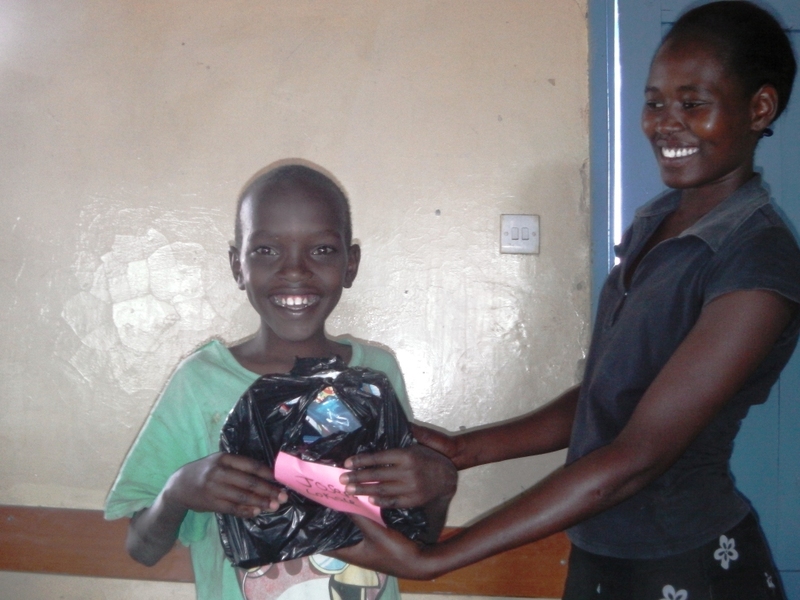 Josephine, our housemother at Ngaremara, and the boy we had at hospital returned to Ngaremara by matatu (minibus). Leaving Nairobi at 11am and arriving home at 8pm, it was a long day for them both. Pamela and Josephine had shopped earlier, so Josephine (a trained seamstress who loves dressmaking) went back with enough material to make nine dresses for the children! Today, Pamela and I have a few things to shop for and I want to visit a solar pump distributor to get some advice. We are also going to be working on a short prayer letter to email home to the Kindfund team who will arrange to distribute it; thanks in advance! We are looking forward to the arrival of Paul Dickson on Tuesday. He will bring his usual impetus and enthusiasm to help drive forward the laborious process of collecting and double-checking information for passports. His help will also be invaluable as we prepare to go to the court with the advocate to get joint and full legal guardianship for all the children travelling. A round trip to the edge of the Great Rift Valley. Beautiful views…but what a road! 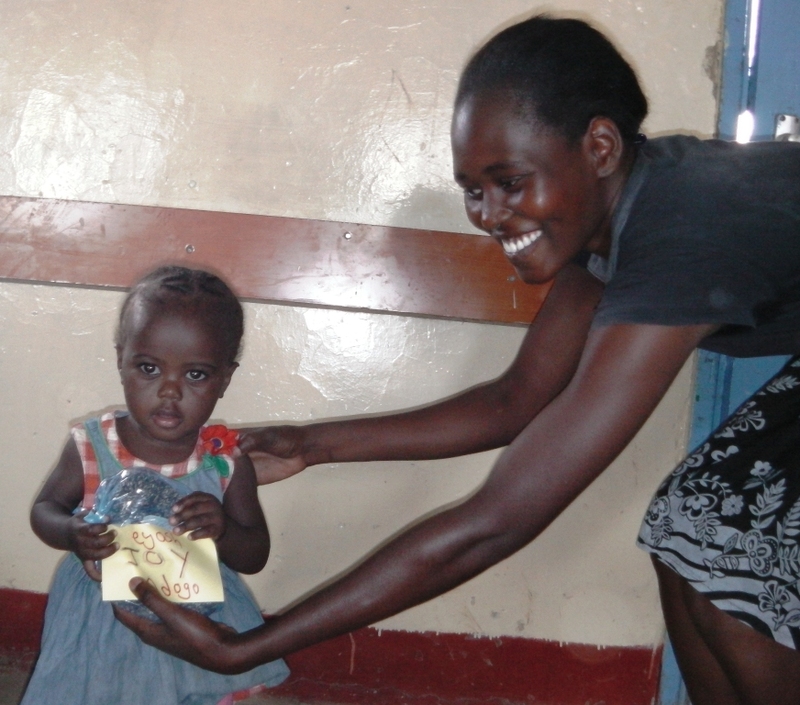 One of our new children from Ngaremara needs surgery, so together with Josephine, our housemother, we travelled to Nairobi. After an early start the day was spent at Kijabi Hospital perched on the edge of the Great Rift Valley, 60 kms North of Nairobi (a round trip of 700 kms for us). Beautiful views…but what a road! We thought we would never get back up the hill – a lot of first gear and potholes. 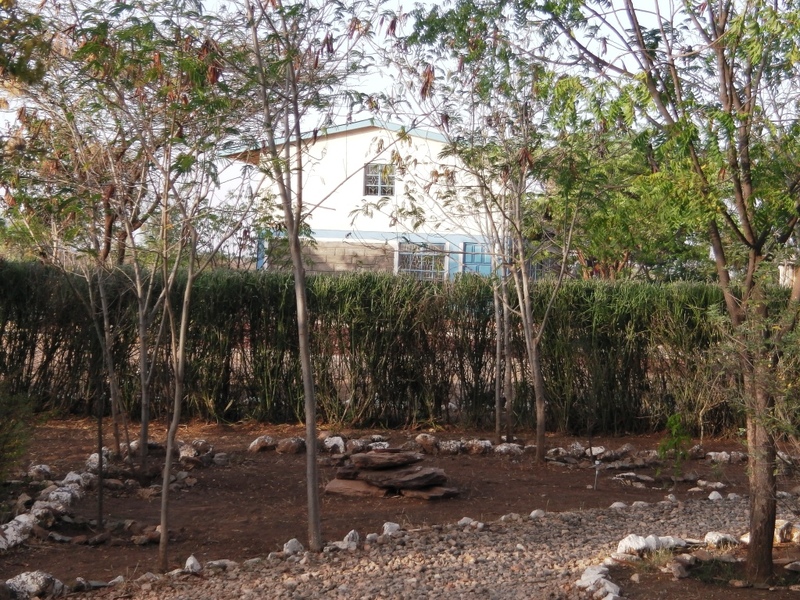 Kijabi is an African Inland Church Mission Hospital recommended by the doctor at Wamba Catholic Mission Hospital as having the appropriate expertise. The boy, who is 5 years old, was seen at Kijabi by a surgeon from USA who advised that he needs to return for multiple procedures of reconstructive surgery in relation to some malformation, with the first maybe starting in around four weeks. However, there are complications. We have two requests for prayer: The boy’s mother is not stable and has refused permission for surgery, so we will have to go to the Court for permission. Secondly, the hospital is only partly covered by the National Hospital Insurance Fund which covers all our children, so we will need some financial support. The young boy has been brilliant, and a pleasure to be with. Last night at dinner he quickly got to grips with John Doherty—a very good friend here in Nairobi (studying reticulated giraffes for a PhD at The Queen’s University of Belfast)—who had joined our table and was amusing him with ‘fly away Peter, fly away Paul, come back Peter’ etc. Update 20 March: One Northern Ireland girl and her friends have been moved to immediately start fundraising to help cover the surgery costs! The process of organising groups of helpers to travel to Kindfund Kenya in 2014 is gradually coming together. Stephen Scott will be joining Ken and Pamela in February. 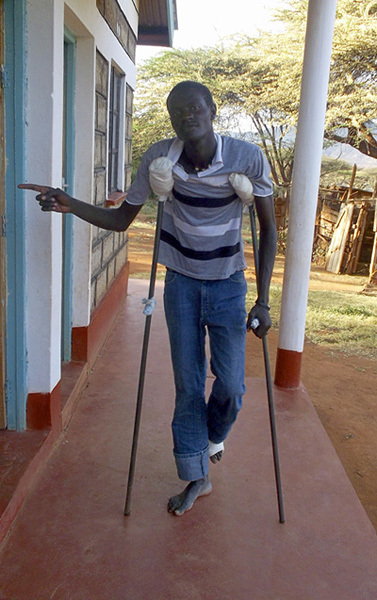 Stephen is a member of the Kindfund Committee and visited Kindfund Kenya back in 2007, before we had even established the Children’s Homes…so he’ll certainly notice big changes! Joining him will be Catherine his wife, on this her first visit. Catherine helps Ken with Kindfund administration at home. 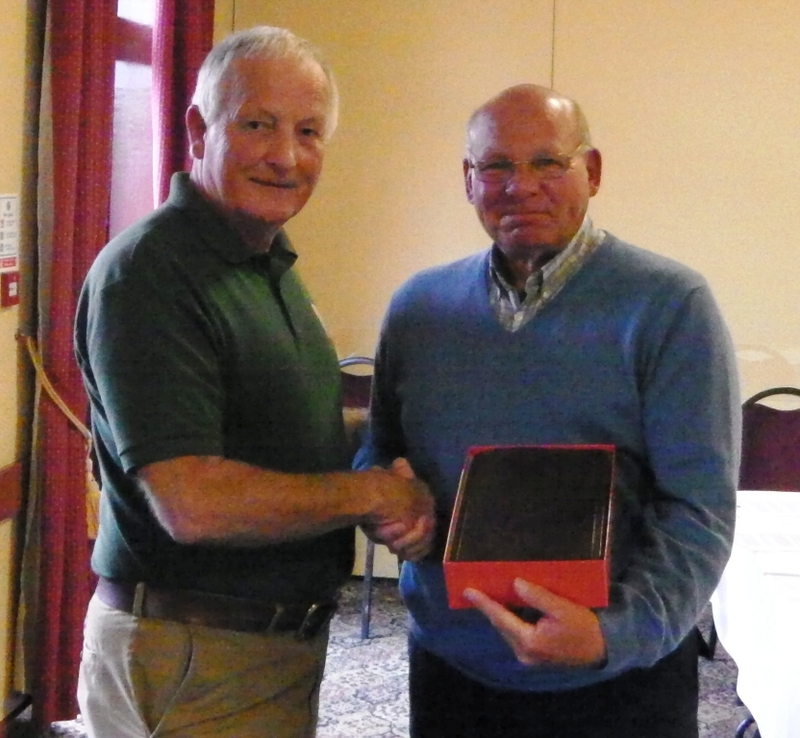 In March, Paul Dickson (another Committee member) will make a return visit too, having been a great help last summer. Paul has also been assisting Ken at home with aspects of administration. 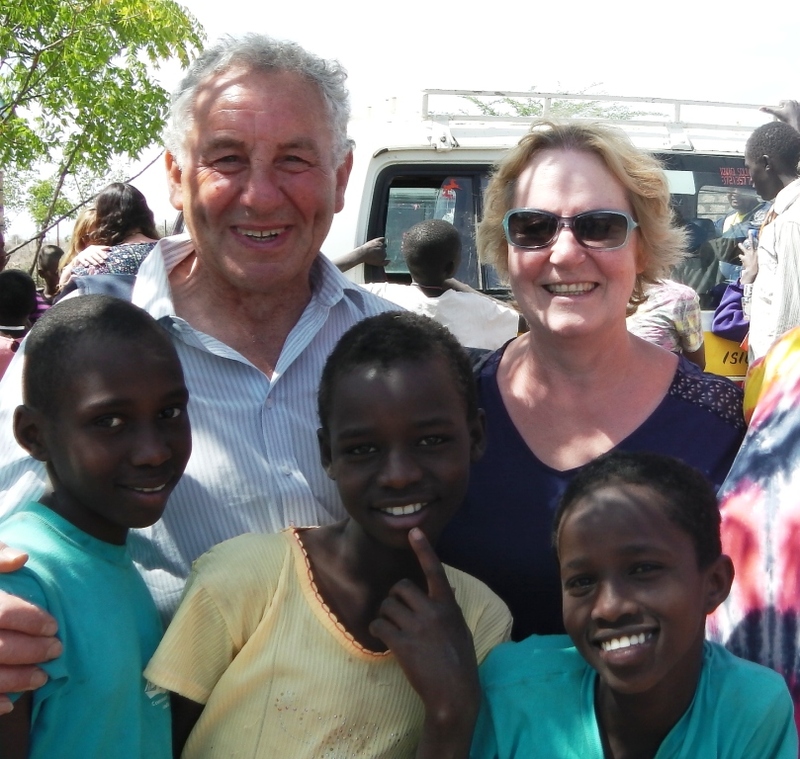 Then, after a short break at home, Ken and Pamela will return to Kenya at the end of June, ready to receive and organise a whole host of new helpers. July will see Georgia and Georgia (two 17-year-old girls from Cirencester in Gloucestershire, one of whose parents have been long-term Kindfund sponsors) who will hopefully be joined by three students from Enniskillen, Co. Fermanagh, plus daughter and mum team Kate and Anne (our local prayer organiser) from Bangor, Co. Down. Jonathan and Keira Dobbin make a return visit in July. Jonathan (currently studying at Belfast Bible College) is a Committee member, and one of our team which has responsibility for the organisation and funding of the special Outreach event coming up in the Autumn. 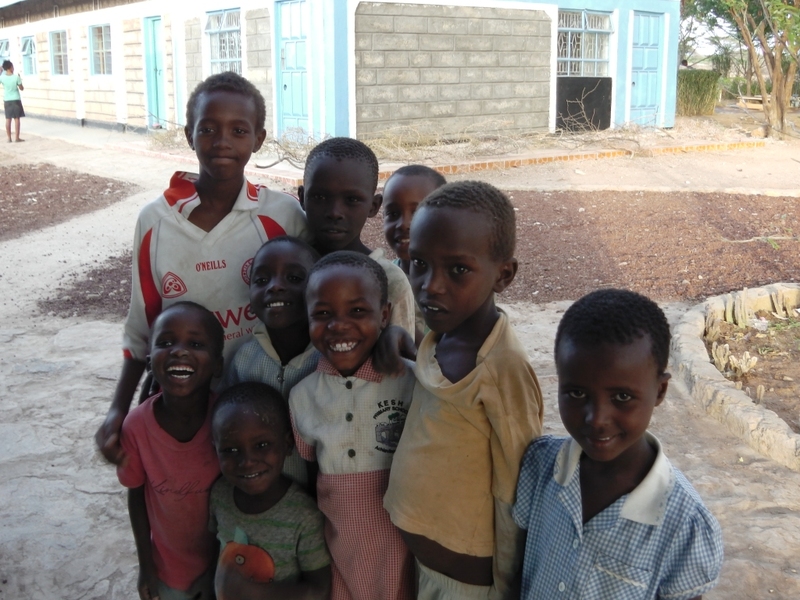 Enquiries about helping with projects on the ground in Kenya this year are still welcome! News updates from the teams will be posted here, plus reports when they return home. 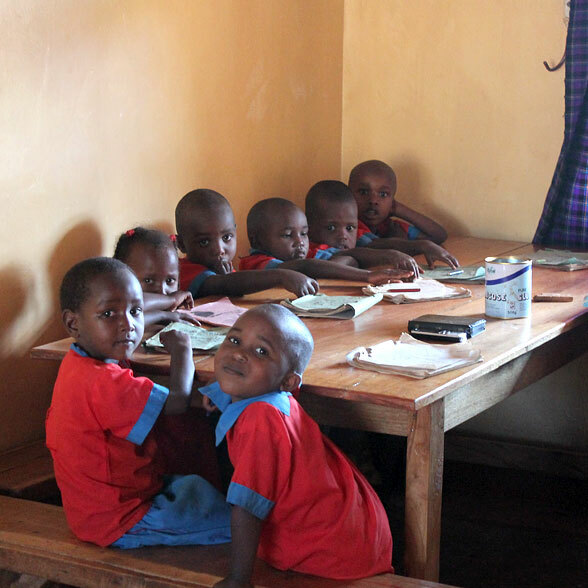 Originally submitted in August 2012, our Wamba registration is now making firm progress! 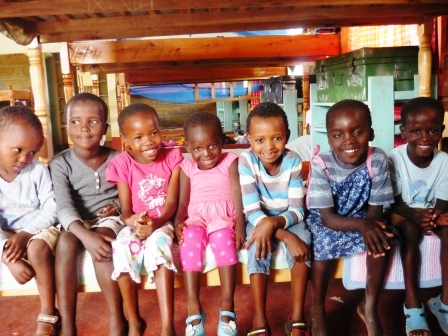 Many of you have been supporting us in prayer over the application for registration of our Wamba Children’s Home as a Charitable Children’s Institution (CCI). The Wamba application was submitted at the same time as our Ngaremara Home application, itself successfully registered as as CCI last September. We have now had confirmation that the application and inspection reports recommended by the Samburu County Children’s Board have reached the Director of Child Affairs in Nairobi and will be placed before the next meeting of the Council. Registration is important for us, not least in view of our plans to bring 25 children to the UK and Ireland in September/October of this year. Thank you to all who have stood with us through this process. Let us continue to the end when we will be able to report that full registration is complete. 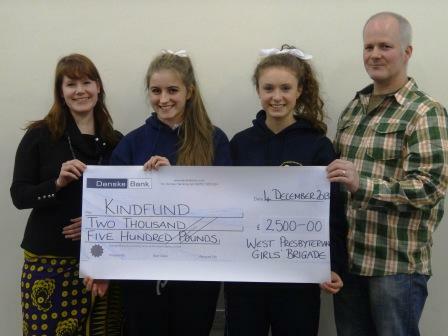 Kindfund would like to thank the Girls’ Brigade of 297th NI West Presbyterian for hosting an excellent evening at West Church in Bangor in November. The—now annual—Chinese banquet in support of charity, this year raised £2500 for Kindfund. 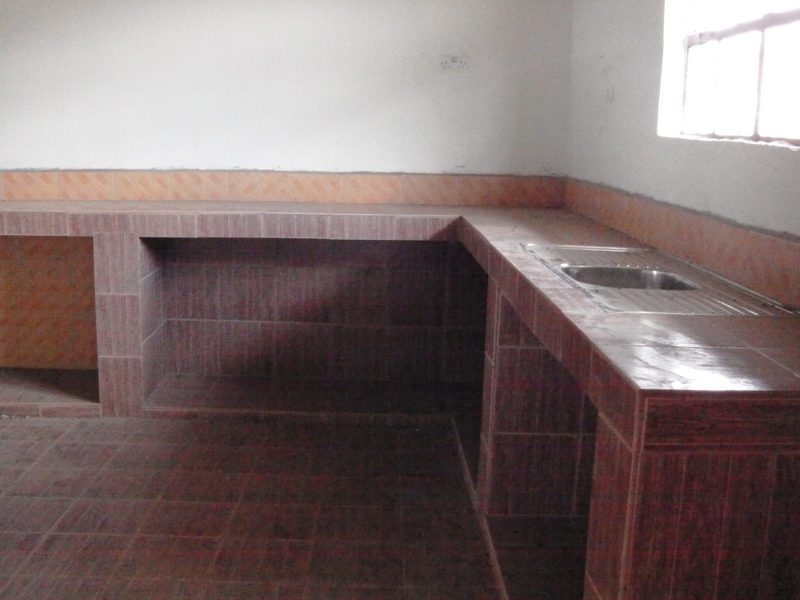 The money will be used to help furnish the new kitchen recently completed in our Wamba home. Ellen Robinson & Hannah Wilkinson of the Company are seen handing over the cheque to Jonathan and Keira Dobbin of Kindfund. Increasing demand for places in our Wamba and Ngaremara homes. A very big “thank-you!” to those who visited our homes with gifts of food, clothes and toys in the run up to Christmas. 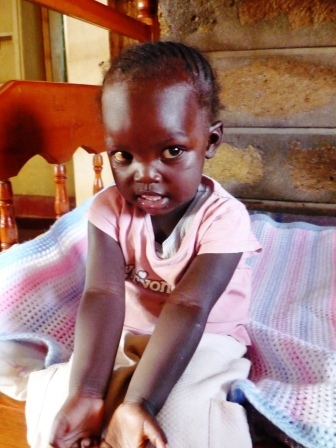 Over the Christmas period we are dealing with requests to take a one year old at-risk child into our Wamba Home and a six month old baby, abandoned at Wamba Hospital. At Ngaremara we are in the process of bringing in two orphan girls aged 9 and 4 whose relatives are unable to provide adequately for them. We have been greatly saddened to learn that one of our older girls—now 20 yrs old—who left us two years ago has recently lost her baby daughter, born earlier in the year. Please pray for her and the family circle. We have been frustrated by the administrative arrangements in Maralal for registering our Wamba home as a Charitable Children’s Institution. 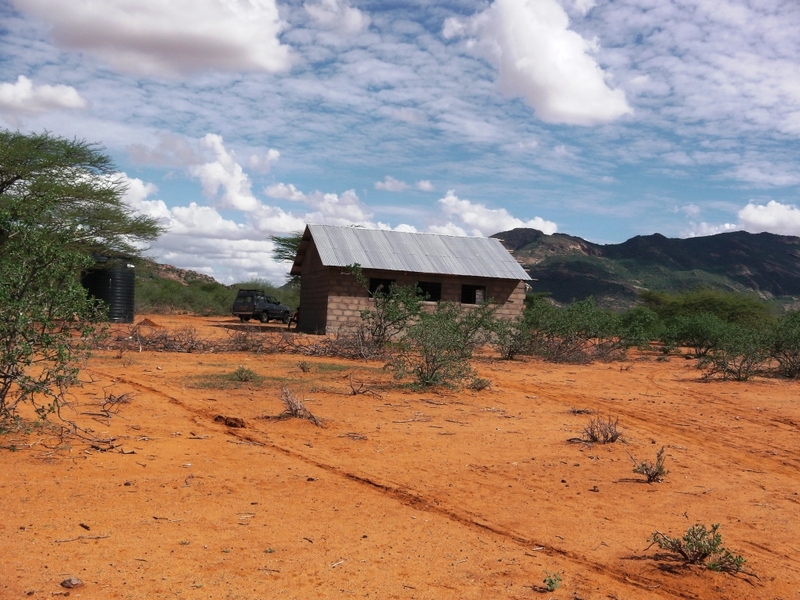 The process was straightforward at Isiolo for our Ngaremara home, now registered since September 2013. Both applications were made in August 2012 and we supplied similar support material in each case. Please ask God to give us favour with the Office at Maralal and to open up a way. 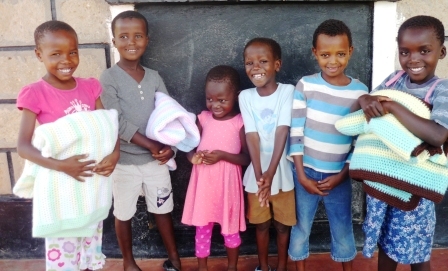 Soft crotchet blankets are covering many of the small children at night at Ngaremara and Wamba Children’s Homes thanks to the tireless work of a 90 yr old grandmother in Scotland. Over the past few years she has presented many cosy blankets to Kindfund for the young children and babies. Here you see some of the latest being accepted by the children. They just love the cosy feel of them and say a big thank you to Janet who made them. 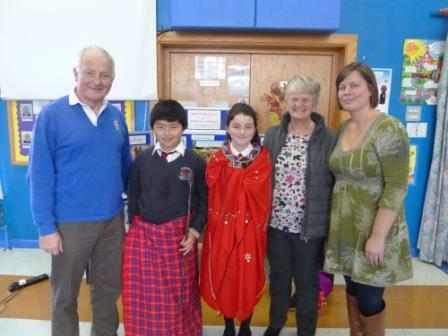 Ken and Pamela were invited to speak to the children at their Harvest Thanksgiving Service on Wed 23rd October 2013 and enjoyed a healthy exchange of questions and answers with them about the Kindfund children in Kenya. 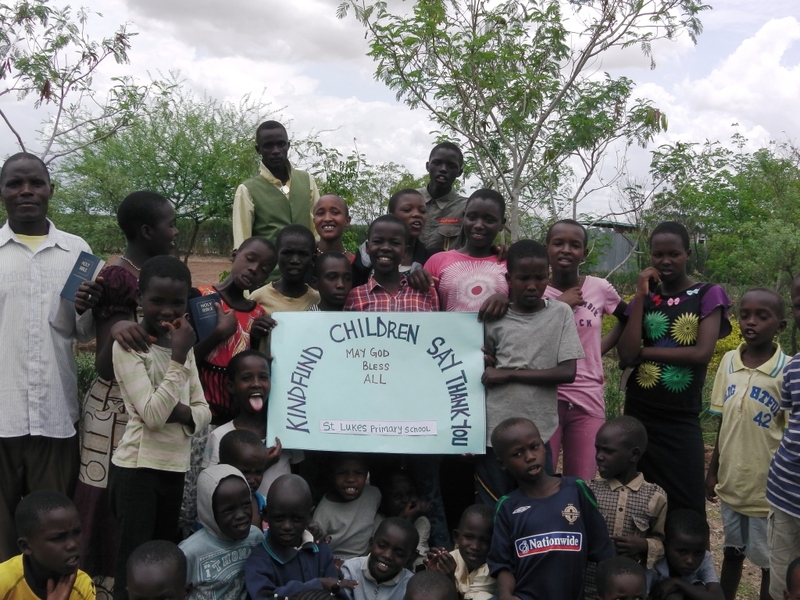 The children were already well-informed about the work of Kindfund among the poorest pastoralist tribes in Northern Kenya. 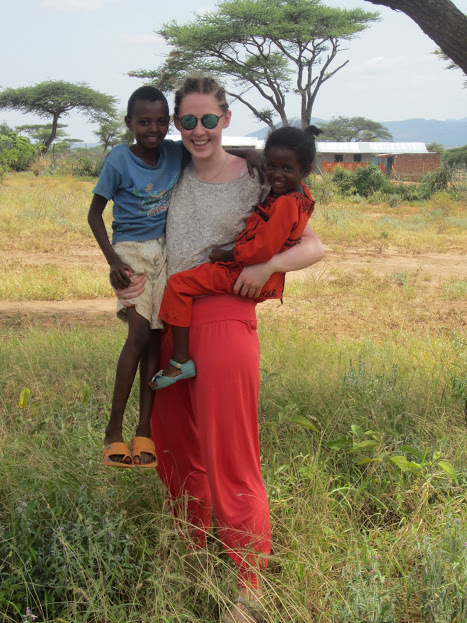 Their teacher, Miss Karen Fitzsimons, had already been sharing with them her experience with Kindfund during July, when along with two other teachers (Alistair and Ros) she had spent time at Kindfund’s Children’s Homes at Ngaremara and Wamba. 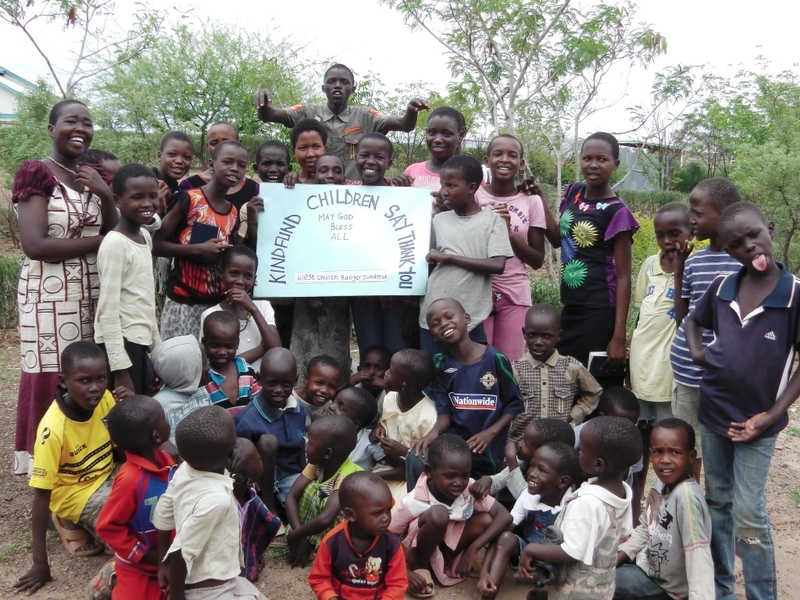 The children presented their Harvest thanksgiving offering of £287 to Kindfund to help furnish the kitchen in the new building at the Wamba home. It was a typical damp, cold Irish morning on 18th July when I said my farewells to my wife and son and headed for the half six bus from Omagh to Dublin Airport. Full of excitement (and also a bit unsure of what I was letting myself in for) I started my seven week ‘Kenyan Adventure’. I arrived in Nairobi at half two the following morning—having flown via Istanbul—where I was met by Joseph, the Matatu driver, for a bumpy six hour drive to Ngaremara Children’s Home. Boy was I happy to see the smiling faces which greeted me! 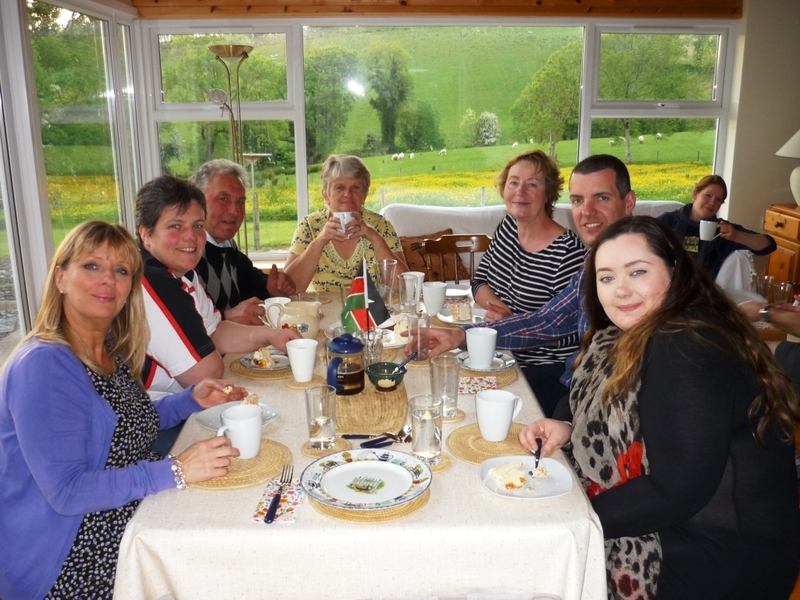 Pam and Ken were there, together with Alistair, Karen and Ros who were returning to Nairobi in the same transport, to go home. On Sunday morning I had my first experience of church in Kenya, and it was just amazing. Freedom of worship and praise abounded with children singing and dancing to praise the Lord. And when they were asked to give a testimony, they all wanted to share. The children shared the word…and boy can they preach! I was totally moved by the joy in the faces of the children as they praised the Lord wholeheartedly. For me, church will never be the same again. 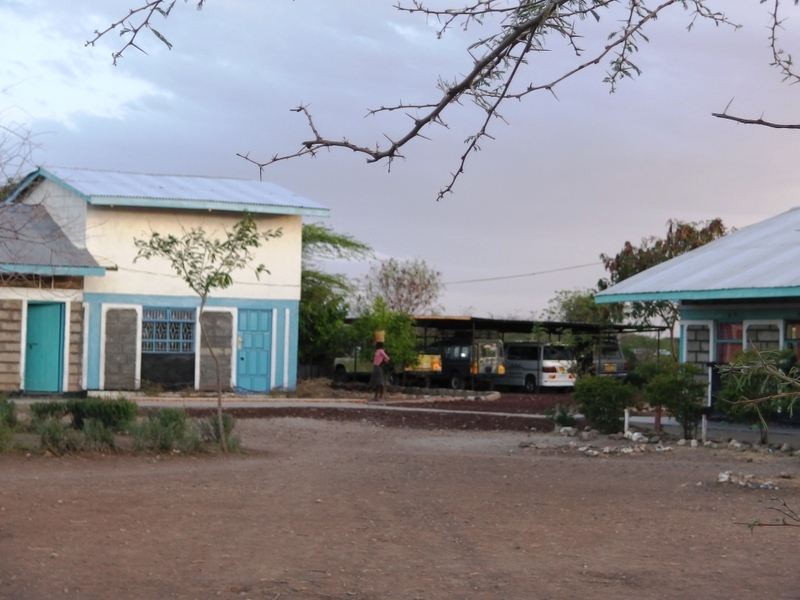 Soon I headed up to Wamba Children’s Home where the younger children mostly stay. Even now, as I write this, I can honestly say that a piece of my heart is still there. I hugged a child if they cried; a kiss and cuddle if that’s what was needed. I just showed the love of the Lord the way it was intended; it was heaven-on-earth for me. 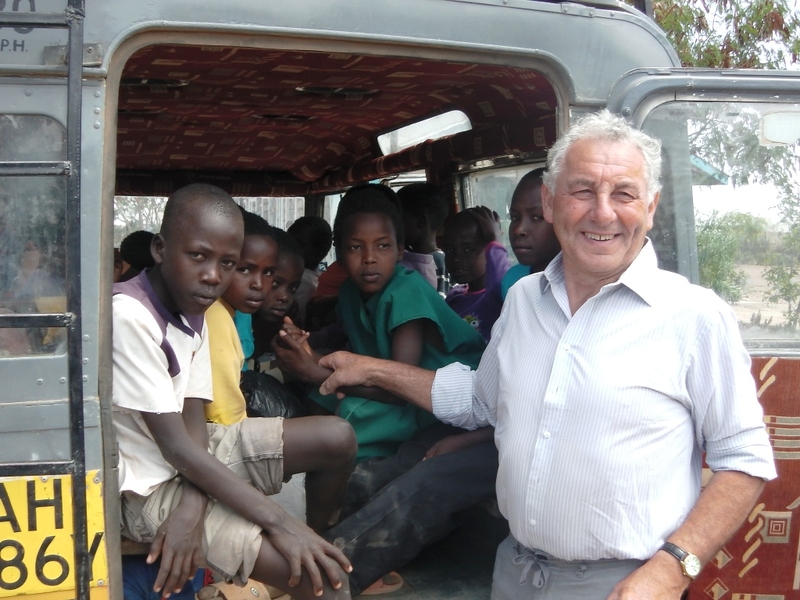 My next big trip was to the Rendille, to deliver food supplies in the Landrover. What an adventure! We reached our destination at night in a sandstorm, yet the children from the home and village still gathered in the dark and stood out in the storm for us, to sing and praise God: just amazing! That night we just roughed it in a hut till morning, waking up with absolutely everything covered in an inch of sand. It was a genuine privilege to be allowed to drive the ageing Landrovers, since they are so vital to Kindfund’s ability to get things done. Ken watched me carefully to make sure I was treating them well, and gave me a crash course (no pun intended!) in vehicle repair and a refresher on how to drive offroad. Then it was my turn to take the wheel as we delivered food supplies and brought the children to the summer Bible Camps. I now think I could confidently deal with most causes of Landrover breakdown. Certainly, life on the road was never dull. And each trip we made, we prayed and thanked the Lord as we arrived safely at our destination. I would advise anyone, that if you can visit Kenya with Kindfund…then go for it. It will change your life for the better. Chased some cockroaches…learned a little Swahili…were blessed by our visit to Kenya! There was a sea of excited faces to greet us on our arrival at the Kindfund children’s home in Ngaremara on the evening of Sunday 7 July; and straightaway that night we had a fellowship time where the children sang a wonderful welcome! It had been a long journey, leaving Dublin the previous morning and travelling to Nairobi via Abu Dhabi. There we were met by Josef the taxi driver, and as he expertly navigated the potholes we sat back and adjusted to being ‘on the ground’ in Kenya. We had plenty of time as we headed north, crossing the Equator; the journey was going to take five hours! But after a day to catch our breath, we headed north to spend a full week in Wamba children’s home before returning to Ngaremara for week two. The real highlight was getting to meet the children! There are so many sad stories and many difficult backgrounds to comprehend, but the lasting impression you get when you spend time in the homes is that you are surrounded by happy children who are learning to walk with Jesus. 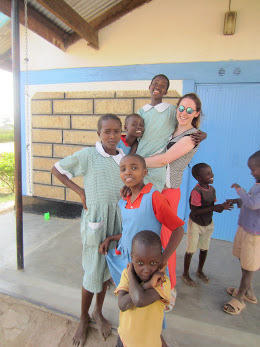 We devoted a lot of our time to simply playing with the children; we learned a little Swahili (enough to count up to twenty at any rate); we each got our hair plaited (they even had a go at Alastair’s! ); we sang songs with them (though they sing a lot better than we ever will); we took studies and the children would often ask for torches so that they could continue working after dark. It was such a blessing to see the difference that Kindfund is making in the lives of these youngsters. There were a few things in Kenya that took a bit of getting used to. Like the daily shower with two temperature settings – cold and colder. There were cockroaches of course, which the children could catch and put out in an instant, while Karen and Ros appeared to think that screaming would help. Why?! Mercifully the only snake we came across was a dead one; it seems that the four foot adder kindly waited until we had left before visiting Ngaremara! But the journey to Wamba took us through the Samburu Nature Reserve where we got to see elephants, giraffes, monkeys, baboons, dik dik, ostrich, gazelles, zebras, camels, crocodiles, vultures, weaver birds, warthogs, gerenuk…and squirrels too! We were introduced to the bride at a traditional Turkana wedding, then ushered into the food tent where the women were skinning a cow. While the women worked, the men danced! And we’ll never forget Sunday morning worship in Ngaremara…the children sang and danced in a two hour praise party! If you ever have the opportunity to visit Kenya…make sure you do. It is an amazing country and the memories will be with you forever! Thanks to discussions with Joseph, the head of the Water Service at Laisamis, we were able to arrange for the delivery of 16,000 litres of clean drinking water to our children’s home at Ndikir village NW of Laisamis. 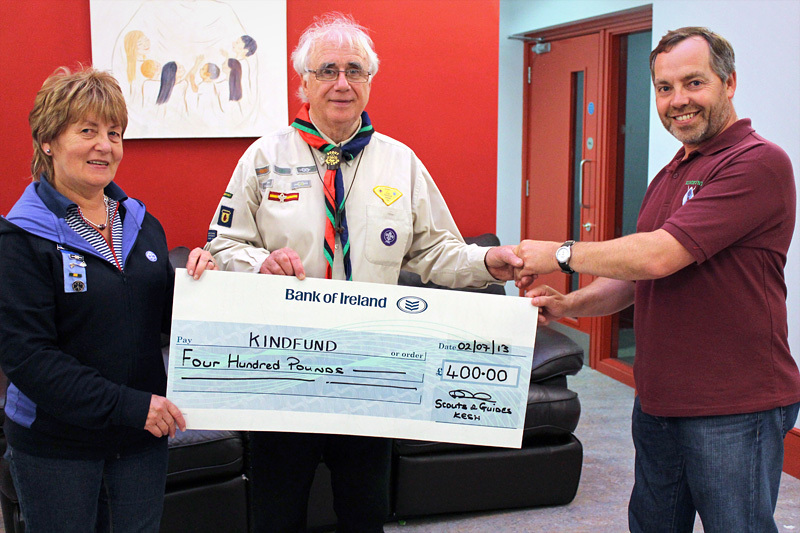 Scouts and Guides from Kesh in County Fermanagh raised £400 for Kindfund by filling Smartie tubes with coins. Thanks to all of them for their generous giving! We arrived safely at Nanyuki yesterday at 10am via Dublin, Amsterdam and Nairobi. Today we shop and shortly will travel to Ngaremara to meet the children. Thank you for your support. The journey was good and everything ran on time. 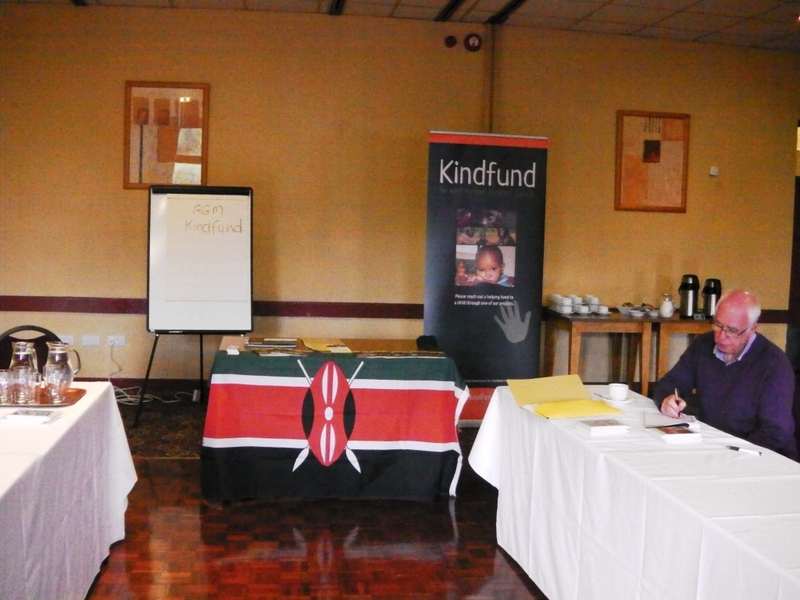 The Annual General Meeting of Kindfund was held on Fri 7th June. The Financial Statement for 2013 along with the Treasurer’s and Chairman’s reports on the year were presented (these may be downloaded from our Governance page). 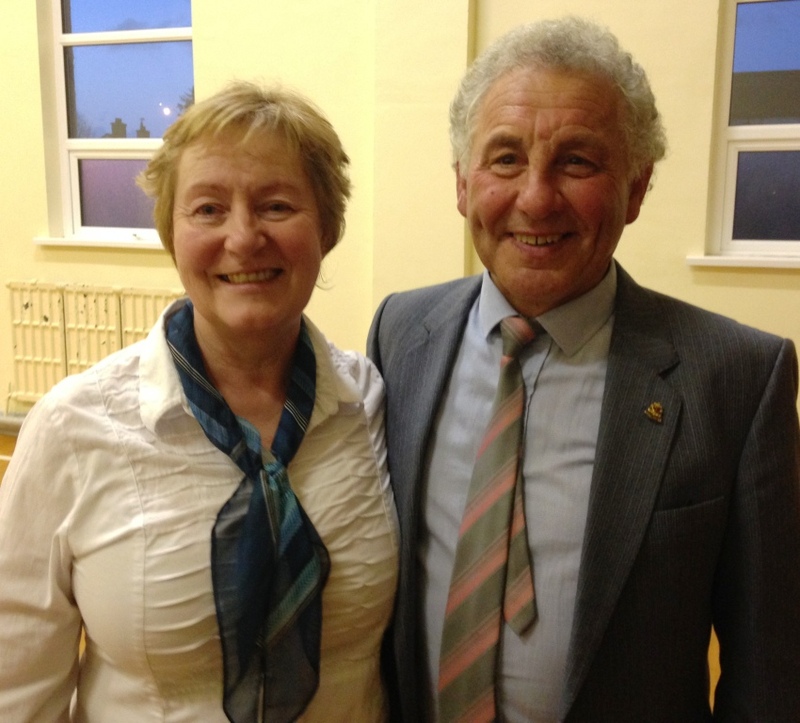 The existing Committee was re-elected and new Committee members elected are Maurice Lee and Paul and Gloria Dickson. 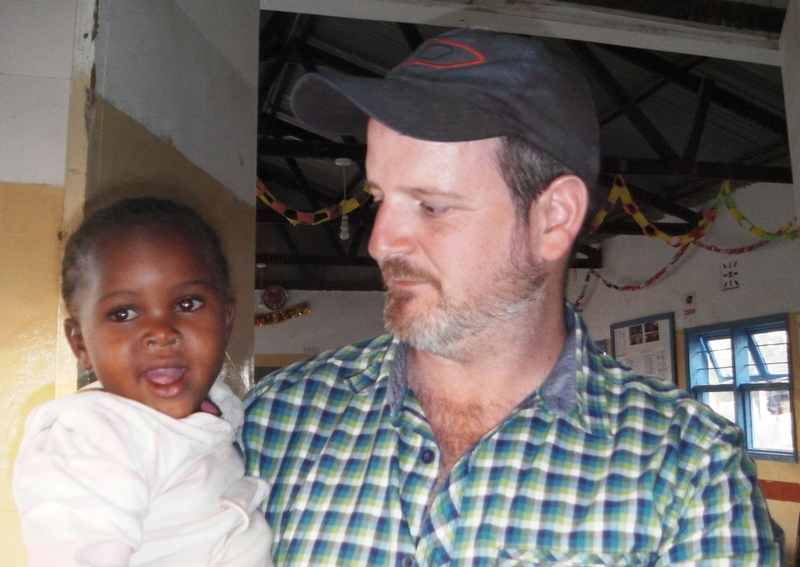 Paul will be visiting Kindfund Kenya for 7 weeks from July to early September this year. 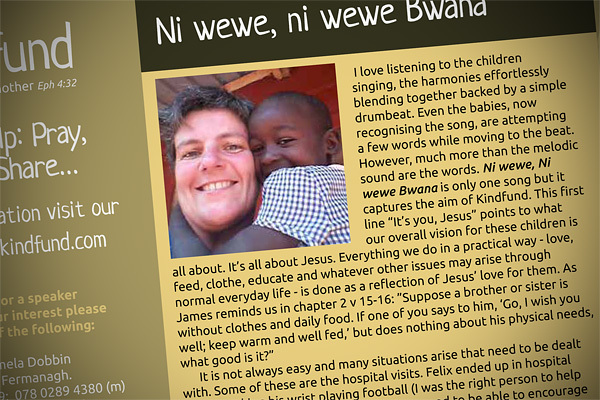 Margaret – housemother at our Wamba children’s home – is much improved. Margaret has been with us since the beginning in Wamba in 2006, and is one of our anchor staff at the home where she is housemother on night duty. She is greatly loved by the children. Thank you for your support in prayer. 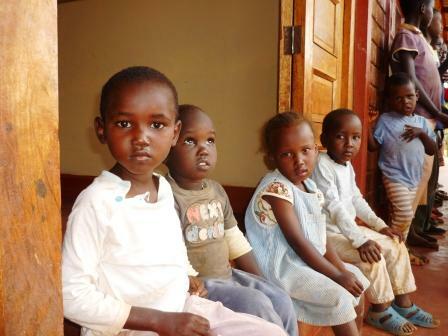 Four of our Rendille children have been affected by malaria. As usual at the end of the rains, malaria has become prevalent. It can be very dangerous, particularly for children. 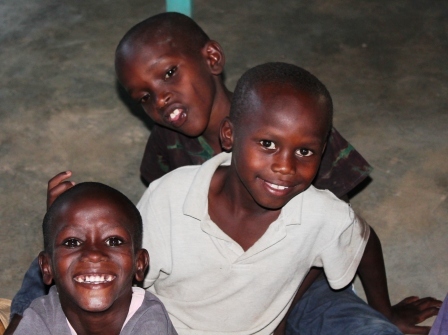 Four of the young ones in our home at Ndikir have contracted malaria, though they are now on the mend. 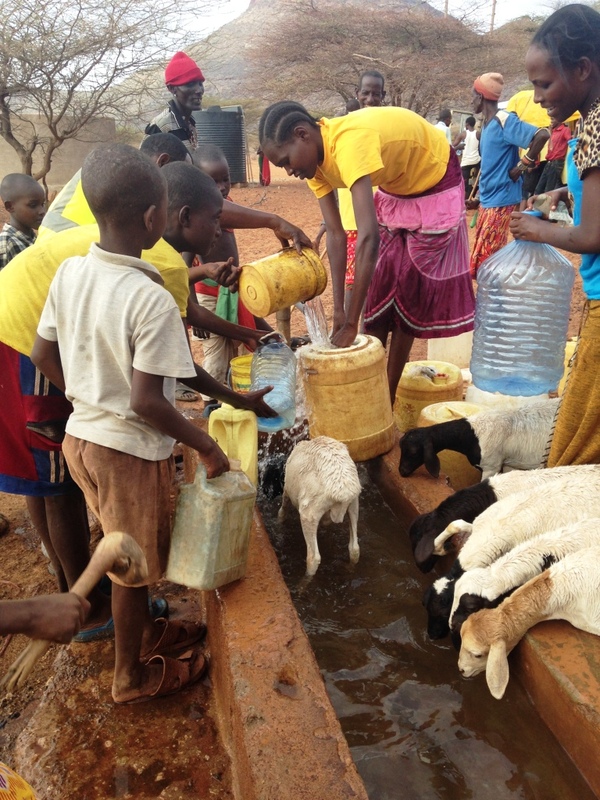 And now that the dry season is upon them, the people in the village are again struggling with water shortages. The urgent request from the Child Officer at Marallel to admit a 10 yr old girl with HIV to our Wamba Home was completed today when the girl arrived. We now have 9 children suffering from this virus at Wamba. Our young maintenance man J has been discharged after 6 weeks in hospital. He has a broken and infected achilles tendon. He will wear plaster for at least another 4 weeks. There has been confusion within the National Hospital Fund where monthly contributions have been posted to the wrong account. The issue has been causing us problems when a staff member is admitted to hospital. We have been trying to get resolution for 6 months. Dominic visited them in April to try to reach a resolution. This article appeared in the Belfast Newsletter in April 2013, in the first of the paper’s ‘Faith Focus’ series. 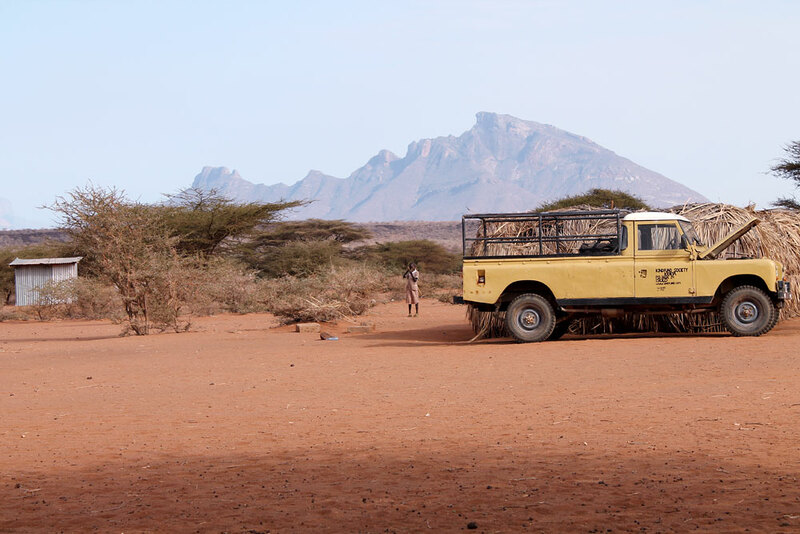 In the first instalment of our new series Faith Focus, we meet two people involved in important work in the region of Northern Kenya – Ken and Pamela Dobbin from Kindfund. 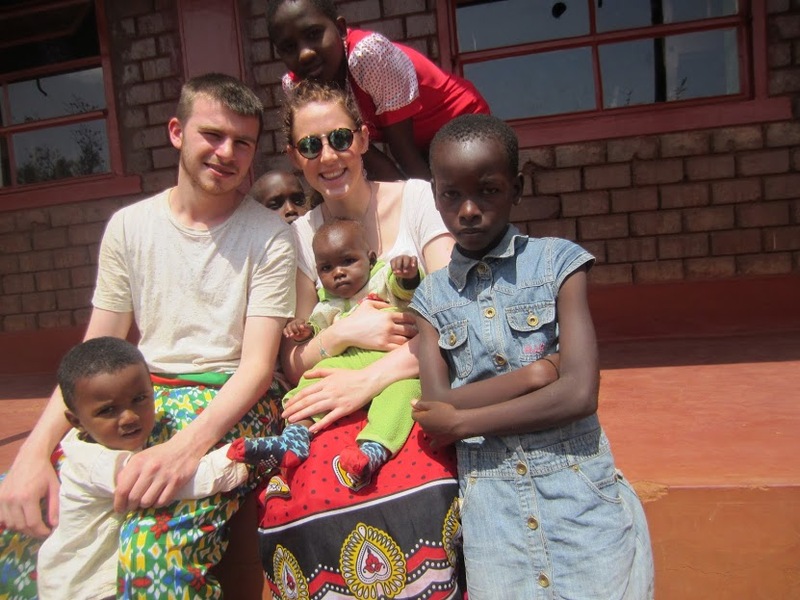 For County Fermanagh man Ken Dobbin, running charity KINDFUND and helping impoverished children living in Africa feels like his “most important career” to date. 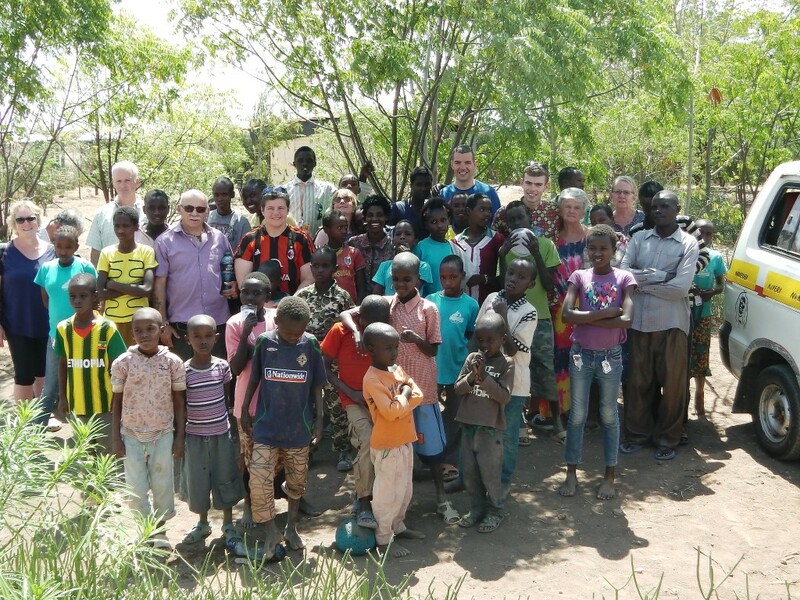 The 68-year-old who lived in Bangor for more than 30 years, but now based in Kesh with wife Pamela, set up the charity in 2004, after being approached by a pastor in Africa they had previously worked with, when the couple were involved with another Belfast-based charity. 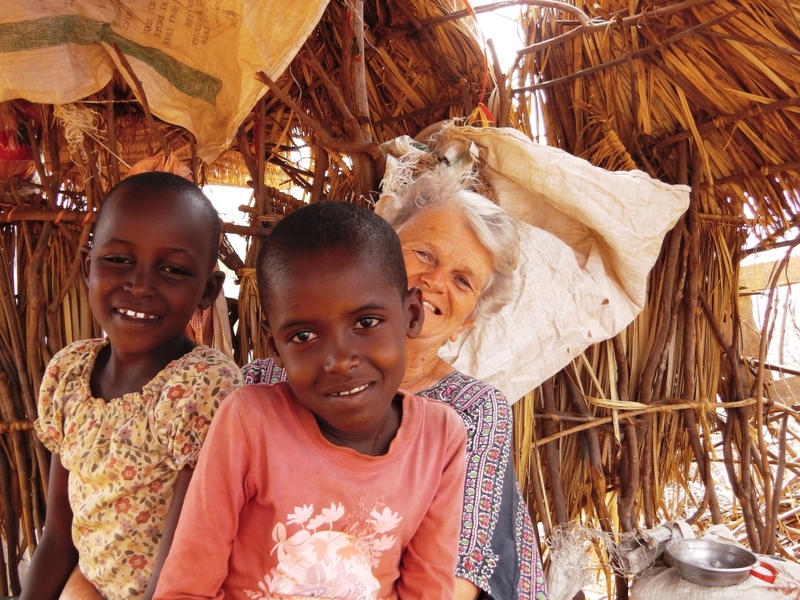 “He had started a small nursery and wanted to do something for orphans, so we went out, visited him, and stayed in his mud hut with him for the best part of three weeks”, recalls Ken, who at that stage in his life was just approaching retirement. Kindfund was thus born, and since then, it has grown to support around 1,500 people living in remote areas of the country through children’s homes – three have been established in the last nine years – schools, education and water projects. It describes itself on its Facebook page as “a Christian Charity seeking to serve orphans and poor among the Turkana, Samburu and Rendille pastoralist tribes of Northern Kenya”. 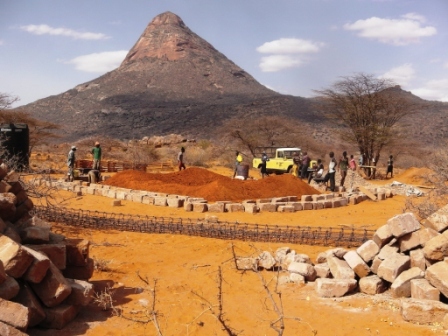 Indeed, through these projects, its volunteers (none of whom are paid – all work is voluntary) are expressing God’s love and kindness amongst some of the most remote and poorest pastoralist tribes in this arid land. 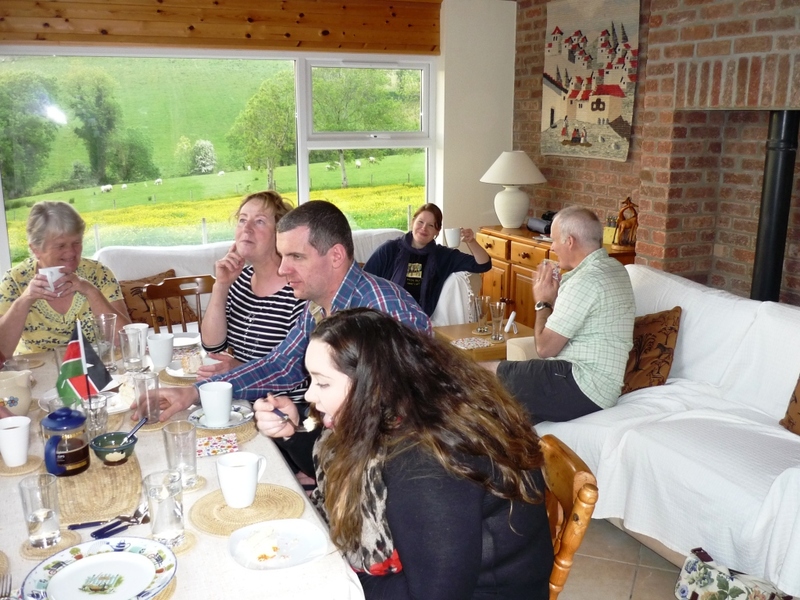 Ken and Pamela both attend St Mary’s Church of Ireland, Ardess, Kesh, and by Ken’s own admission, have plenty of experience of “roughing it” during various camping trips across Europe with their three sons. He says that when the opportunity arose to set up their own charity and get more heavily involved in missionary work, it represented to them a chance not to be missed. Having put roots down, Kindfund began its work…. Ken and Pamela identified builders and found a building that they would like their own to imitate, and on the day that they left in October 2004 work on the nursery had started. It was complete by that December. 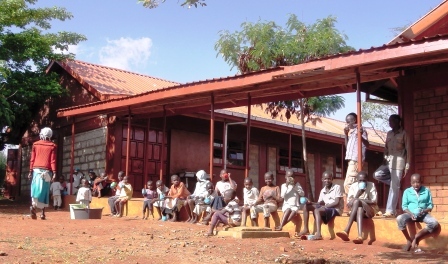 From there, the work of the charity spiralled and more little children were helped, fed and educated, including youngsters who had HIV, and three ‘Rendille babies’ (the Rendilles are a tribe of people who live in the north of Kenya and have their own set of cultural and religious beliefs). Today, Kindfund volunteers – who are based in the UK and Ireland – distribute five tonnes of food to the area every month and lift as much as £100,000 a year, all of which is sent out to their homes and schools. Anyone travelling out to Kenya on behalf of the charity raises sponsorship and pays their own airfare; Ken alone is out about three times a year and Pamela, twice. There is a sponsorship fund through which around 200 children are sponsored, and some of the sponsors have been out to see the kids. 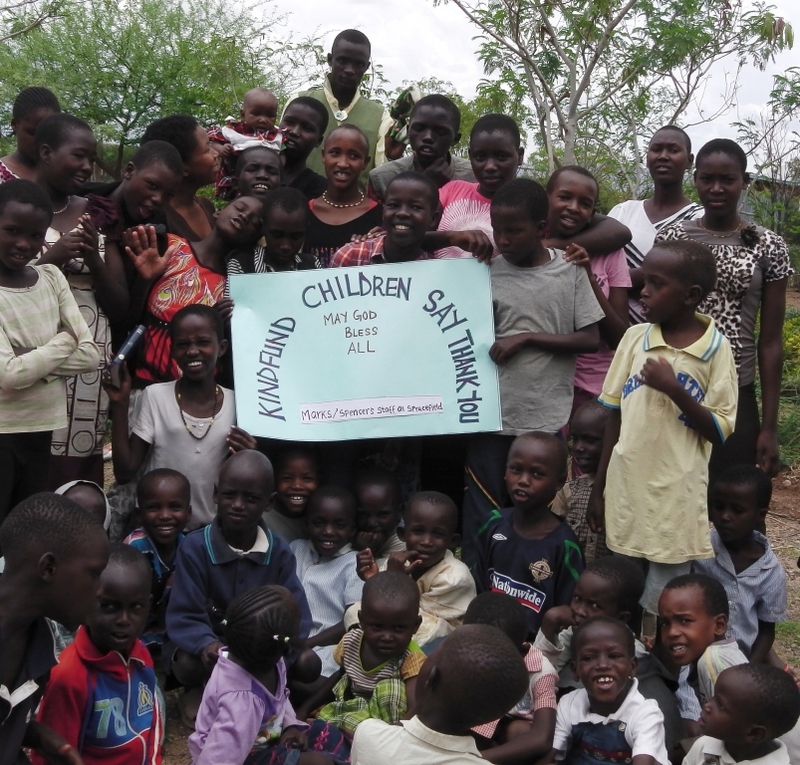 As Ken says, they know all the children they have helped personally. The couple are doing and overseeing such wonderful work, but it is a labour of love. “God has put a love in our hearts so we are doing what He wants us to do and it doesn’t seem like work” says Pamela.